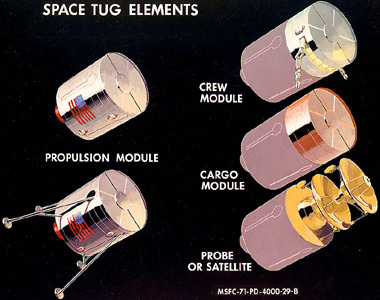 A space tug is a tiny spacecraft with over-sized engines and some means of grappling another spacecraft. If the tug pushes its cargo,it will have a massive push plate on its bow, with a core of structural members to transmit the thrust of its engines to the push plate. If the tug pulls its cargo, it will have cables and winches on its stern, and the engines will be vectored to fire backwards at an angle so it does not torch the ship it is dragging. The engines will suffer a reduction thrust penality proportional to the cosine of the engine angle. Note that if nuclear propulsion spacecraft are involved, the tugs and the spacecraft will generally be designed to dock bow to bow. Otherwise you will be exposing the other ship to the radiation from your engine. 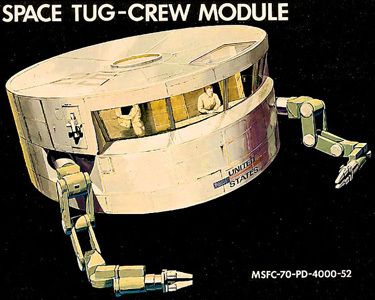 According to the Technovelgy site, the term "space tug" was invented in 1942 by Eric Frank Russell in his short story "Describe a Circle"
"Conn, tug Brutus requests permission to dock." "Permission granted. Close the fuel valves." As New Jersey shut down her main engine, the powder blue UN tug approached on thrusters. Fitzthomas watched on external cameras, never liking it when his ship was in others' hands, but powerless to do anything about it. The traffic rules within 100 k-klicks of Hektor were as plain and draconian as those of LEO: no unauthorized burns, and no open cycle nuclear reactors in operation under any circumstances. And the UN tug drivers were pretty good. "Conn, Brutus is making her final approach. Docking in one minute." "XO (executive officer), signal all hands." "Aye sir." A moment later, Allen's voice came over the shipwide intercom. "All hands, prepare for ship to ship dock." He switched back to his private channel to the captain. "Let's hope whatever blue hat is driving that donkey cart knows how to actually fly a spaceship." As it turned out, he could. Brutus and New Jersey touched nose to nose at barely a meter per second. 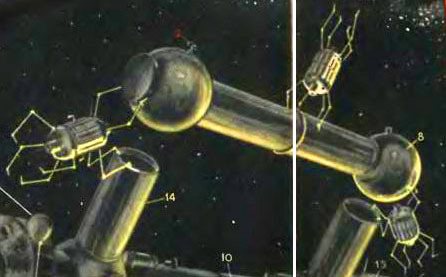 Heavy duty docking latches locked the ships together, and Brutus extended a fiber optic probe into a receptacle inside New Jersey's docking ring. "Conn, we have hard dock with Brutus. They are requesting propulsion access." Fitzthomas removed a hard blue plastic key from his extensive key ring and inserted it into a blue lock. "Transferring propulsion access on my mark....mark." He turned the key and the clear plastic ring around the lock lit up blue. Brutus's pilot now had control over New Jersey's maneuvering thrusters. For the duration of the ride, Fitzthomas's hand would hover over the key, ready to cut Brutus out of the system, just in case. Brutus's pilot could now also see what New Jersey's docking radar and aft cameras saw, a necessity since the bulk of the frigate would block the tug's line of sight—visual or otherwise—while they maneuvered. 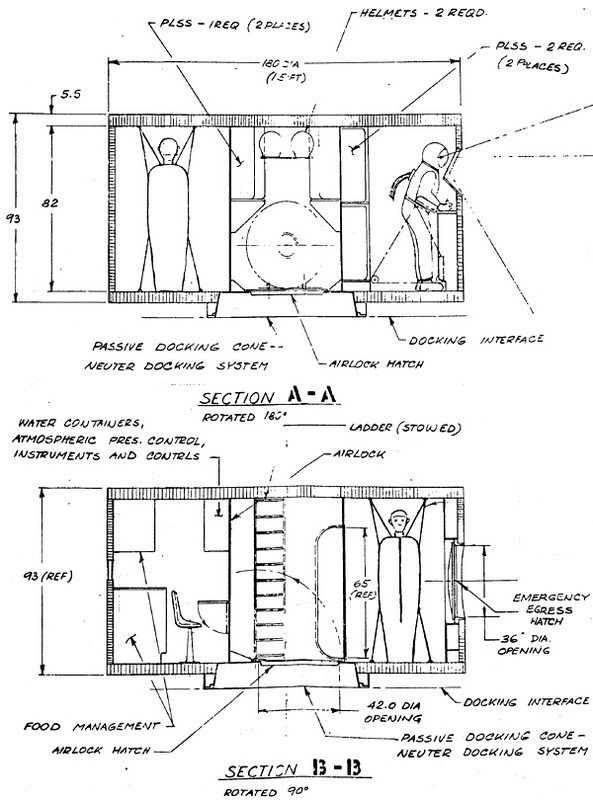 Brutus was little more than a nuclear engine (closed cycle, which meant no reactant could escape with the exhaust, at the cost of about half the ship's specific impulse, which didn't matter for a short range, low speed tugboat) with a sturdy docking ring and a cockpit jammed in between. In some operations, the tug was unmanned and guided by computer or radio control operator until it docked with the target ship, and then the tug would relinquish control of its systems to the target ship's pilot, or a harbor pilot brought on board for the purpose, saving some of the mass of reactor shielding for the cockpit and some of the ulcers for shipmasters, but the UN insisted on doing things the old fashioned way. Fitzthomas had heard of tugs which did the entire trip by remote control or onboard computer, but he'd rot in hell before he let some toe-picker play model airplane with his spaceship, and the United States Space Guard agreed. New Jersey's thrusters fired, heeling the ship around 180 degrees, so that her bow, with the tug latched on, faced Hektor. Brutus then fired her main engine, continuing the deceleration burn New Jersey had started. Fitzthomas felt himself lift ever so slightly out of his chair. His ship's decks were aligned so "down" when they were under thrust was towards her main engine. With Brutus docked with her nose and her thruster pointing the other way, "down" was now, temporarily, in the direction of the overhead. One more thing for Fitzthomas not to like about the tugboat. "Approaching Hammarskjöld docks. Ten minutes to docking." 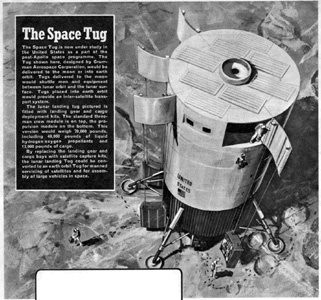 The Boeing Space Tug is a modular design. 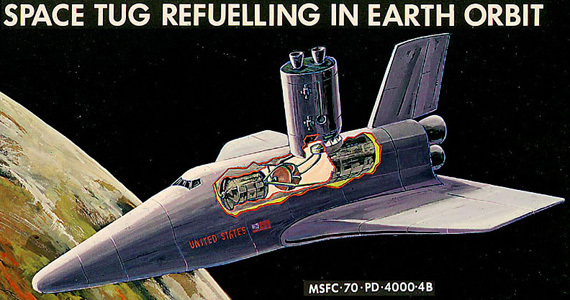 This concept was later developed into the NASA Space Tug. 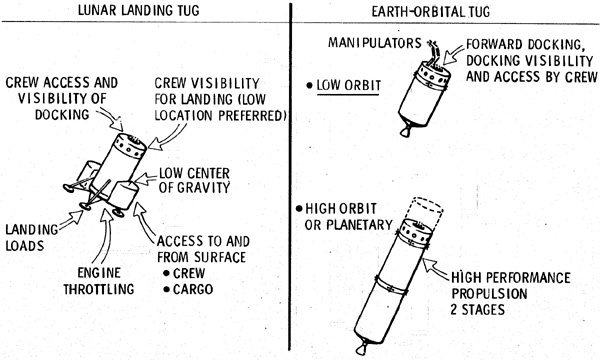 One way to tell the difference is that the Boeing tug's crew and cargo modules were spherical, while the NASA tug's modules were cylindrical. The information presented here is primarily from the Boeing Company Aerospace Group report Pre-Phase A Technical Study For Use Of Sat V, Int 21 & Other Sat V Derivatives To Determine An Optimum Fourth Stage (Space Tug). Specifically from Volume I Book III, and Volume II. Note how the RCS clusters around the waist are inset into the hull. All modules have to fit into a space shuttle cargo bay, the RSC clusters cannot stick out. 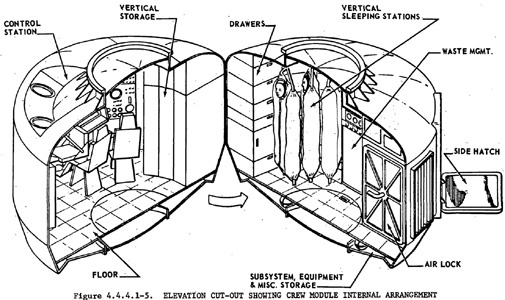 Modules were designed to fit in Space Shuttle cargo bay. Study assumes a space shuttle payload capacity of 24,500 kilograms delivered to an 180 kilometer orbit at a 28.5° inclination. 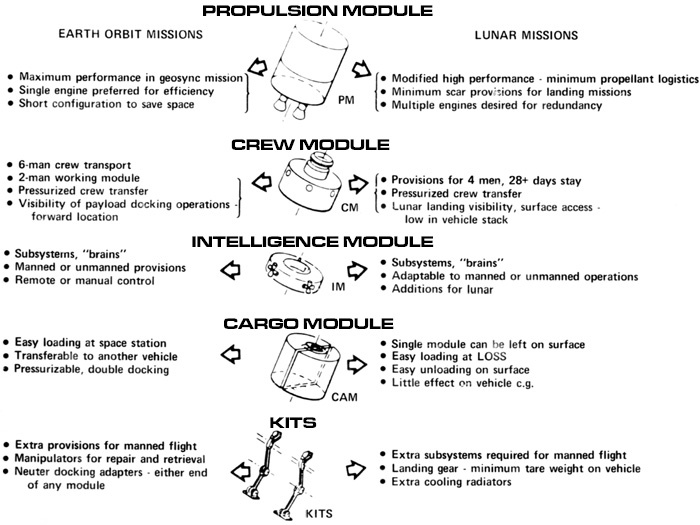 Modules are rated to be safely re-used a limited number of times, e.g., the crew module is rated for 10 lunar landings or 100 orbital missions. These are listed with the modules. After each mission all modules need to be refurbished. This is assumed to cost 3% of the module's first unit cost. 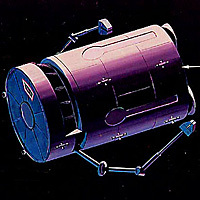 After the final use, module can be refurbished to be used once more on an expendable mission. Refurbishment is done in space, unless the tug has exceeded one year of operations in space or is to be used in an expendable mission. 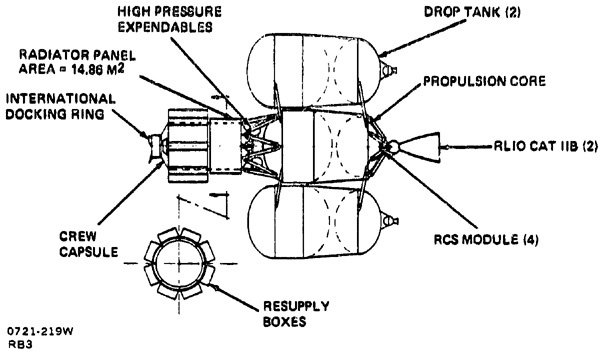 The micrometeoroid and thermal shields are sized for a 14 day orbital mission. 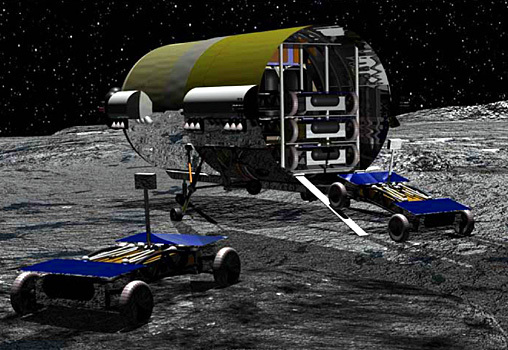 Their mass will have to be increased for a 50 day lunar mission, reducing the payload capacity. 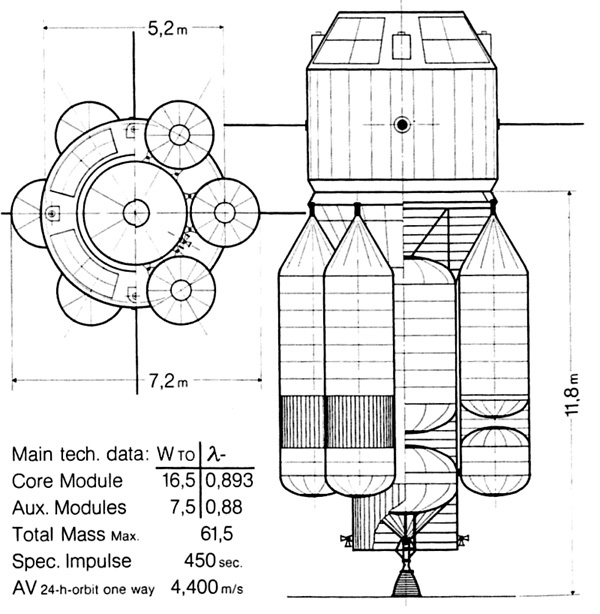 Medium propulsion module will easily fit in shuttle cargo bay, but if it is loaded with propellant and mated with an astrionics module, it is very close to the shuttle's mass carrying limit. 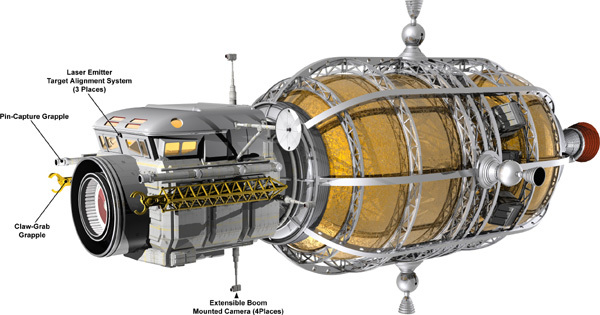 Large propulsion module will barely fit in space shuttle cargo bay, but if it is loaded with propellant it will exceed the shuttle's mass carrying limit. Note how the RCS clusters are inset into the hull. If the clusters were on the hull surface, the propulsion module would not fit into the space shuttle cargo bay. 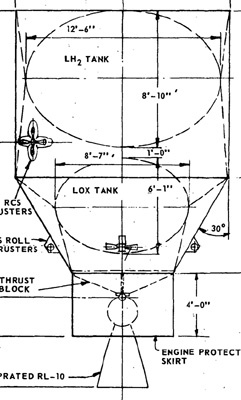 Drop tanks are basically propulsion modules with no engines and thrust frames. They are dropped at LEO or GEO orbit along with the payload. Super insulation, radiators, louvers, panels, fluids, pump heat exchanger, accumulator. Crewmembers, bunks, seats, food, medical, clothing, hygiene, EVA suits, suit PLSS backpacks. Batteries, regulators, junction boxes, wires, cables, power distributer. 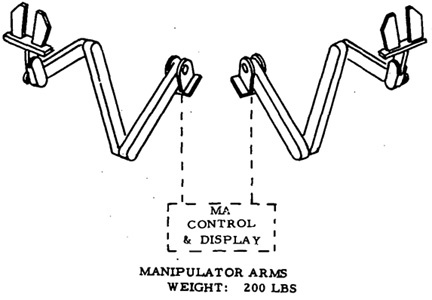 Manipulator arms display and controls, maintenance equipment, etc. RCS propellant, fuel cell reactants, etc. 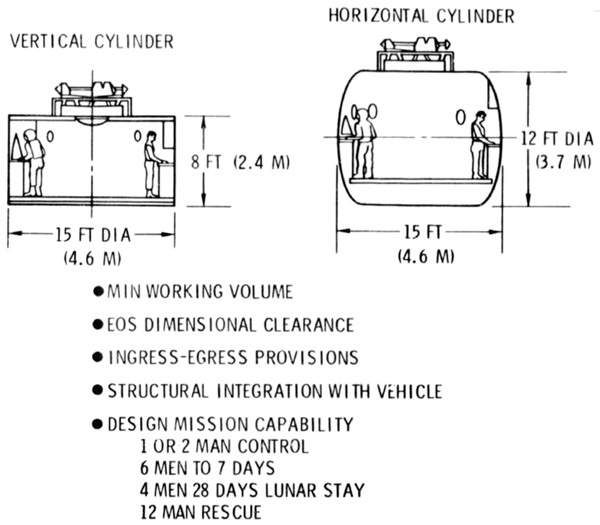 The crew module is rated for 10 uses in a lunar landing mission, and 100 uses for LEO or GEO missions. The astrionics module is 4.3 meters across and 1.2 meters high. 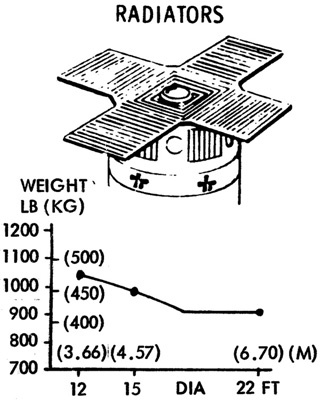 Mass varies from 857 kg to 1503 kg, depending on mission (see image below). 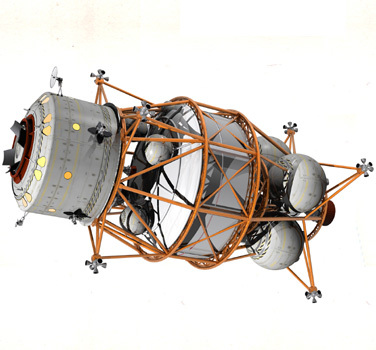 The structure is octagonal with eight load bearing columns for transfer of the loads between the propulsion module and that portion of the Space Tug above the astrionics module. 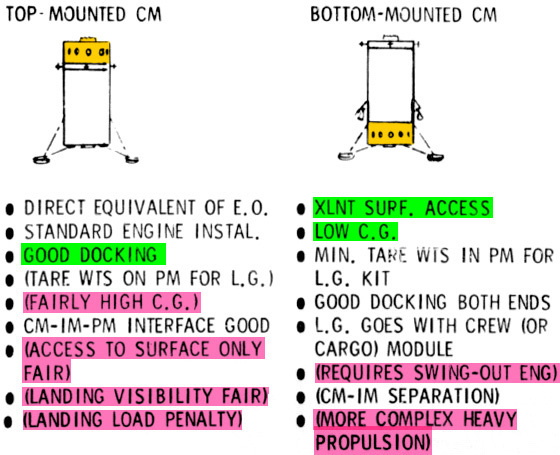 The systems listed on the bottom of the figure are mounted on the eight component mounting panels. These panels are accessible from both the inside and outside of the astrionics module. Radiator/louver doors provide thermal control as well as cover and protect the component mounting panels. 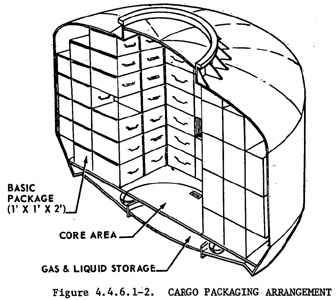 Cargo modules are used to carry multiple low volume packages. If the cargo is in one large single piece (e.g., a satellite), it does not need no steeking cargo module. Instead it will be designed to withstand the mission environment, equipped with a payload adaptor, and attached bare naked to the payload adaptor on the nose of the space tug. Cargo modules come in two types: Round and Doughnut. 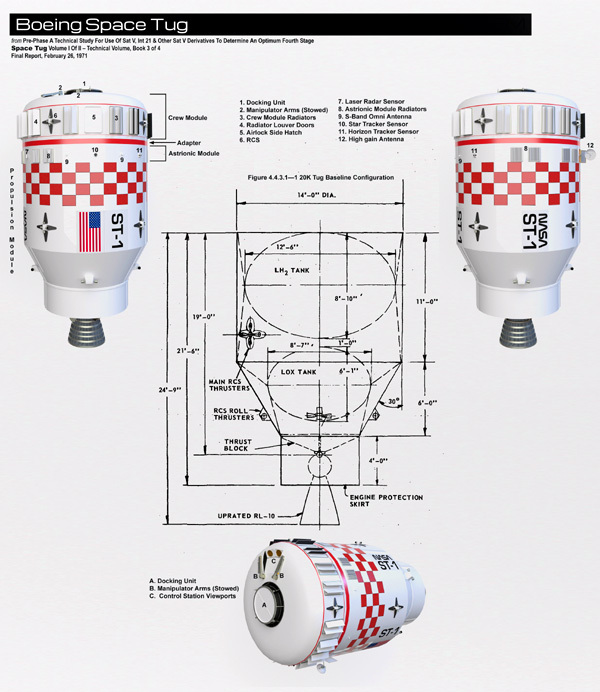 Round are mounted on the top of tug while doughnut are mounted at the bottom (encircling the rocket engine). 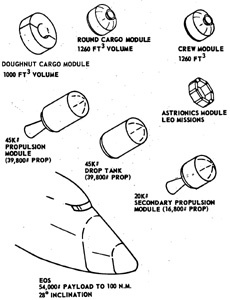 Round are used for orbital missions and doughnut are used for lunar landing missions. 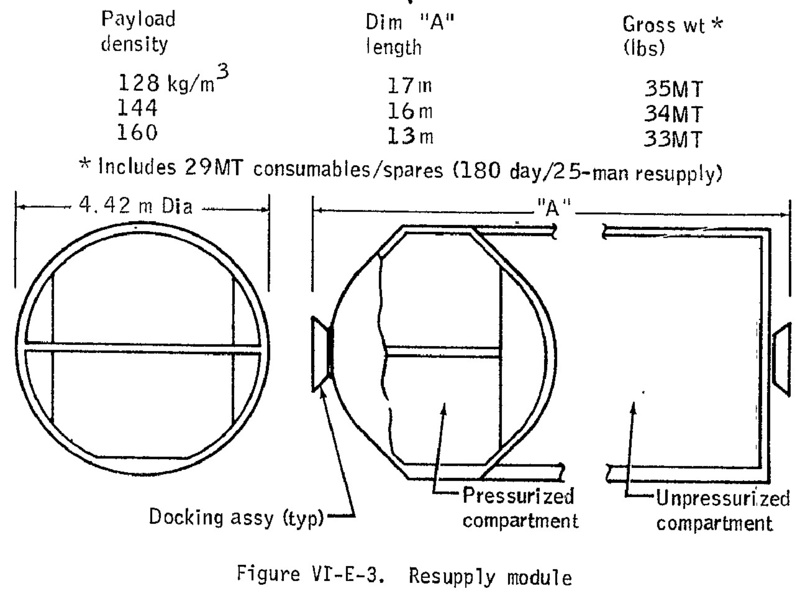 This is because it is almost impossible to lower the round module's cargo 13+ meters down to the lunar surface. 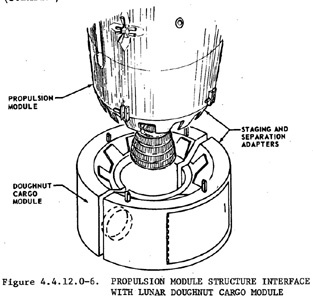 The doughnut cargo module will be about 1.5 meters from the lunar surface. 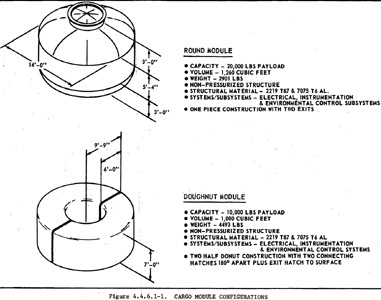 Round module is one piece constrution with two exits. 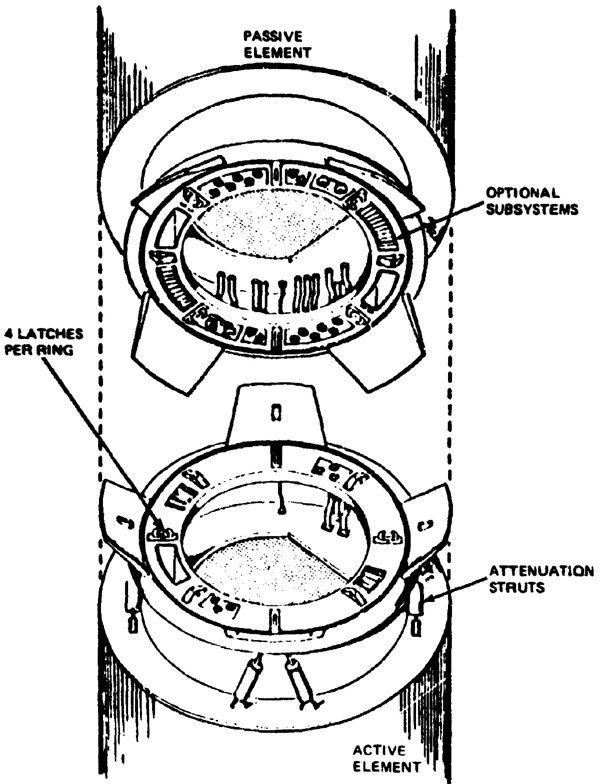 Doughnut module is two half doughnut construction with two connecting hatches 180° apart plus exit hatch to surface. This is because the assembled doughnut is too big to fit in the space shuttle cargo bay, so it was split in two. Cargo modules are rated for 100 uses. 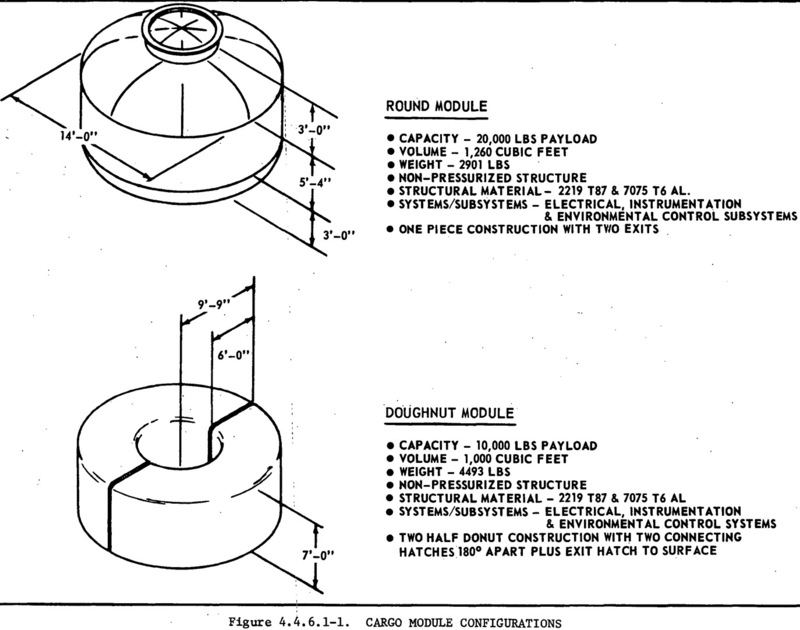 Round modules are basically hollow crew modules. They have a cargo capacity of 9,072 kg and a volume of 36 m3. The empty module has a mass of 1,316 kg. Only those minimum electrical, instrumentation, and environmental control systems as required to maintain the cargo are provided. The cargo modules will be provided with racks arid other bracketry to house the small packages which are envisioned for delivery as cargo to the space station or to low earth orbit. Packages are 0.3m × 0.3m × 0.6m. 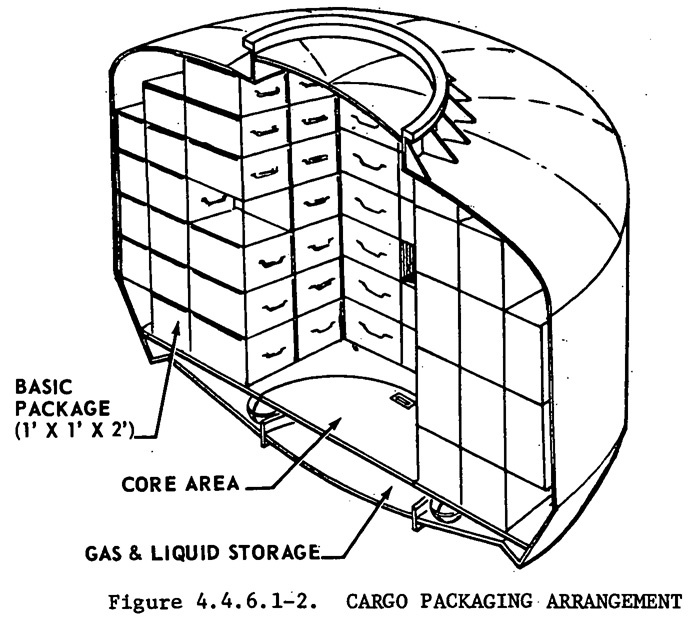 Liquids will be housed in the lower ellipsoidal section of the cargo module. 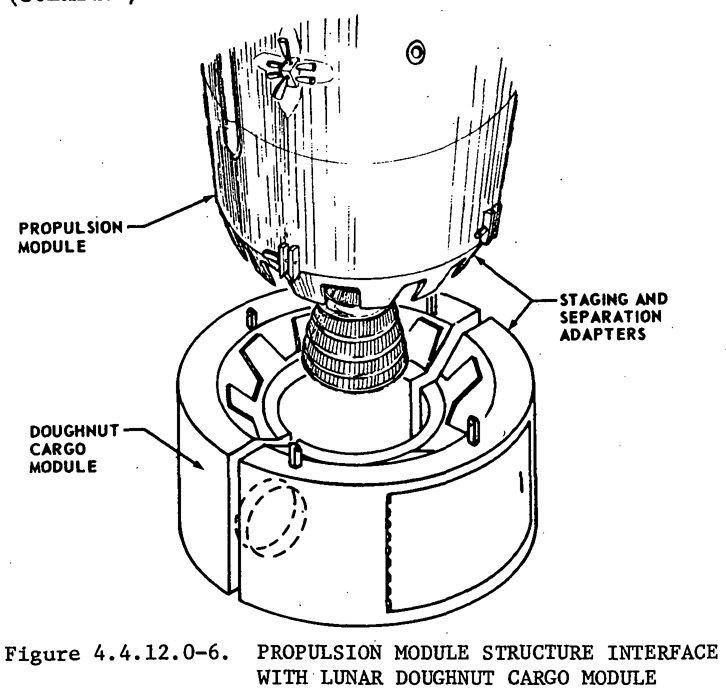 As previously mentioned, the doughnut module is for lunar landing missions. The idea is to get the module as close to the lunar surface as possible, to aid unloading (1.5 m from the lunar surface, instead of 13 m). This means it needs a doughnut hole in the middle to accommodate the rocket engine. 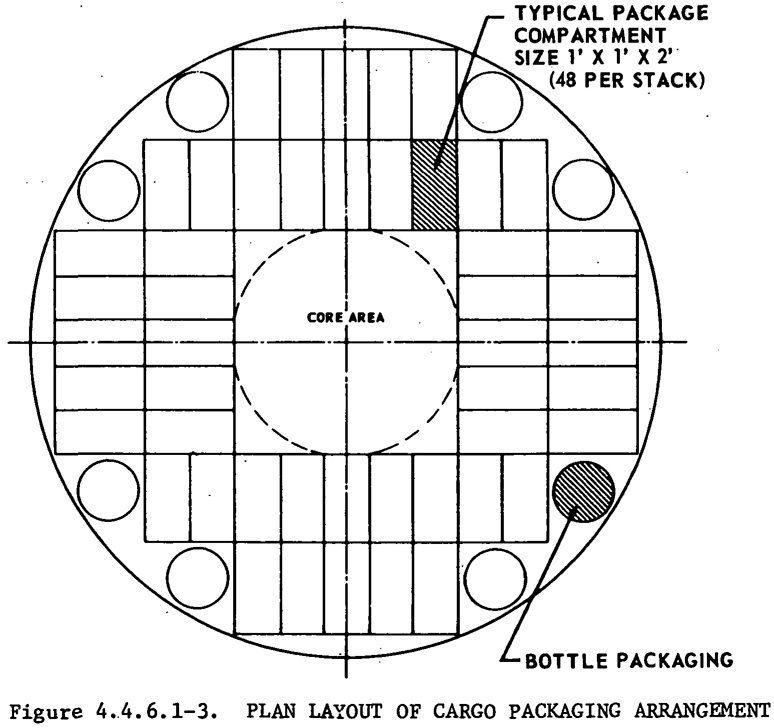 Given the cargo requirements, the module will have a diameter too large to fit in the space shuttle's cargo bay. So the module is split into two section. 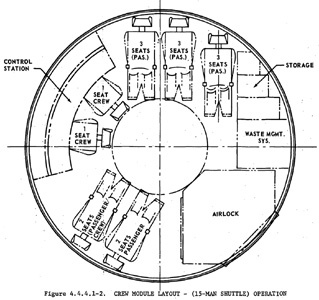 The doughnut module has a cargo capacity of 4,536 kg and 28 m3. 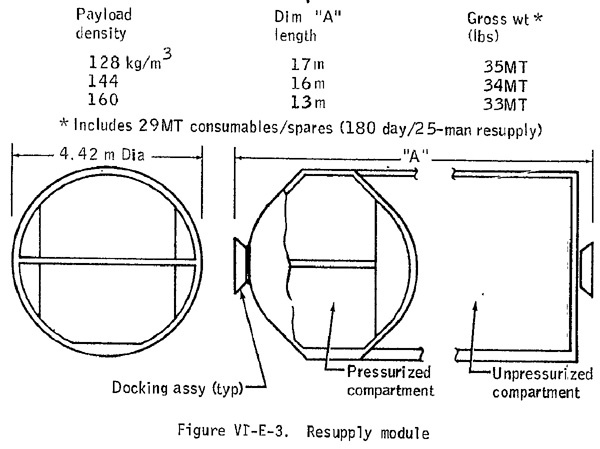 The empty module mass is 2,038 kg, larger than the round module due to being split into two sections. 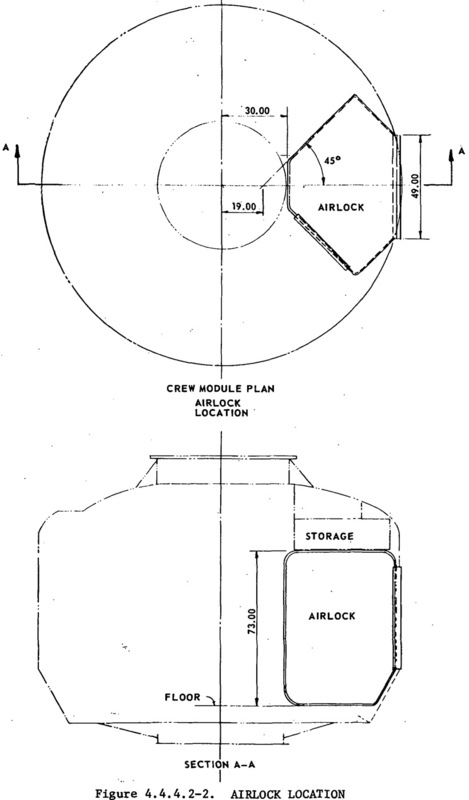 Doughnut module is at the bottom, encircling the engine. The basic astrionics module will be designed to accomplish low earth missions. To accomplish other missions, it will be necessary to provide additional astrionics capability. Plug-in astrionics will provide this capability. The kits will consist of additional (1) data management systems, (2) guidance, navigation and control systems, (3) command and control systems, (4) electrical power systems and (5) electrical networks. The additional masses are shown in this figure. 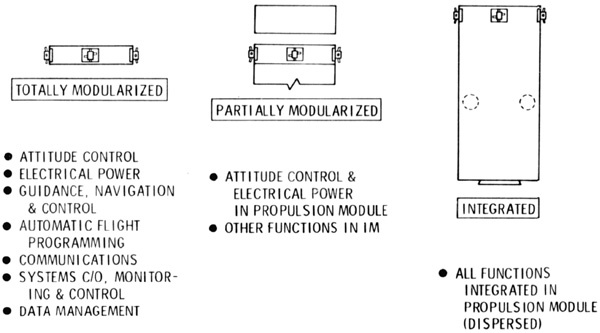 For the lunar missions, the power requirements for the lunar experiments will exceed the capability of the standard power supply for the Tug. An auxiliary power kit will make up the deficit. This kit will consist of a two kilowatt fuel cell, supporting tankage, lines, valves, fuel, etc. For lunar missions, the power kit will be installed inside the doughnut cargo module, for easy access while on the lunar surface. 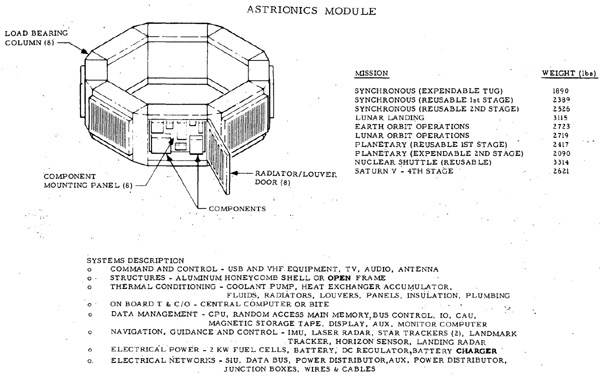 For quiescent mode operations (mothballing) it will be installed in the center of the astrionics module. 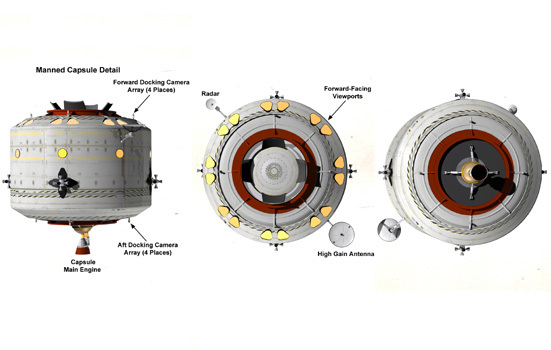 Clustering adapters will be required for the large payload synchronous missions where more than one propulsion module is required for each stage. 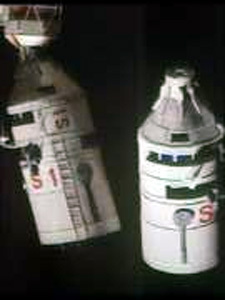 Clustering adaptors connect propulsion modules side-by-side instead of one-on-top-of-another as do staging adapters. Docking Adaptors and Payload Adaptors are basically the same unit. They are called "docking" for crewed tugs and "payload" for uncrewed tugs. As payload adaptors they are used to mount a monolithic playload (i.e., not suited for a cargo module) atop the astrionics or crew module. Docking adaptors are rated for 100 uses. Environmental protection kits are additional micrometeoroid shielding. 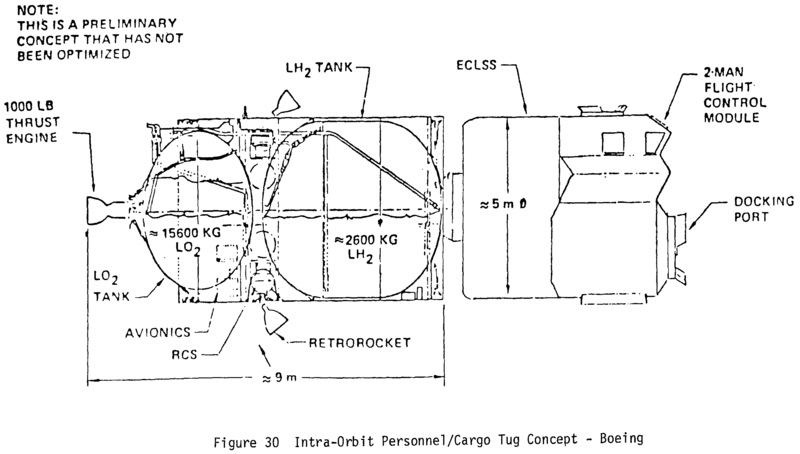 The basic Space Tug configuration will be designed to accomplish the low earth orbit and/or synchronous missions. For the accomplishment of longer duration missions, environmental protection kits will be provided which will provide further micrometeoroid protection capability. These allow the tug to land on Luna without toppling over. 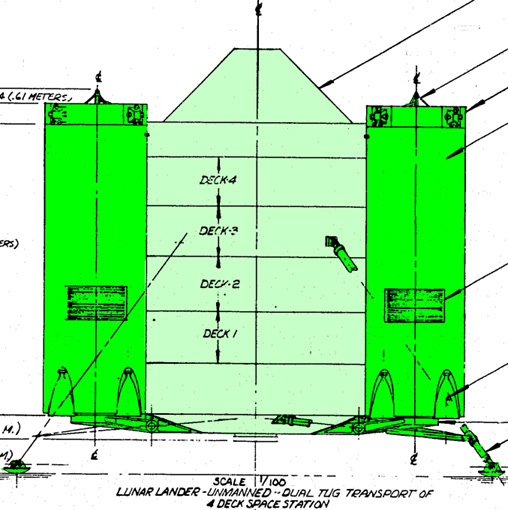 A space tug assembled for lunar landing missions is assumed to have a height of about 15.2 m. This height requires the landing legs to extend 9.1 m from the center of the tug to ensure stability. 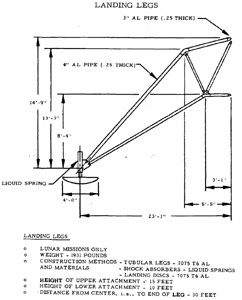 A landing leg kit has four landing legs, 90° apart, of tubular construction. The legs would be fabricated from Aluminum 7075-T6, with shock absorber system consisting of liquid springs and landing discs to absorb shock and to act as leveling mechanisms. 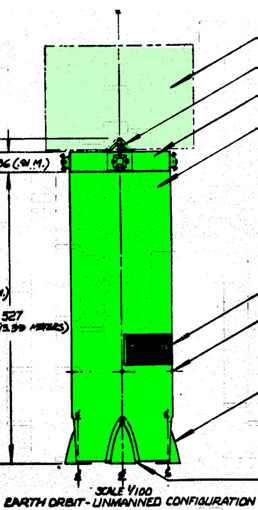 The upper attachment point for the landing legs is approximately 4.6m off the ground at the mid point of the LOX tank. 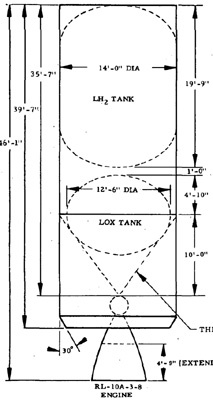 The lower intersection point is approximately even with the lower part of the LOX tank. Landing legs are rated for 10 uses. The technical term is "waldoes". These are mounted on special fittings on the crew module. Displays and controls are installed in the crew control room. For the lunar landing mission, the basic laser system will not provide the necessary identification of the landing terrain due to the dust and other visibility inhibiting environmental effects. The radar kit will provide the visibility necessary for the accomplishment of the landing. 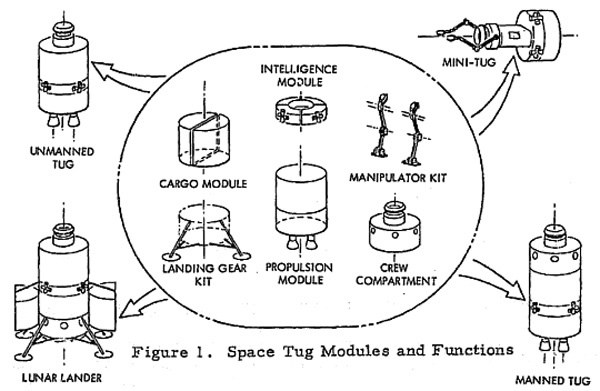 The basic Space Tug configuration is designed to operate in low earth or synchronous orbits. 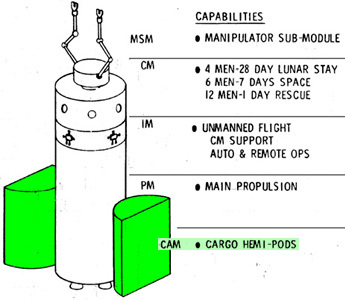 An RCS booster kit will be required to provide additional maneuvering capability during some of the Space Tug's more complex missions (i.e., lunar landing). This is to assemble a multi-stage vehicle. 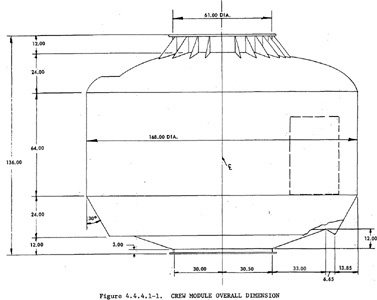 For a "stage-and-one-half" vehicle, you use the SASM to mount a drop tank on top of the tug, to increase the available propellant. 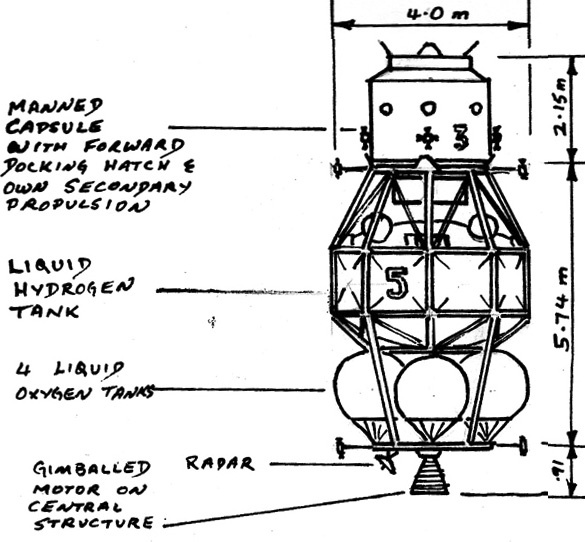 Usually the monolithic payload is mounted on top of the drop tank using a payload adaptor. 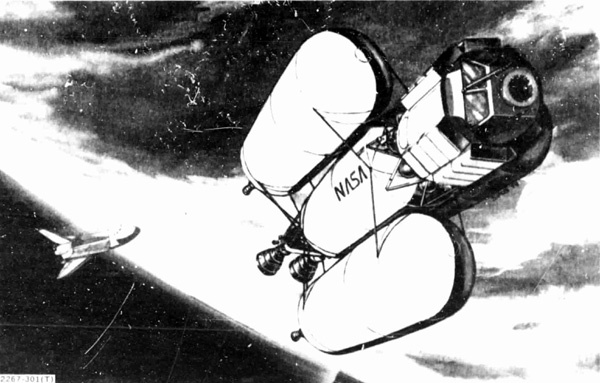 When the tug reaches the specified orbit, both the payload (satellite) and the drop tank are dropped off. For a full multistage vehicle, you use the SASM to mount an entire second vehicle on top of the first. 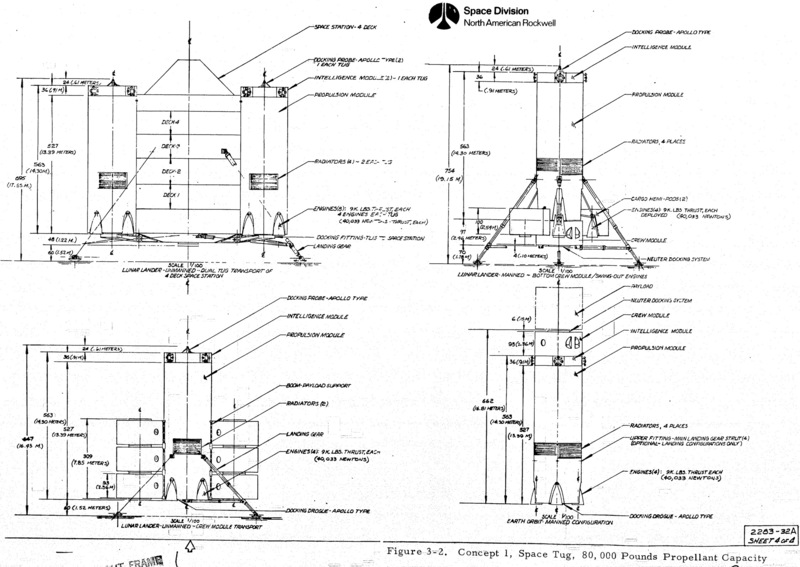 When the lower stage exhausts its propellant, the SASM provides separation, and the upper stage ignites its rocket. 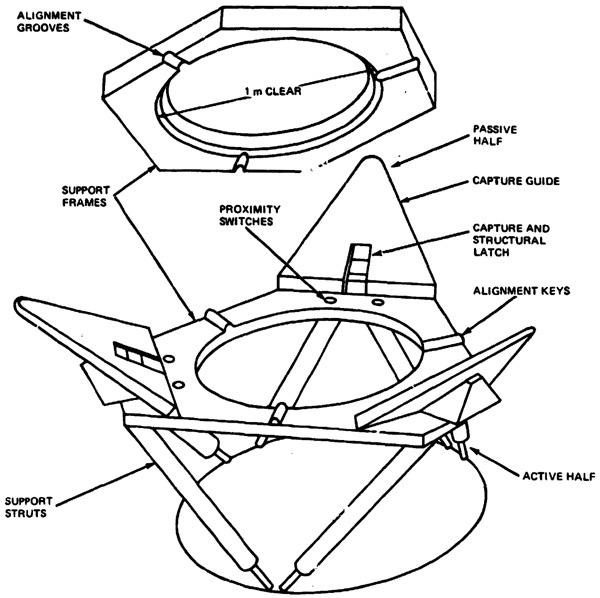 The staging adapter portion of the kit will consist of mating conical frustrums at the aft end of the upper module and at the forward end of the lower module. The upper stage conical frustum will fit into the lower stage conical frustum. The separation mechanism will consist of an electrical or hydraulic system to actuate pins to lock (or separate) the two modules. This kit will be primarily fabricated from Aluminum 7075-T6. 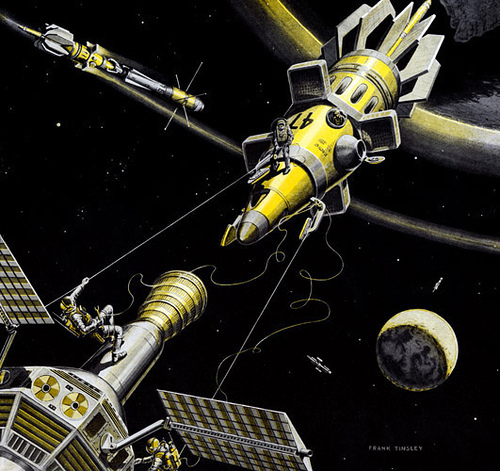 In 1970 the European Launcher Development Organisation (ELDO) awarded a contract to two European industrial consortia to study the feasibility and economic aspects of space tugs. 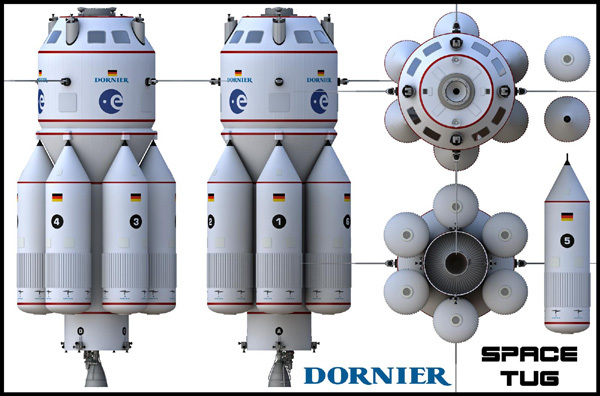 Dornier Systems (a west German aerospace firm) produced this proposal. 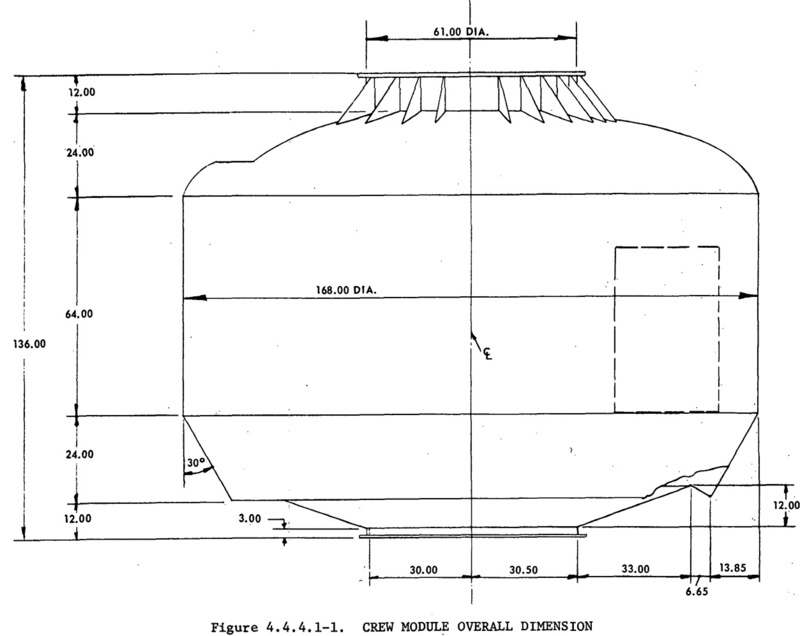 The core unit contained 14,700 kg of propellant, and each auxiliary unit had 6,600 kg of additional propellant. The core unit alone with no auxiliary units can inject a payload of up to 2,000 kg into a geostationary orbit and return (8,800 m/s ΔV). The core unit can inject 6,100 kg of payload into geostationary orbit but will not be able to return (4,400 m/s ΔV). In between missions the core unit waits in a LEO parking orbit. Take the first trip: Tug with just the core (no auxiliary units) for 1,800 kg dry mass, 14,700 kg of propellant, and 2,000 kg payload. First leg of the trip is traveling from LEO to GEO, requiring 4,400 m/s ΔV. So the tug arrives at GEO with a total mass of 6,850 kg. We know that 1,800 kg is dry mass and 2,000 kg is payload. 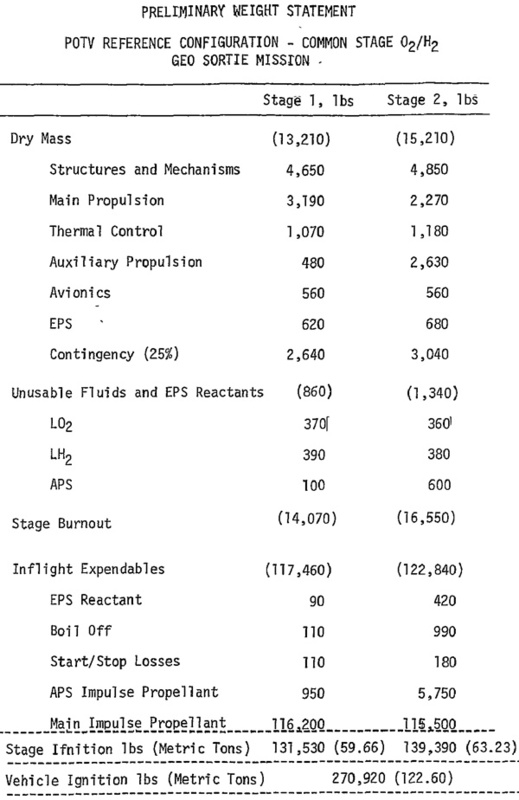 By subracting we see that there is 3,050 kg of propellant left. In GEO, the 2,000 kg payload is delivered, and is no long part of the tug's total mass. It is time for the second leg of the trip. Now the tug has a wet mass of 1,800 + 3,050 = 4,850 kg. It has a mass ratio of 4,850 / 1,800 = 2.69. How much ΔV does it have? 4,370 m/s is close enough for government work to the 4,400 ΔV required to travel from GEO back to the LEO parking orbit. Wto means "wet mass". λ- means propellant fraction. Total Massmax means wet mass with core module and six auxiliary modules. In Germany, the comma is used as a decimal point. 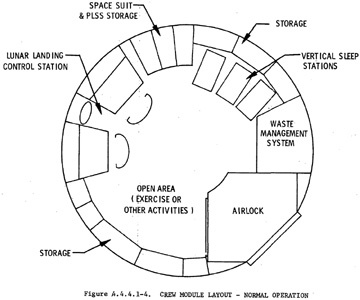 This is from a report Manned Orbital Transfer Vehicle (MOTV) by Grumman Aerospace, Vol 1, Vol 2, Vol 2b, Vol 3, Vol 4, Vol 5, and Vol 6. 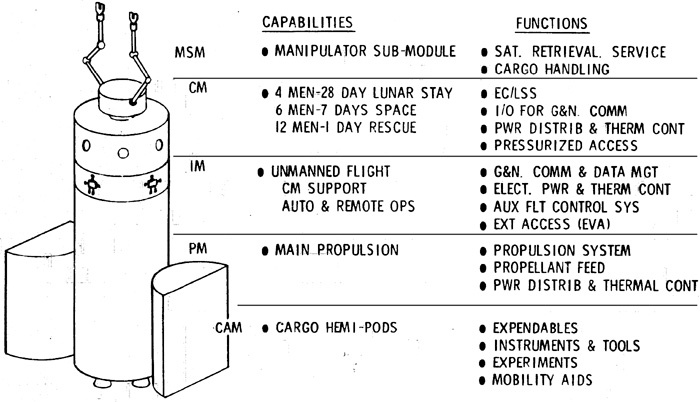 The MOTV was intended for a series of orbital missions, listed in the table. They range from short-duration/small-crew/low-mission-hardware-mass to long-duration/large-crew/heavy-mission-hardware-mass. Orbits range from GEO to 12hr/63° elliptic to deep space (400,000 nautical miles circular). 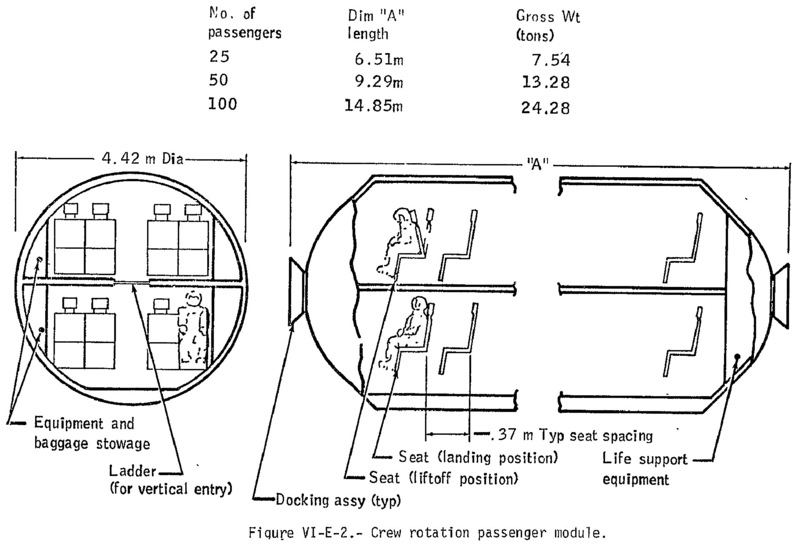 The crew capsule had several configurations: two or three crew, and basic/functional minimum. Basic has the luxury of tiny privacy quarters for each crew. Functional minimum on the other hand is dreadfully spartan, with no privacy whatsoever. Basic has 4 m3 per crew, while functional minimum has only 3 m3. Why does "functional minimum exist? To reduce mass, of course. Every gram counts. 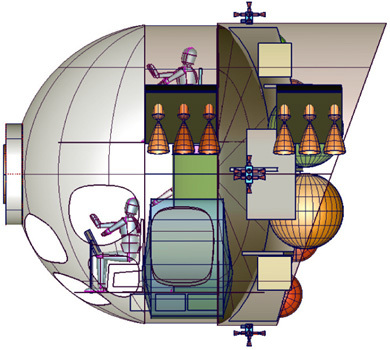 By removing the privacy quarters by combining work and sleep stations you can shorten the 3-crew capsule by an entire meter, and save 440 kilograms of dry mass. 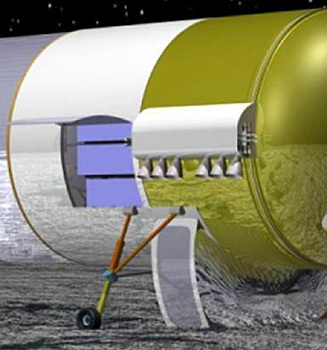 The 2-crew capsule shortens by 1.5 meters and saves 805 kilograms. 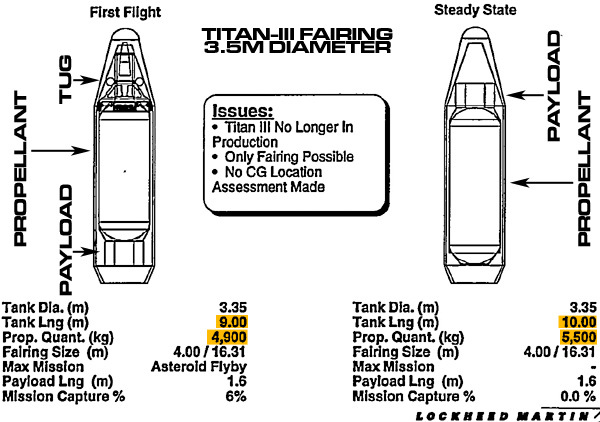 The reductions are figured from the length and mass of the 3-crew basic capsule. As it turns out, most of the missions can be performed by two crew. 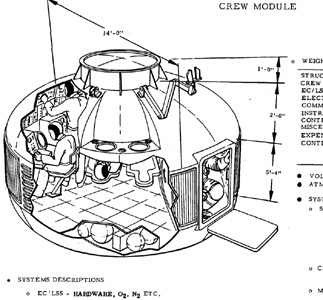 The propulsion system is contained in a central core module aft of the crew capsule. It has a capacity of 17,500 kg of LH2/LOX fuel. It is equipped with two RLIO cat IIB type engines with a specific impulse of 458 seconds. Each engine delivers 67,000 Newtons and can be gimbaled over ±20°. 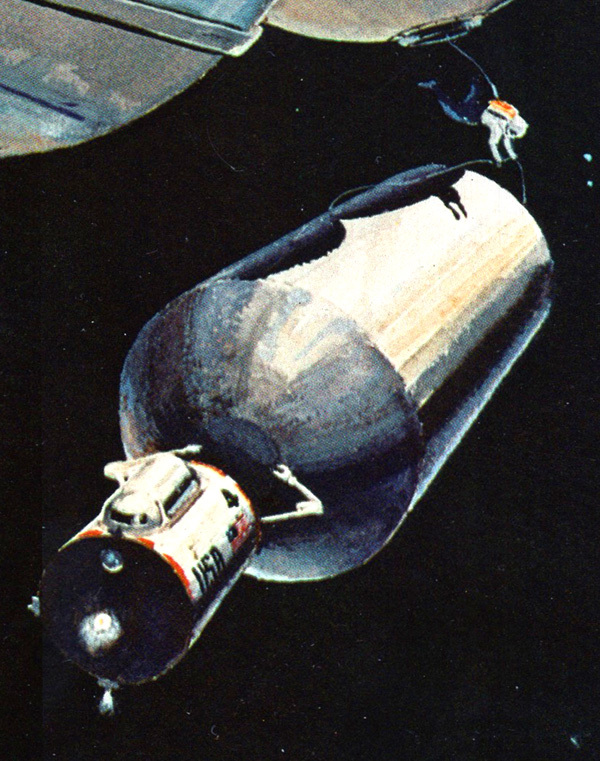 The wide gimbal range is due to the huge shift in the spacecraft's center of gravity when it jettisons a drop tank. 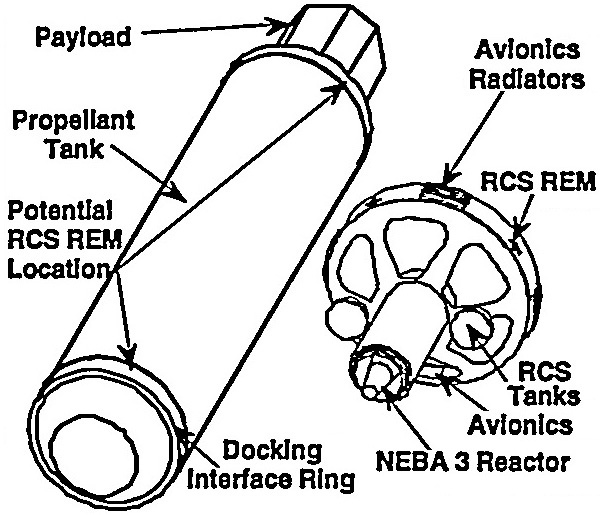 In addition the core has four reaction control system (RCS) modules with 700 N of thrust each. They have a specific impulse of 230 seconds and are fueled with 2,600 kg of hydrazine. The core's intertank skirt has assorted other equipment mounted: three fuel cells and reactant, 4.53 m3 of heat radiator, and an optional 12 kWe solar array. The core can have up to four drop tanks mounted, each containing 27,270 kg of fuel. 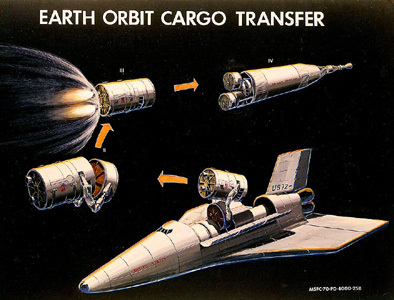 Each has a tiny deorbit engine to send expended tanks to burn up in Terra's atmosphere. All tanks (including the core tank) will have a boiloff rate not to exceed 19 kg/day per tank. 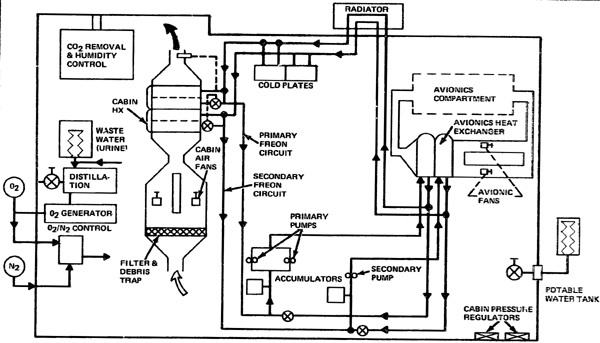 The heat from Sol makes cryogenic fuels boil, the vapor has to be vented or the tanks explode. Use it or lose it. This is from a Johnson Space Center report Initial technical environmental, and economic evaluation of space solar power concepts. Volume 2: Detailed report. The tug design will be used to assist construction of a gigantic solar power station (SPS). The spacecraft is called a Personnel Orbital Transfer Vehicle (POTV) or a Cargo Orbital Transfer Vehicle (COTV), depending upon whether a personnel or cargo module is docked to the crew module. 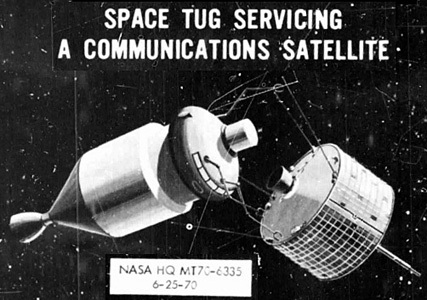 OTV is a fancy word for "space tug". The basic mission will be a trip from Low Earth Orbit (LEO, 200 to 500 km altitude from Terra's surface) to Geosynchronous Orbit (GEO, 42,164 km from Terra's center) then back to LEO. Transit time from LEO to GEO will be from 8 to 9 hours. Geosynchronous Sortie A 4 crew mission spending a week on geosynchronous satellite maintenance, with transfers of up to 15° longitude between each satellite visit. 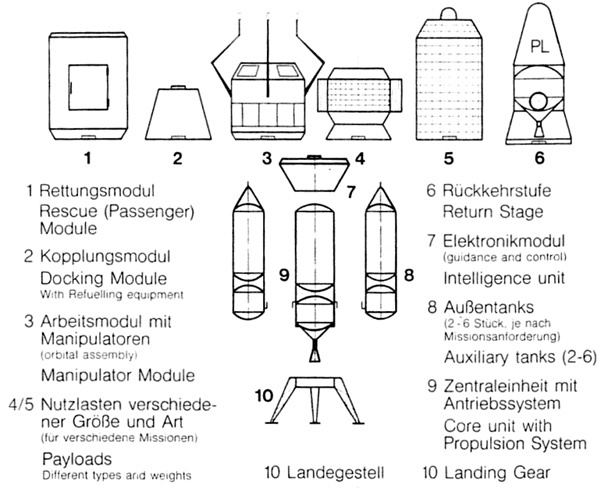 Only the crew module is required, added to the propulsion stages. Crew Rotation The contruction and operational crews on the solar power stations will be rotated at least every six months due to allowable radiation dose. 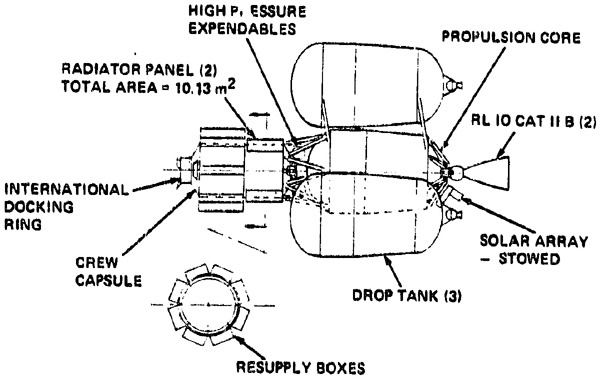 A crew module and a personnel module are required, added to the propulsion stages. Station Resupply Replenish the GEO station consumable, supplies, and equipment necessary for 180 days. 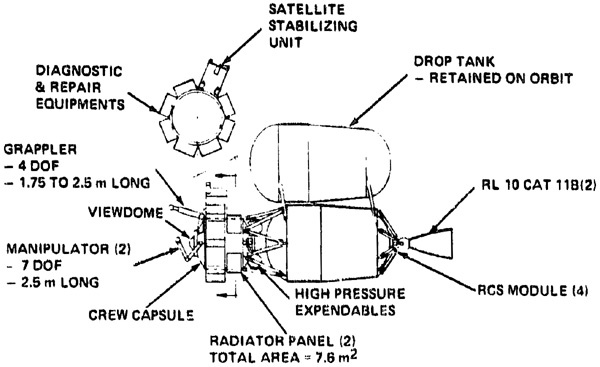 For some missions the spacecraft is configured with two stages. 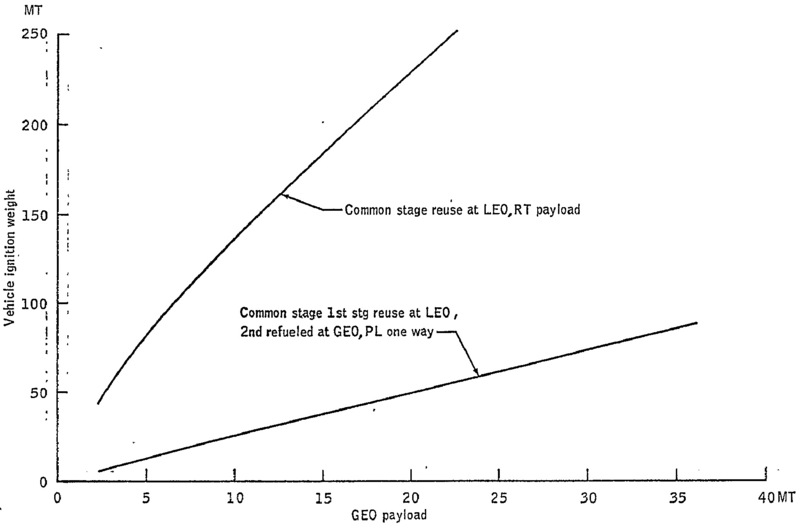 The initial burn is to leave LEO and enter the GEO transfer orbit. When 85% of the required delta V has been generated, staging occurres. But the first stage is not discarded. Upon staging, the first stage still has some propellant left. 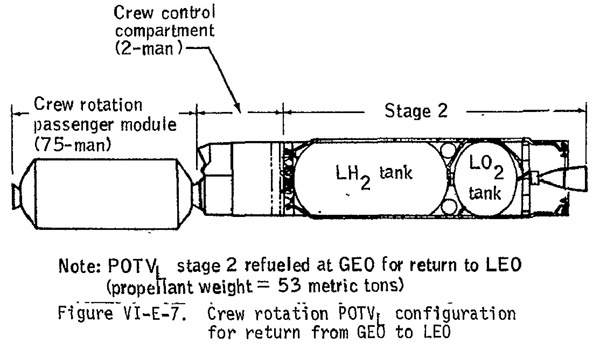 The stage uses the remaining propellant to return to LEO under automatic pilot. The weird 85% staging point is to allow both first and second stages to have identical propellant tanks and delta V. They do have a different number of engines, so the first stage has a higher acceleration. 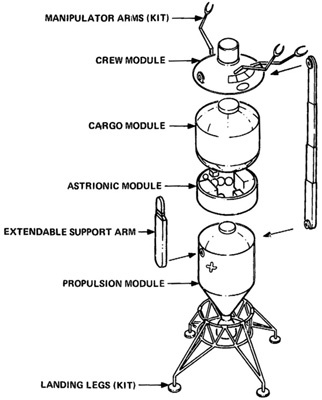 The modular design has three components: propulsion stages, crew modules, and resupply modules. All modules are sized so they will fit in a space shuttle payload bay (maximum diameter 4.42 meters, maximum length). From Satellite power system: Concept development and evaluation program, reference system report. This is a slightly different design, the diameter-to-length ratio is not the same. 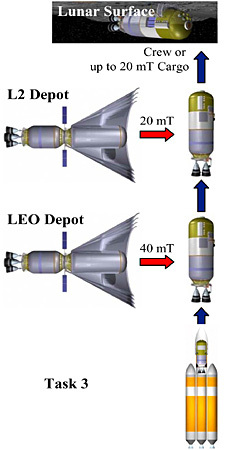 This concept consists of two nearly identical stages used in tandem that provide the required mission delta-V. 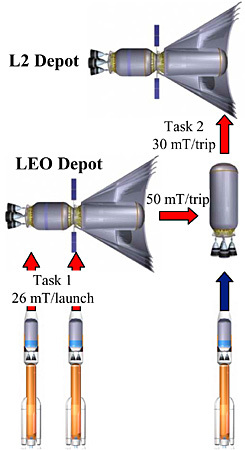 The first of these stages is unmanned and is used to provide approximately 85% of the delta-V required for departure from LEO on a crew rotation flight. 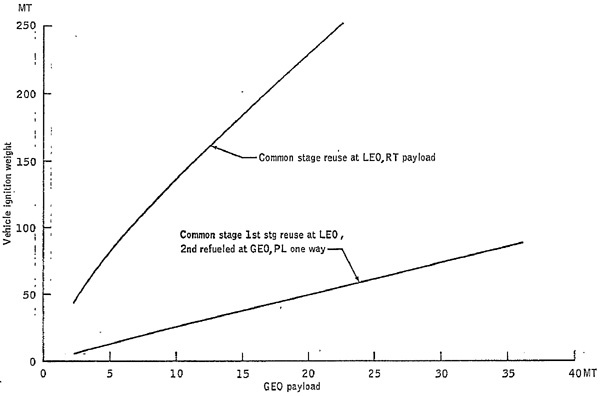 Stage 2 provides the remainder of the boost delta-V as well as the impulse required for injection into the destination orbit and for the return to LEO. 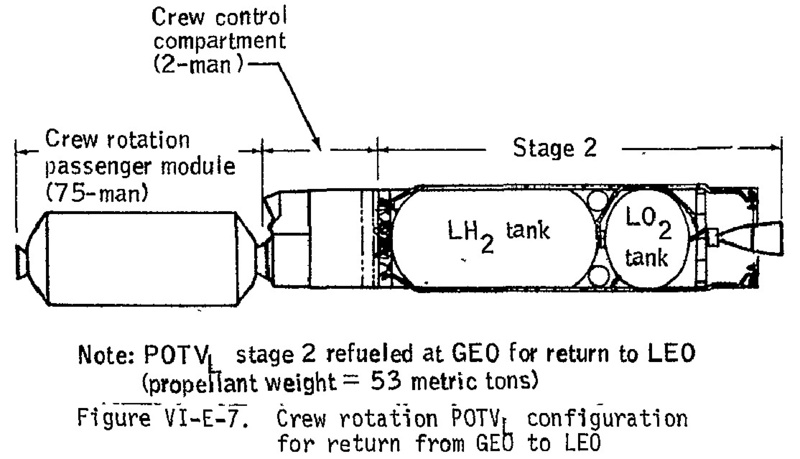 Following separation from stage 2, stage 1 is returned unmanned to LEO. 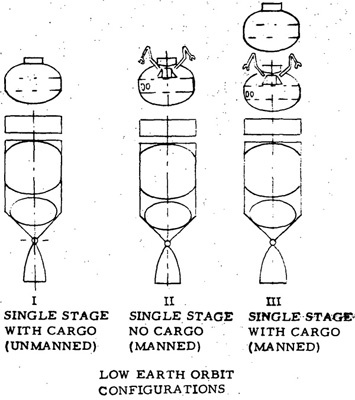 Splitting the delta-V as described above results in the stages having identical propellant capacities. Subsystems design approaches are also common between the stages including the size of the main engine. Taken individually, each of these stages is similar to the single stage concept in terms of subsystem selection and location. 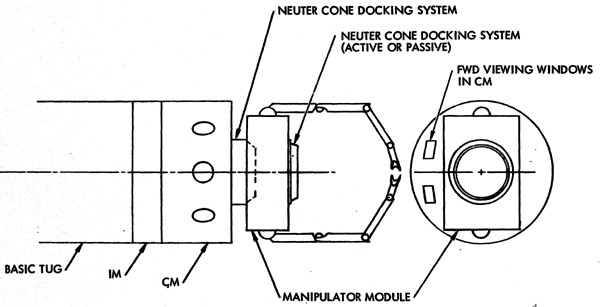 At the forward end of the stage 1 are two types of docking provisions. One of these systems isused to connect with stage 2 while the center mounted unit is an international type design that allows docking with systems other than stage 2; examples of these other systems include a tanker for independent servicing or a space station ifbasing isrequired while awaiting the return of stage 2. 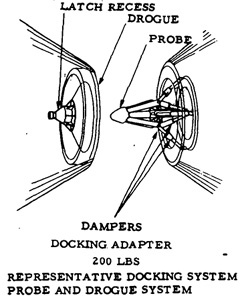 Stage 2 docking provisions are required at both the forward and aft ends. The forward docking station uses an international type unit for attaching payloads. 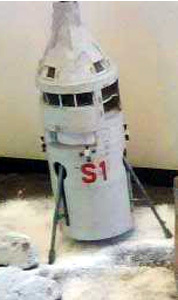 In addition, this unit accommodates tankers or is used to connect the stage to a space station for basing. The aft docking provisions are used in conjunction with those in the forward section of stage 1 and enable the stages to be connected. 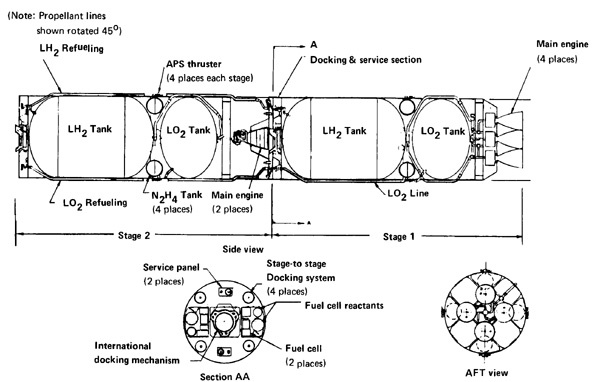 Provisions are also included on stage 2 to allow servicing of stage 1 when the two stages are connected, and the tanker is docked at the forward end of stage 2. 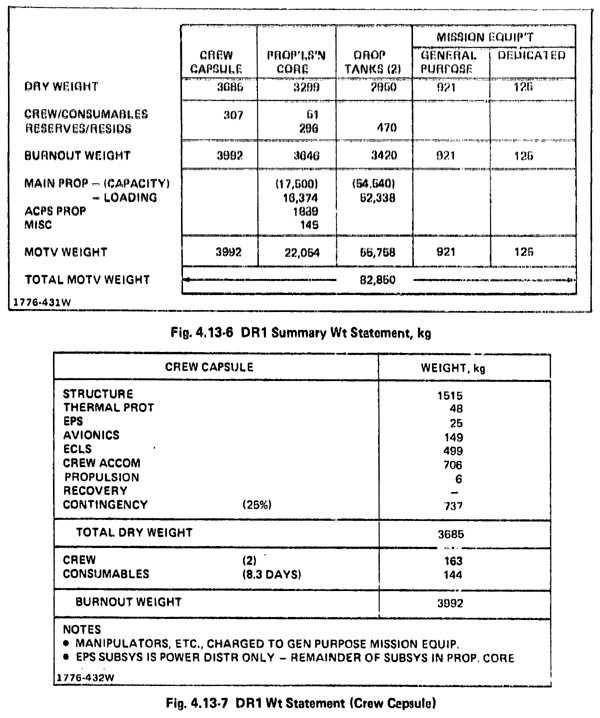 The OTV start burn mass is 123 metric tons (I think this includes one crew module) with a main propellant loading of 106 metric tons. Each stage is 4.42 meters in diameter and 17.06 meters in length (stage 2 length is 15.61 meters with engine nozzles retracted) and are Shuttle compatible and require on-orbit fueling and refueling. The first stage employes four 66,720 newtons thrust engines and the second stage employs two of the same engines. Contains enough shielding to protect the passengers from the Van Allen radiation belt. 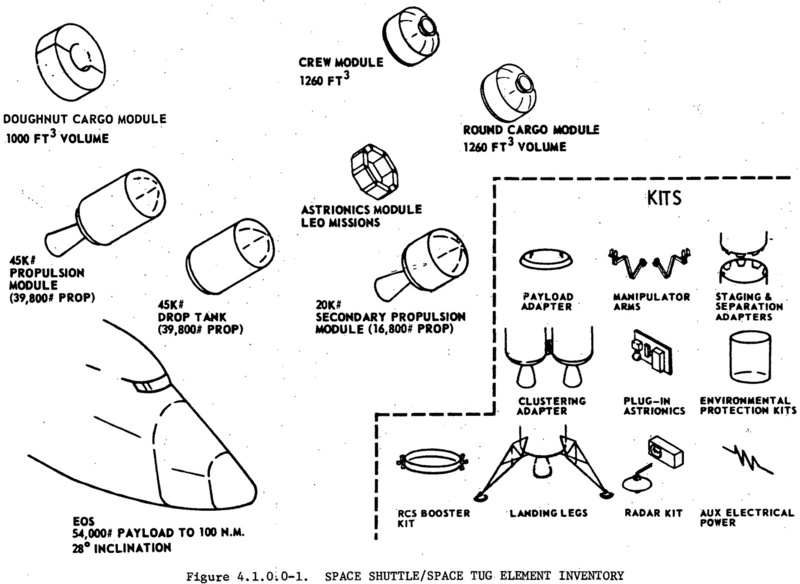 Sized for 180 days/25 crew worth of supplies and consumables (4,500 person-days of supplies). Supply mass of 29 metric tons. 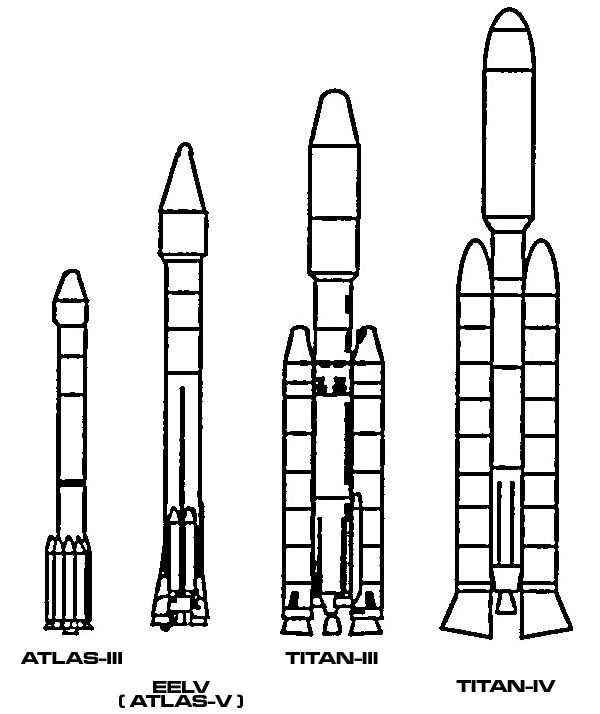 The following designs have a very similar appearance to the JSC space tug. 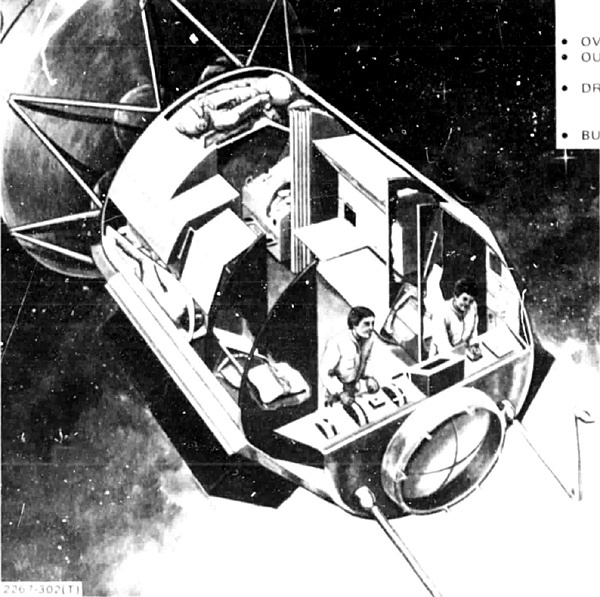 Boeing Intra-Orbit Personnel/Cargo Tug concept (1981) from Satellite Power System: Concept Development and Evaluation Program. So four days ago or there abouts, I put a poll up on Google+ with a selection of spacecraft I was thinking about making isometric cutaways of. 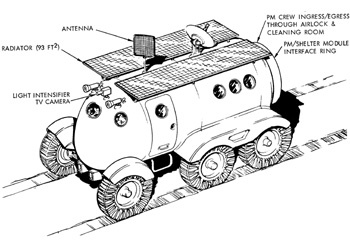 The frontrunner is the Intra-Fleet Space Tug. That means, RocketFans, that we’ve got ourselves a project! This is not the tug. The context for this particular spacecraft, like the Cygnus capsule I also put in the poll, is the care and feeding of the distributed-network fortification that is a deployed UN Constellation in the Conjunctionsetting. In summary, the fleet’s configuration is a tetrahedron in space with a single control ship at the apex, patrol craft making up the other three vertices, and edges three hundred thousand kilometers long. 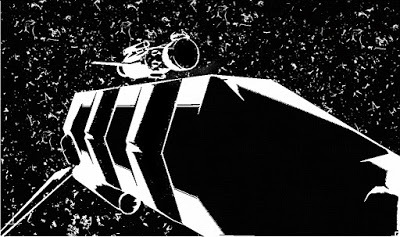 Just how do you supply ships that are as far out as the Moon is from LEO? In the article about how fleets work, I stated that the crews on the patrol craft could be swapped out by ferrying fresh people out via the Cygnus. While this would certainly work for crew transfers, you’d also have to detail additional craft for cargo transfers, of consumables and (if armed with rail guns) ammunition. As versatile as the Cygnus is, it cannot not re-supply that most important consumable resource in terms of tactical movement, propellant. To put the problem into perspective, a Cygnus stack is a rough cylinder 4.5 meters in diameter and about ten meters long. The propellant tanks on a Type A Patrol Cutter are 8 meters in diameter and total thirty meters long. And there are two stacks. Clearly, to refuel a patrol ship, we need a real tanker. I’ve said it before RocketFans, and I’ll surely say it again: Atomic Rockets is an invaluable resource for the budding rocketeer. 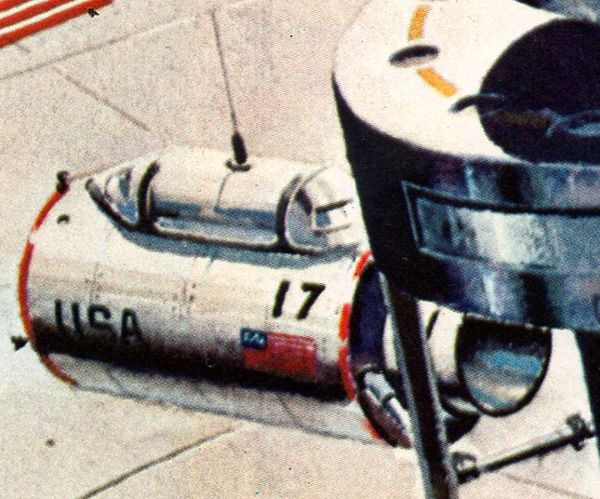 The “Realistic Designs” sections are a veritable clearinghouse of old NASA designs that were pretty good but never got a decent budget. 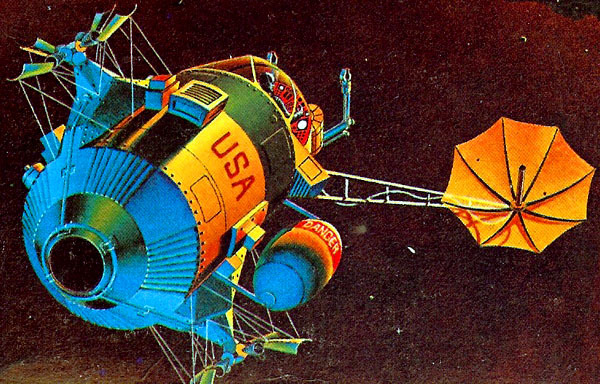 These oldies make for a great library of inspiration when designing any spacecraft that is meant to work with real-world physics. For our Intra-Fleet Tug, I was inspired by the Johnson Space Center’sTug study, who’s image I used in the Poll. This beauty is a two-stage ferry to get from LEO to GEO where NASA was going to build a solar power station. Anyway, a light-second is good deal further than the LEO/ GEO distance, right? In kilometers, yes, but in Delta-V, not even close. It takes a whopping 4.33 km/s to go from LEO to GEO, but a paltry 2.74 km/s to get from LEO to Lunar orbit…a little over a light-second away. Gravity is funny like that. So our tug only needs about 75% the range of the JSC version. Since that design was staged and the first staged carried the spacecraft 85% of the way to GEO we could just lop of Stage I and call it a day. But where’s the fun in that? The problem with just ripping of the JSC design is that it isn’t a tanker. We need to be able to deliver a large amount of propellant, so we’re going to need a large spacecraft. Something that could haul at least a quarter or half of the Delta-V needed to completely refuel a Patrol craft. 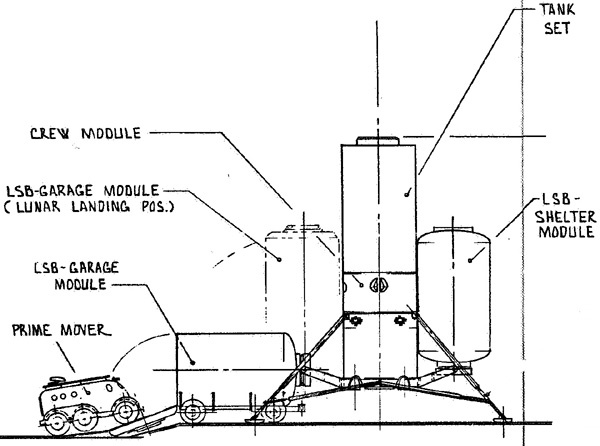 What follows is an experiment: I’m thinking of just taking an entire rocket stack from a Patrol craft and slapping a command module on the front for our Tug. Let’s see how that would work, shall we? First of all, we need to dust off our rocketry equations so we know what variables we need to consider. We’re going to need to know the Tugs dry mass, wet mass, and engine details such as propellant flow, thrust, and exhaust velocity. 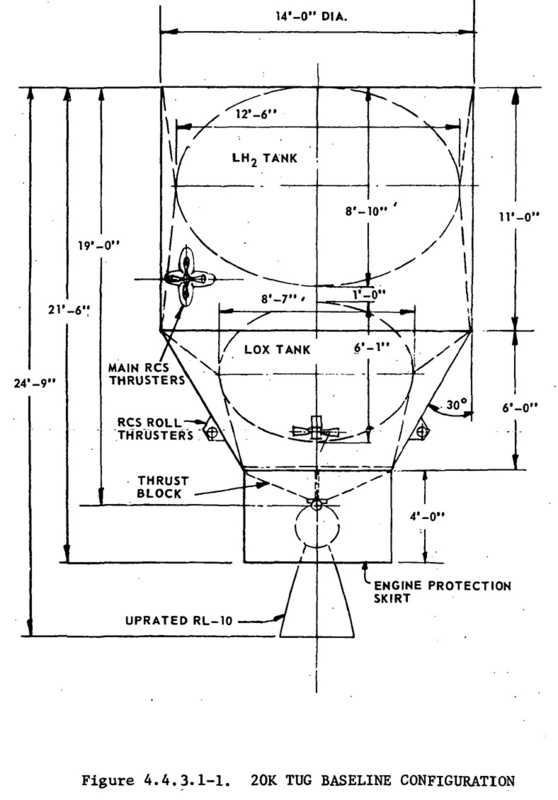 Since we’re using the dimensions of the propellant tanks from the Class A Patrol Craft, and possibly one of its main engines, that gives us a great place to start. 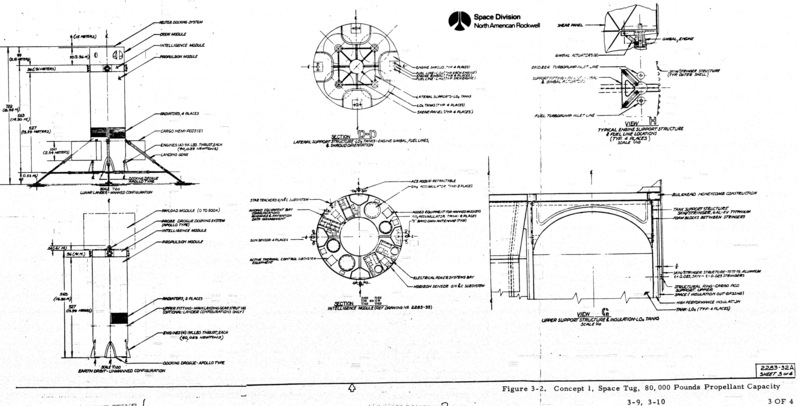 In fact, lets crunch the numbers for the Patrol rocket’s main engine and an alternate, say something along the lines of the J-2 from the Saturn V’s SIV-B stage. First, let’s establish the tonnage for the Tug without it’s engines. We’ll want a decent sized crew module, because gaming, and also so we can have cadets aboard during all flights. 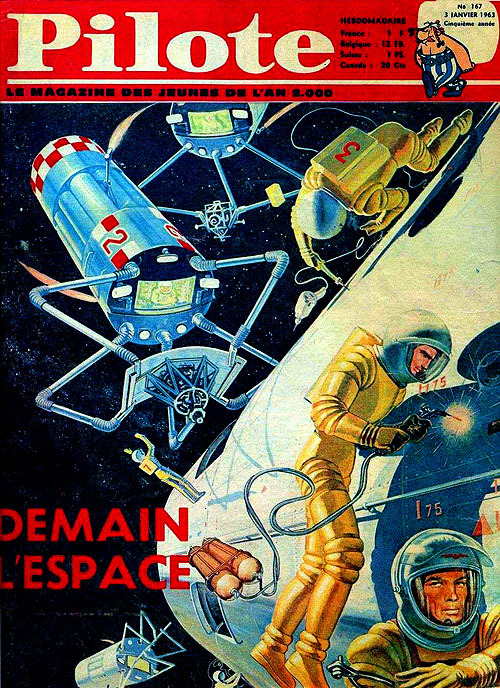 In Conjunction, like in Heinlein’s Space Cadet every UN convoy and spacecraft has a group of peacekeeper candidates learning how to work in space by working in space. I see an actual crew of about four: a Flight Commander (F-Com), Guidance Procedures Officer (GPO), Maintenance, Mechanical Arms, and Crew Systems Officer (MACS), and a Payload Officer (Payload). 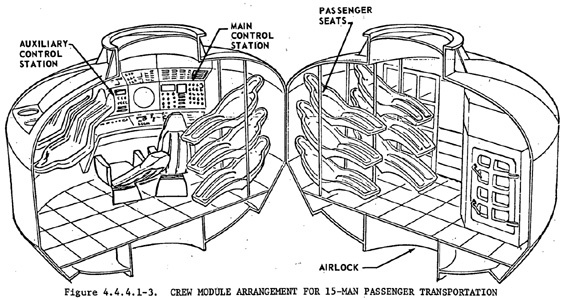 Add as many again of Candy-Cruisers, and you’ve got eight people in the command module. That’s a bit crowded for a Tug, but we can use hot-bunking with to limit the sleeping berths to four. The CM must also have at least a pair of robotic arms, and a sturdy docking module for carrying passenger capsules and cargo pods. Behind the CM will sit a flared-out service module, with avionics, life support, and computer systems. The SM will be mated to a 30 × 10 meter saddle truss, which is what will actually hold our propellant tanks and provide a mount for the rocket stack. But in addition to all of that, we will also need a passenger module and cargo pods, so we need to know the mass for all of those as well. I arrived at some of these number dubiously, so take them with a grain of salt. 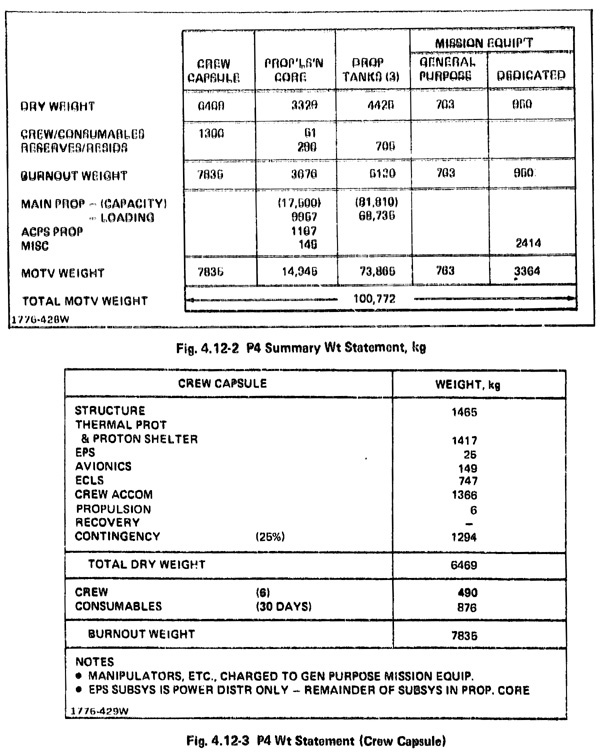 The CM mass is from the Trans Hab Calculator on the AR website, the SM is from the JSC Tug, the truss is simply repeating the mass of the propellant tanks, since I couldn’t find any reliable numbers for that. 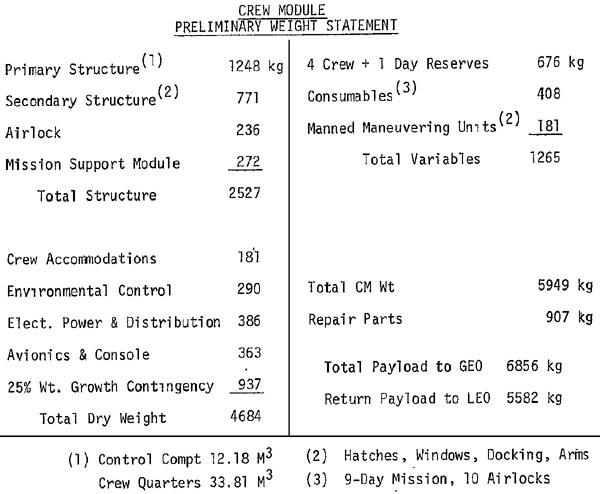 The Passenger module is also from the JSC tug, while the consumables and cargo masses are calculated for the tugs trip out and back, as well as 30 days of supplies for the 20-person crew of a Patrol craft. And of course, we can’t forget the mass of the crew and passengers themselves, plus what ever possessions they can carry inside their regulation 100 kg mass-limit. 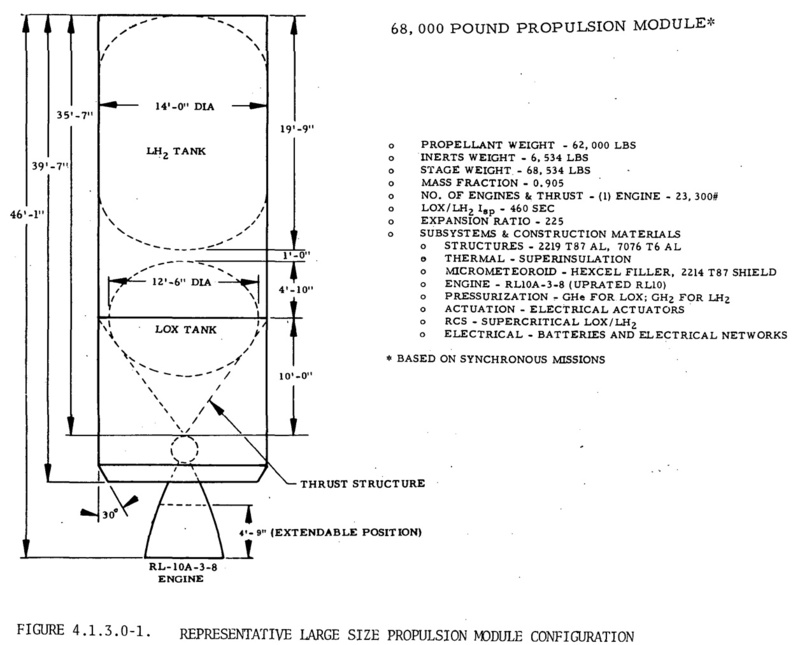 Finally, the propellant tank mass is 6% of the propellant mass, as per Dr. Rob Zubrin, and the propellant masses came from the Useful Tables appendix from Atomic Rockets. But the most important thing to remember is that we have no engine yet. The Class A Patrol craft uses an easy to maintain in freefall analog of the Space Shuttle Main Engine (SSME) so I could simply steal copy the vital statistics. Engine List on Atomic Rockets has these available. Just below that entry is the stats for the Tug engine we will also use. 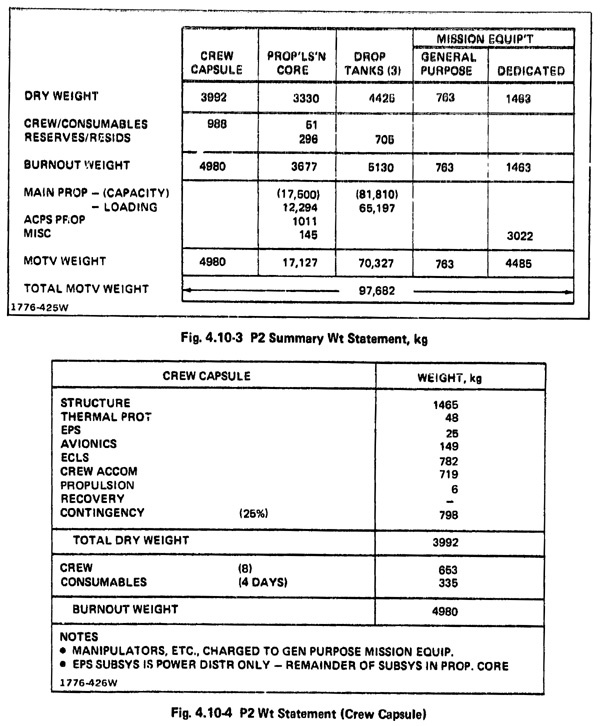 These are not exactly the J-2 stats, but they are for a NASA tug, and they have the information I need to calculate with, whereas sources on the J-2 did not. What we want to know is, assuming a 100-hour flight time, is how much propellant will be left in the big tanks at the end? We need to have spend no more than 1/3 of our propellant mass in transit. That way, we can refuel with another third (plus a bit extra) and use the remaining less-than-a-third to take our much less massive tug home. This means math. So, so much math. Well, not so much, perhaps. We know all the vital statistics for our engines, our mass numbers, our Delta-V budget, and our distances. By establishing an arbitrary travel time of 100 hours, we also provided a much-needed value for equations, and more important, the mass of needed consumables. An Intra-Fleet Tug that uses a “F-2b” SSME-analog will have a wet mass of 846,901 kg, or 847 tons. Let’s see if we can get from point A to B while only burning through 125,664 kg of propellant. If only using 125.6 tons of our propellant, we will be operating with a mass ratio of only 1.8 By using the Delta-V equation of Delta-V = Exhaust Velocity × ln(Mass Ratio). This results in a Delta-V of 2621.96 m/s, or 2.62 km/s. We need 2.74 km/s to get to our destination, so it’s close, but no cigar. If we attempt the same thing with our J-2 analog, we have a wet mass of 845,512 kg. This gives us a mass ratio of 1.8 again. However, the exhaust velocity is 4159.4 (I had to calculate it using the specific impulse, but that’s why we have algerbra in the first place). With the mass ratio and a lower exhaust velocity, the Delta-V is 2.45 km/s. Both engines are pretty comparable, but neither will get us out a light second and back. The moon averages 384,000 kilometers from Earth. A light-second is only 300,000 kilometers. We actually have less distance to travel, and hopefully less Delta-V, than the 2.74 km/s we’ve been using. Possibly a lot less. I forgot that moving around a fleet formation like this is not remotely the same as moving around orbits. Moving from LEO to Luna is a Hohmann trajectory, which is a change between orbits from around one body moving at one speed to another body moving at a very different speed. When deployed, our constellation is all moving at a constant speed along a constant orbit/vector. This means that all spacecraft in the formation are at rest relative to one another. So we need to go from a starting velocity of (relatively) zero to a certain speed, coast, flip, and then decelerate back to zero. This is just a simple physics problem. This is also where our arbitrary 100-hour travel time comes in. With time and distance known, as well as acceleration (Thanks to the engine stats) we can solve for velocity and begin to figure out what we need to know. Solving the displacement equation gives us an average velocity of 833.333 m/s to travel a light-second in four days and change. This means we need a final velocity of 1666.666 m/s. Our SSME engine will take only 721 seconds to boost our monster tug to speed, and the same to decelerate at the other end. Now for the biggie – mileage. By which I mean, just how much propellant did we use up in those 1442 seconds? Turns out that’s an easy one, because we know the mass flow. A single SSME tosses 409 kilos out the back every second, so our Tug will have to burn 589,778 kg. This is more than the entire wet mass of the tug, so say nothing of the “one-third” we wanted to get by with. 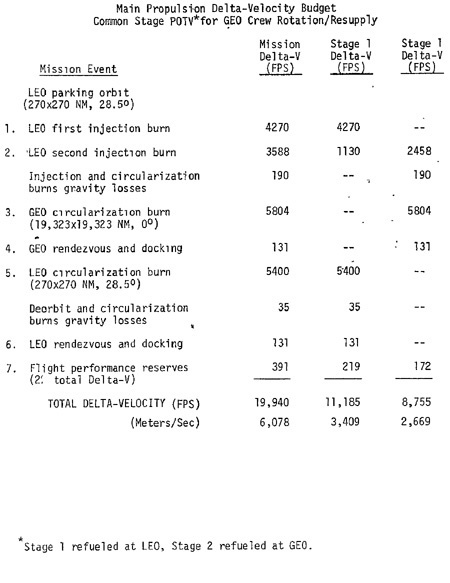 As for the J-2, we need to re-do our acceleration calculation so we can figure our burn duration. Unfortunately, with a burn duration of 1282 seconds one way, the performance is even worse. What went wrong? This tug has half the power or a patrol rocket – it should have at least comparable performance. Its right there in black and white. Having gone back over my notes I discovered my problem, and it’s an embarrassing one. The Class A Patrol Craft I just mentioned, the one that’s over twice as large as this tug? It has a dead weight tonnage of 70 tons. That’s it. The Tug has a dry mass of 466 tons. Well, there’s our problem! I designed the Patrol Craft to take into account the likely progression of materials science toward ever lighter and stronger materials. It was built out something that has the same strength of titanium, and half the mass. Add to that it’s outer skin is mostly carbon and aerogel – literally the least dense substance there is – and its easy to see that simply cribbing numbers from a design made when aluminum was the lightest thing you could build spacecraft of is a problem. I not only went back and recalculated the structure mass using 22nd century materials, I also hand-calculated the mass of the consumables and cargo, using NASA rations. Much better results. With these stats, the Tug can pull 4.43 m/s, and only has to burn for a total of 376, instead of 1442. This means we only burn 141,514 kg of propellant. 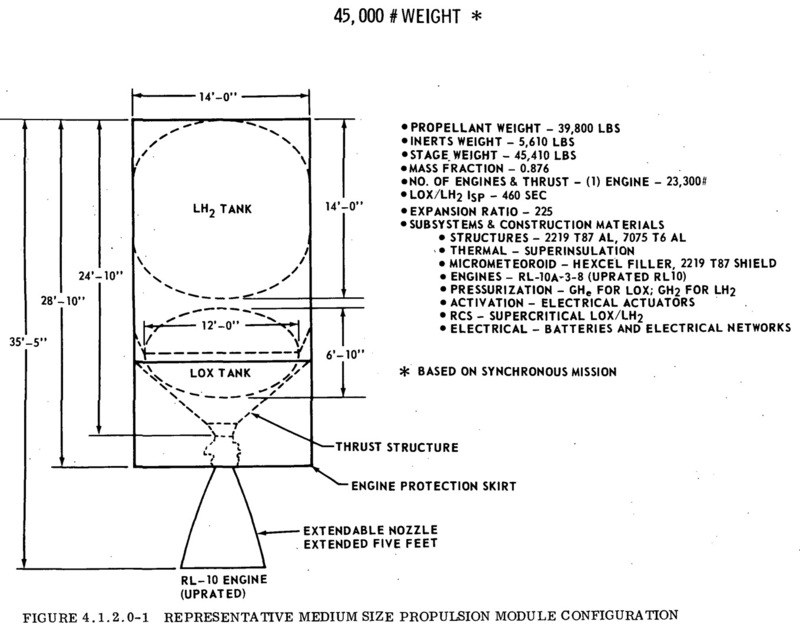 With less thrust and more mass, I don’t feel a need to calculate for the J-2. 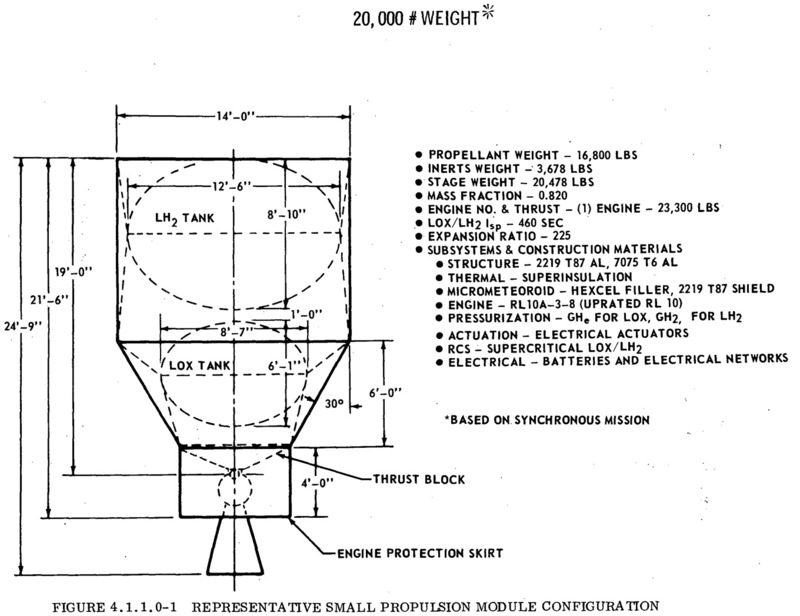 141.5 tons of propellant is 37% of our propellant mass. For the return trip, we’ll need less propellant, say, 25%? The Tug would only mass 126 at that propellant fraction, and accelerate at a whopping 14.4 m/s, or 1.4 gs. It will only have to accelerate for 115 seconds and burn only 43 tons of propellant, while carrying 96 tons. This is over a 100% reserve, enough that we could add another 20 tons or so to the 124 tons our Tug is pumping into the Patrol craft. 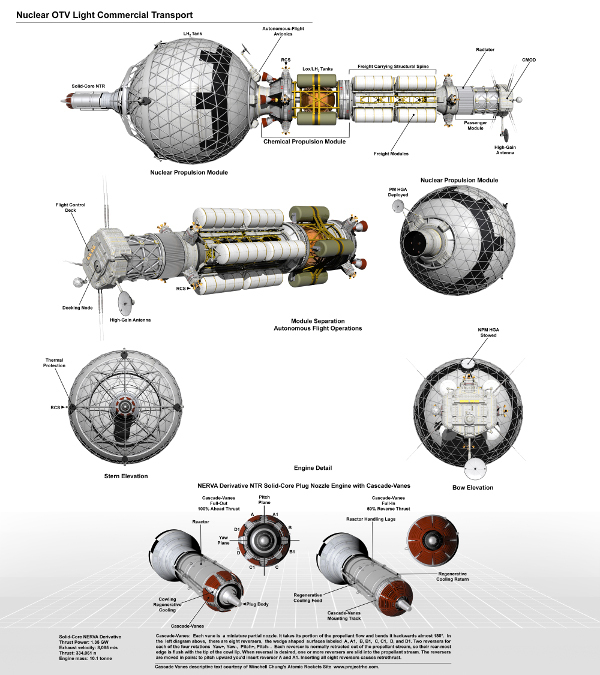 So, there you have it, RocketFans, a glimpse into the hair-tearing-out, thankless job of designing a realistic spacecraft. I’m glad I just have to make these look good on paper. But the important part is, I can now draw a spacecraft with all the particulars I wanted to, and it will not only look realistic, it will be realistic. It’s capabilities and limitation will suggest numerous plot points and story ideas, and I can be assured that each and every one of them will pass the litmus test of plausibility, because I did the math up front. 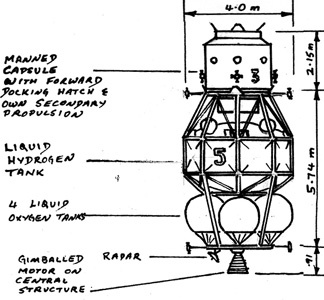 Details are sparse on this 1963 design. 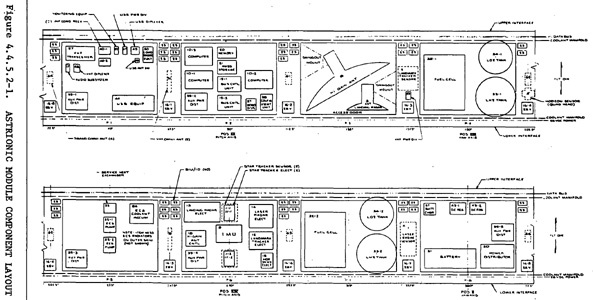 Click on blueprints for larger image. 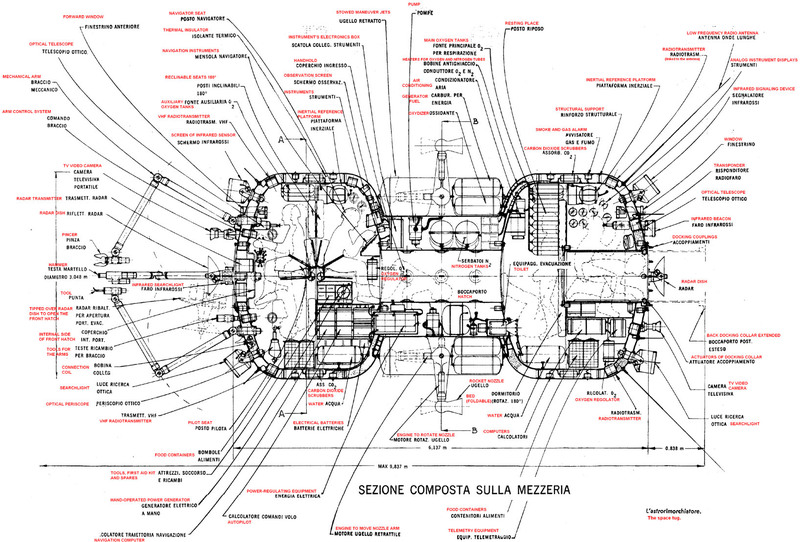 Blueprint is written in Italian but it has been translated for the website by Alberto Bursi. The engines are around the waist, on swivels. The designers also appear to have a flippant attitude towards maintaining a sense of up and down. If the pilot turns his head he will see his copilot's feet. This is from Space tug applications. Final report by Lockheed Martin (1996). Lockheed Martin is not fooling around. All the other space tugs listed here use chemical rockets, this one uses nuclear thermal rocket. A bimodal one at that. 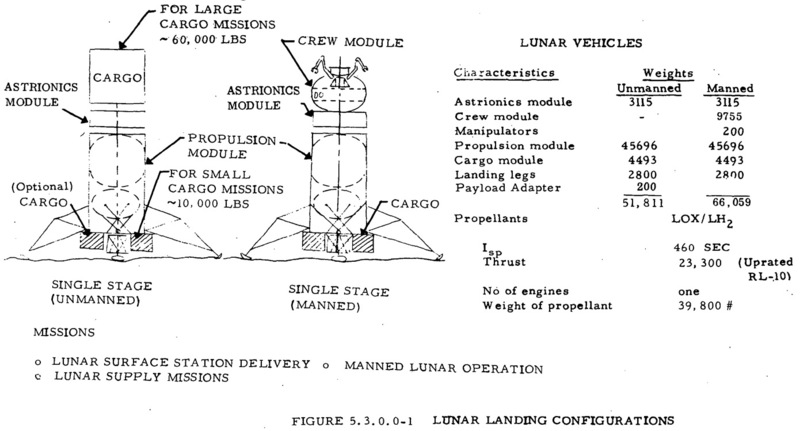 The other tugs were designed for operations in the cis-lunar area, but this atomic baby can deliver 3,500 kilogram payloads to the outer planets. Without needing gravity-assist. It can also deliver about 20% more kilograms of payload to geostationary orbit than current boost vehicles. It can extend the life of existing space assets by providing end of life disposal. And it can also reboost satellites which were not delivered their final orbit by their launch systems. The tug is uncrewed, it is either remote controlled or by onboard autopilot. Bimodal engines are where the unit can operate at high temperature / short duration mode for propulsion, and at low temperature / long duration mode for electrical power generation. Which is a royal pain to get such diametrically opposed parameters into a single unit. A common power generation reactor uses pins of uranium nitride (UN) as fuel. A common propulsion reactor uses cermet fuel, which is ceramic fuel particles such as uranium dioxide (UO2) embedded in a tungsten (W) matrix with a high melting point (UO2-W cermet). 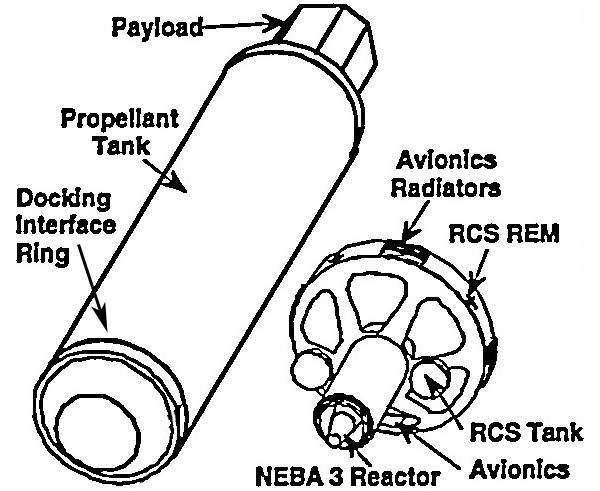 In 1994 a joint USAF/Phillips Laboratory program managed to merge these two fuels in one reactor, called Nuclear Engine for Bimodal Applications (NEBA)-3. Hydrogen is heated for propulsion and coolant containing liquid lithium is heated for electrical power generation. NEBA-3 in propulsion mode can give a specific impulse of 850 seconds (exhaust velocity of 8,340 m/s) at thrusts of 90 to 925 Newtons. In power mode it can supply 10 kilowatts of electricity for ten years. System mass is about 1,500 kg. There are some details in this patent. Now you know as much as I know, most of the details are locked up in articles I do not have access to. I got the details from the abstract. The engine reaches its end of life once it has delivered 100 meters per second of delta V. It is then put into a disposal orbit. The report's analysis found early on that the NEBA-1 and NEBA-3 had very similar performance. So the rest of the study assumed the NEBA-3 would be used. The NEBA-1 has longer and more fragile heat pipes. 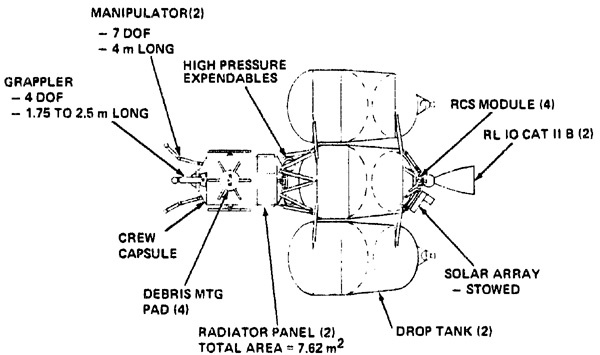 The vehicle uses two components: a resuable tug and a non-resuable propellant-payload module. A propellant-payload module is boosted into an 185 km circular orbit. 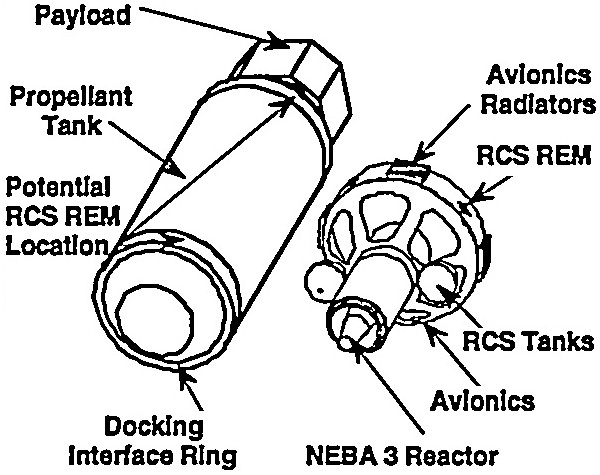 The nuclear tug proper uses its hydrazine RCS to rendezvous and dock with the propellant/payload. 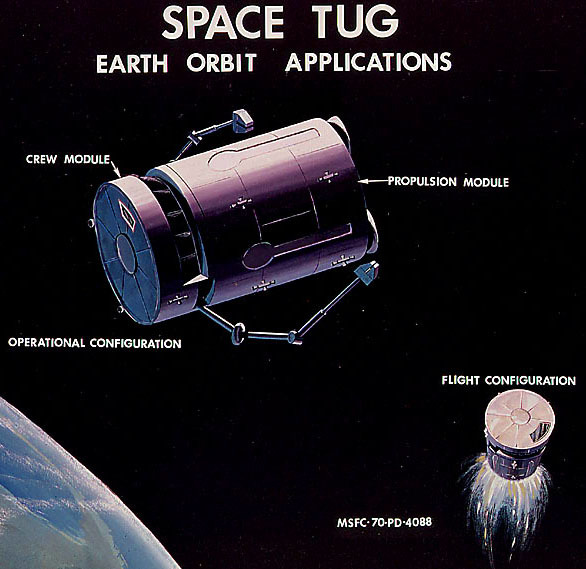 The tug delivers the payload to its destination using the propellant. Then the tug returns to a parking orbit (500 km circular, so it doesn't irratiate Terra's surface with deadly radiation) using the remaining propellant and waits for the next mission. It uses electrical propulsion for station keeping in parking orbit. Either an ion drive with xenon propellant and a specific impulse of 3,000 seconds, or an arcjet with ammonia propellant and a specific impulse of 800 seconds. Thermal propulsion is assumed to be used for delivering satellites because ion drives take too long. Especially with only 10 kWe of power. Time is money. Thermal propulsion can deliver a satellite in about ten days, ion drive would take about a year and a half. 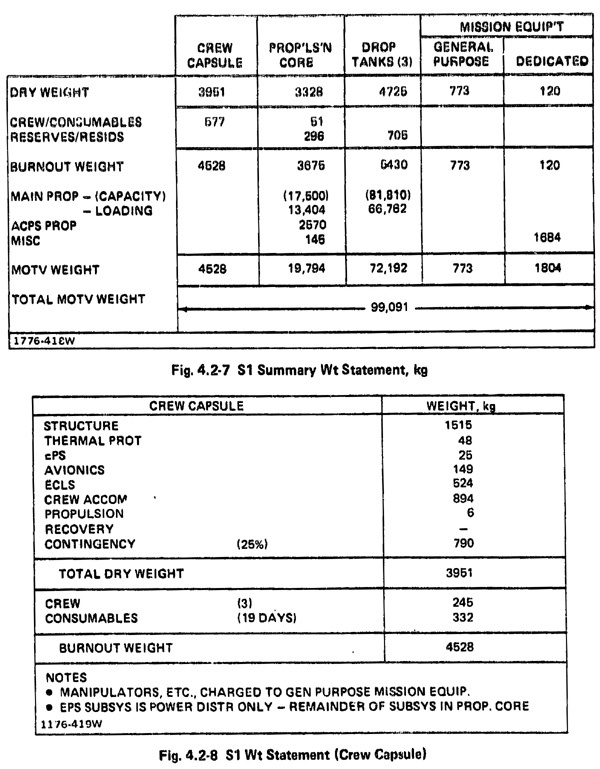 The report assumes that the vehicle's dry mass contingency is 20%, the propellant residual is 1.5% of total propellants, and the flight performance reserve is 2% of the delta V.
The report did a survey of various lift vehicles. The reusable tug and the propellant-payload module will have to be sized to fit into the lift vehicle payload fairing. 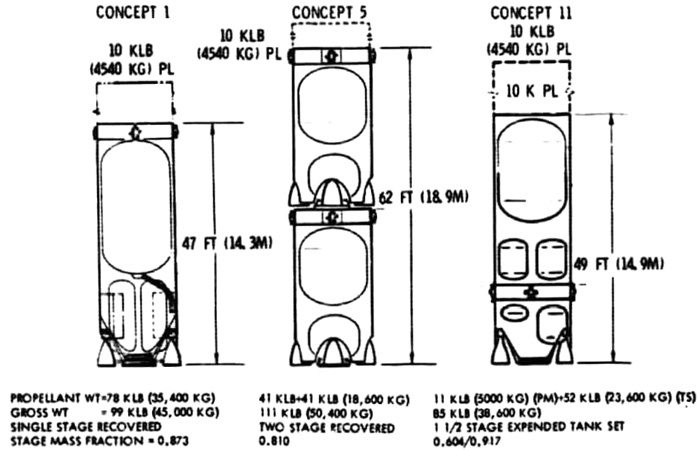 They narrowed the suitable lift vehicles down to ones with a narrow payload fairing diameter of 3.6 meters (11 feet) and ones with a wide payload fairing diameter of 4.3 meters (14 feet). 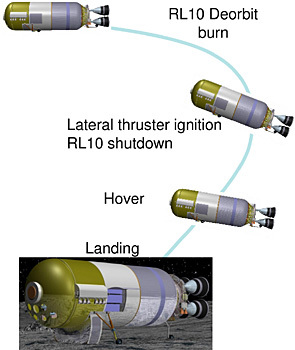 In each vehicles' "First Flight", the lift vehicle boosts both the tug and a propellant-payload module. 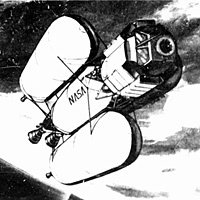 In the subsequent "Steady State" flights the lift vehicle only boosts a propellant-payload, the tug in parking orbit is reused. This means that the propellant tank in a Steady State boost can be longer than the First Flight boost, since there is no tug to take up space in the payload fairing. This is sized for the 3.6 meter (11 foot) diameter payload fairing of the Atlas and Titan-III boost vehicles. This is sized for the 4.3 meter (14 foot) diameter payload fairing of the Titan-IV and EELV boost vehicles. 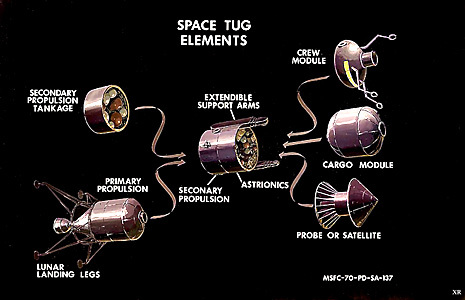 The tug can perform several cis-Lunar missions. However for missions to Mars, Jupiter, Pluto, or the asteroids; it cannot carry enough propellant to return to Terra orbit. To amortize the cost of the tug, the report suggest using it for lots of cis-Lunar missions then a planetary mission for its last flight. Obviously this will result in a radioactive tug orbiting the planet in question, but that will be something for future missions to worry about. 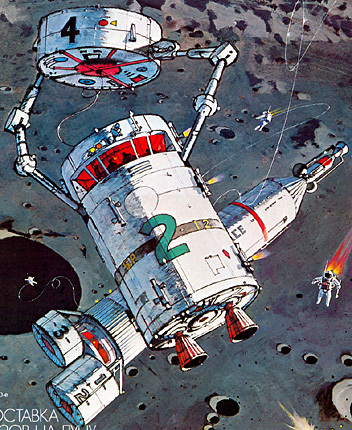 Or for hypothetical space pirates who are hard up for uranium and don't mind the effort of reprocessing the fuel rods. 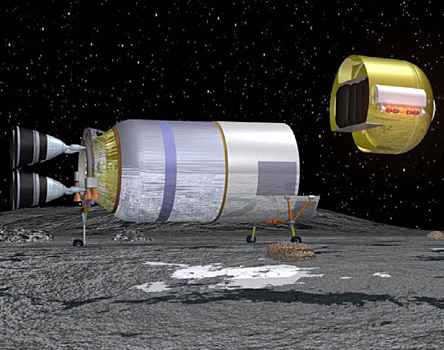 The cis-Lunar mission require less than 10 hours of thermal burn time, each. The planetary missions can approach 20 hours. This is a spiffy design for giant robot fans. Those titanic mecha arms will immediately grab the attention anybody who adores Jaegers. 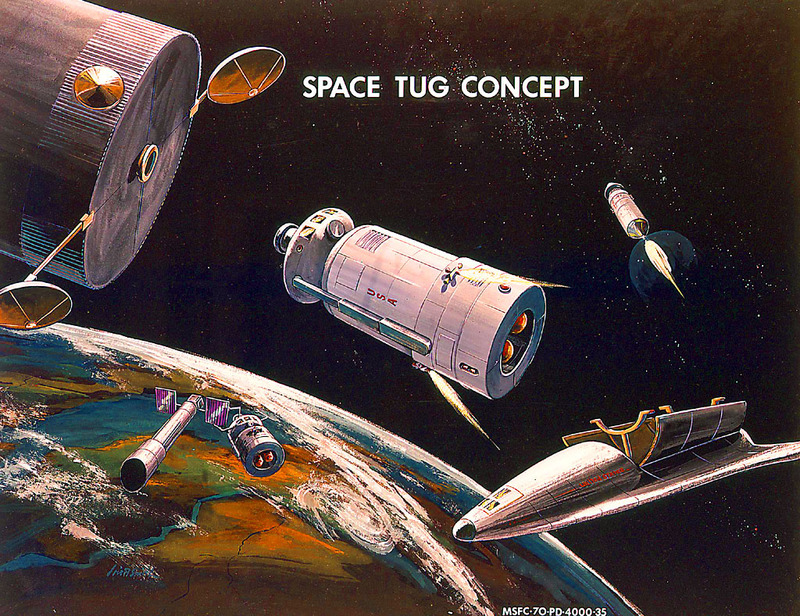 This is a 1972 era NASA concept for a space tug. It is a modular design. 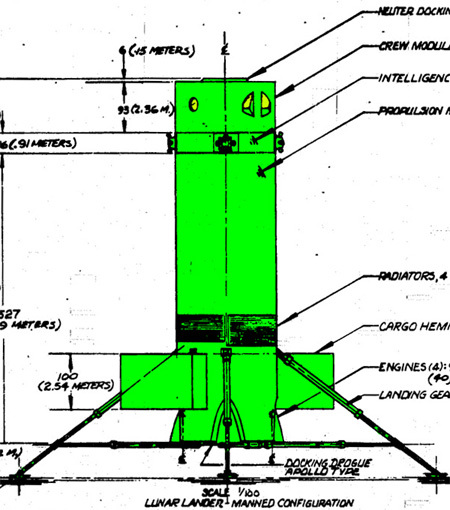 It is an altered version of an old Boeing space tug design. One way to tell the difference is that the Boeing tug's crew and cargo modules were spherical, while the NASA tug's modules were cylindrical. The information is from a North American Rockwell Corp. document entitled Pre-phase A Study for an Analysis of a Reusable Space Tug. 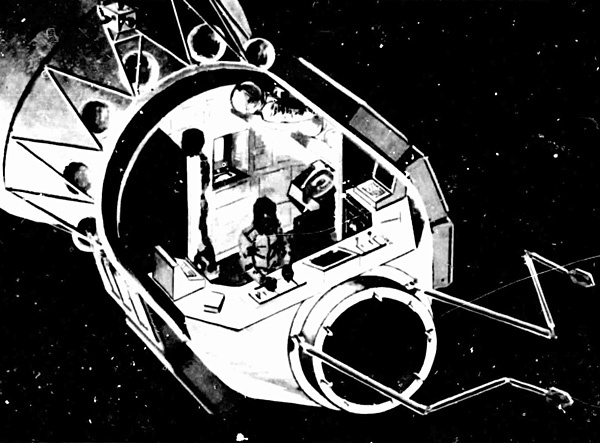 Volume 4 - Spacecraft Concepts and Systems Design Final Report. The document is solid gold, but be warned it is 640 megs in size and over 600 pages long. It has tons of blueprints. 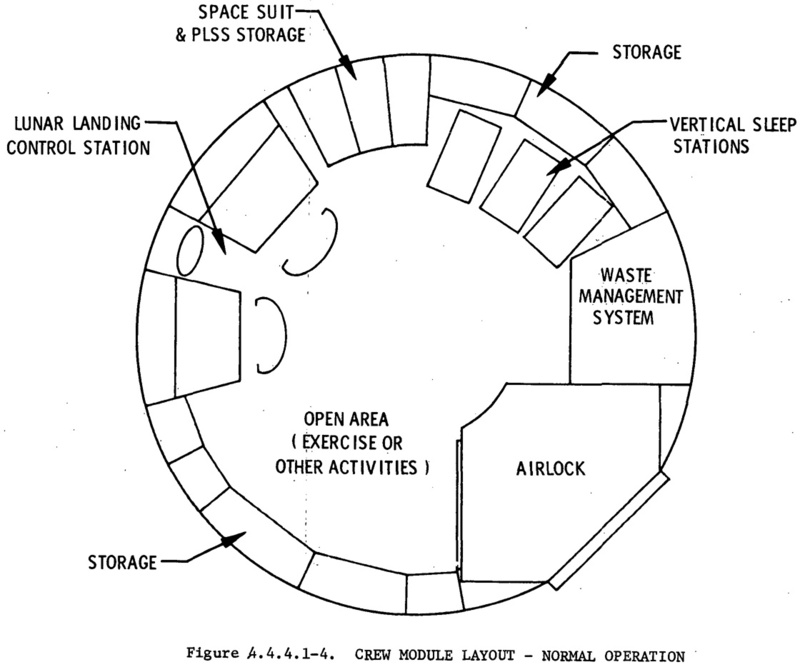 Also useful is Pre-phase A Study for a Analysis of a Reusable Space Tug. Volume 5 - Subsystems Final Report. 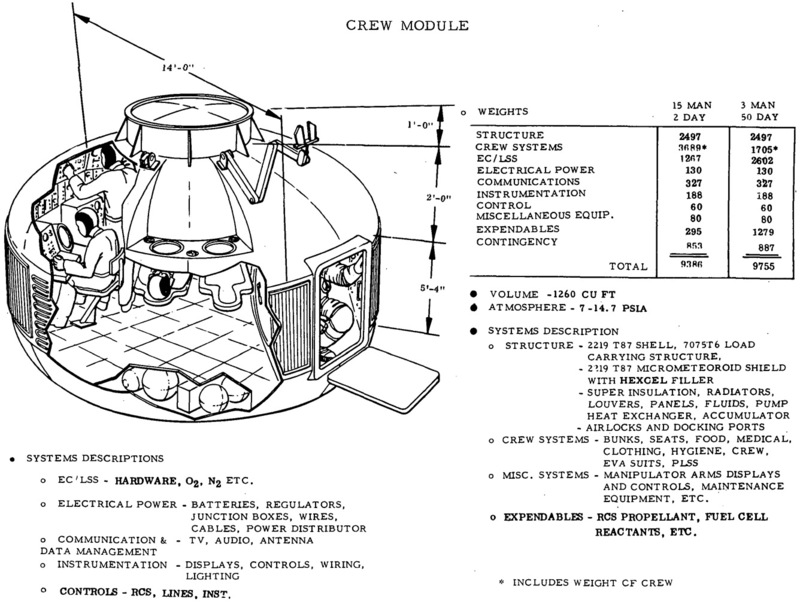 In addition, they mentioned a two-crew "mission" which boiled down to "use a crew module as a control room." You see this often as a crew module perched on top of a Reusable Nuclear Shuttle. 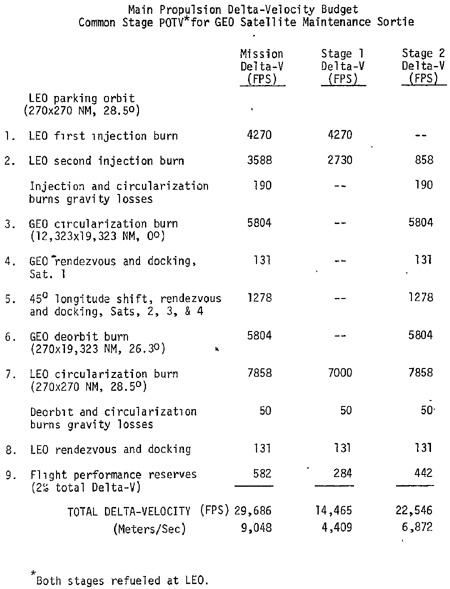 For what it is worth for the Lunar Stay mission, the Apollo Lunar Module descent module used about 2,500 m/s of delta V for the descent and landing, and the ascent module used about 2,220 m/s delta V for the return to orbit. 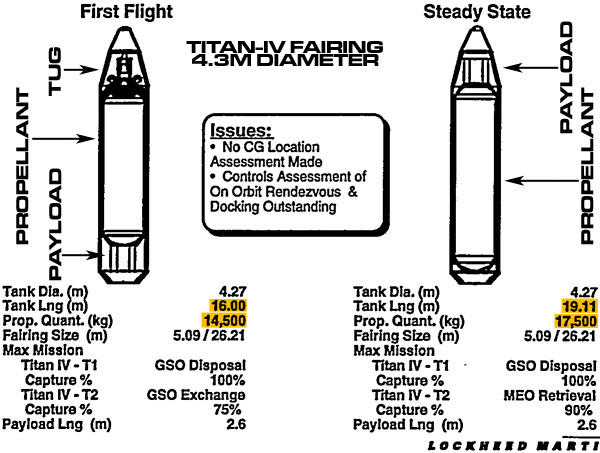 About 4,720 m/s delta V total. Below 1.52 m/s2 (lunar surface gravity) you will crash while landing, and at take-off you will just vibrate on the lunar surface while the rocket blast blows the regolith around. The tug was mandated to be cylindrical. First off they tried to find the optimum diameter. They did an analysis of crew modules which were 3.6, 4.5, and 6.7 meters in diameter, because those are 12, 15, and 22 feet respectively. 4.5 m is compatible with the Space Shuttle cargo bay. 6.7 m is compatible with the Saturn booster. 3.6 m was a smaller sized picked arbitrarily just to see how it worked. 3.6 m was far too cramped, unless they made it two decks tall. 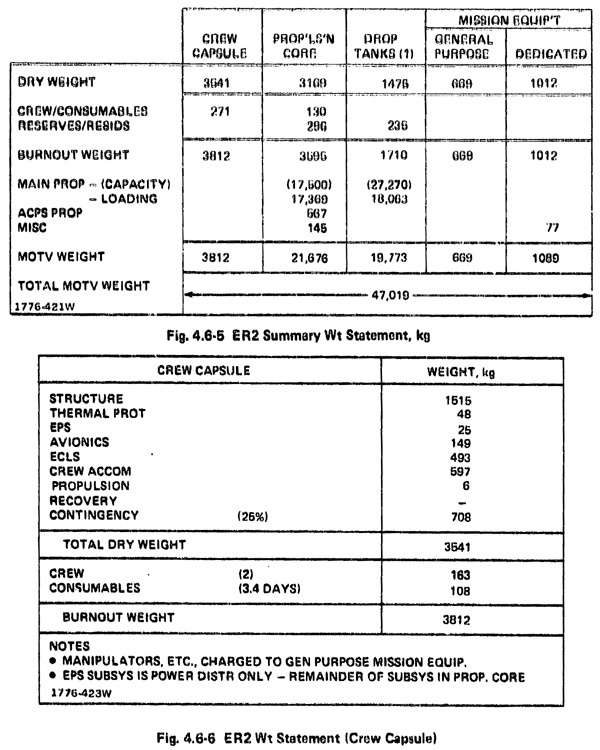 6.7 m was too big to be economic, unless they stuck the contents of other modules into the crew module (which kind of defeats the entire "modularization" idea). By "too big" they mean it gave the crew space they didn't need, which still costs payload mass for the bulkheads and pressurization. 6.7 m is also too big to fit in the Shuttle cargo bay. 4.5 m was just right. 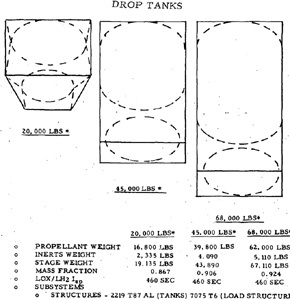 Propellant tanks. Basically a Propulsion module with no engines and no docking provisions. The habitat module the crew lives and works in. This module is optional. The tug can be unmanned, pre-programmed or under remote control. Two man for a control/working module. 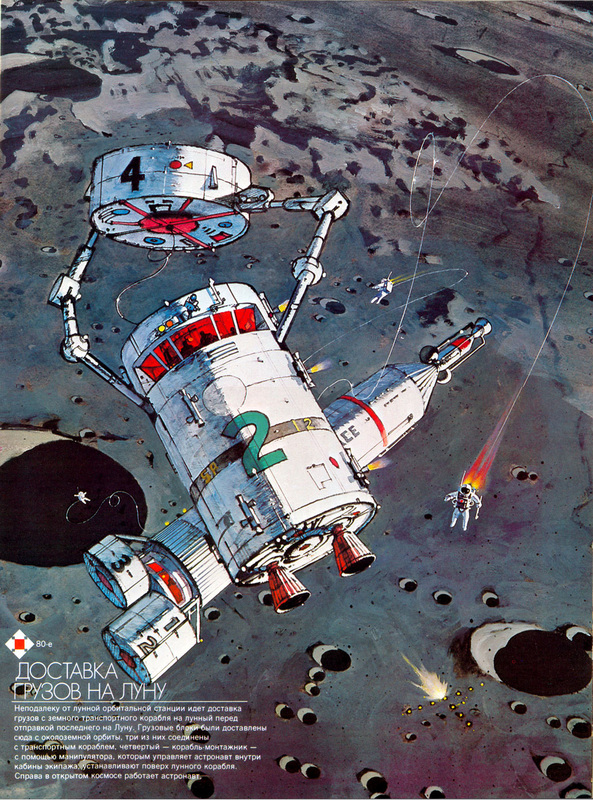 Four man for a lunar base module. Six man for crew transport. Twelve slot for emergency evaculation module. 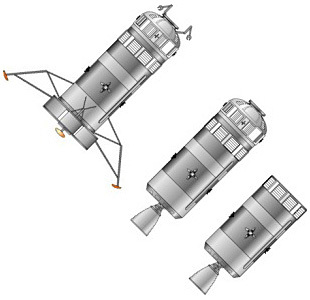 For lunar landers it makes sense to have the crew module on the bottom of the stack, with the landing gear kit attached. The tug's brain and nervous system. Various sized cargo holds to hold, you know, cargo. Often used to transport supplies to space stations and bases. Some CAM are split long-ways (hemipods) in halves or quarters, and are hung on either side of the propulsion moodule like saddle-bags for a low center of gravity (so the lunar lander isn't quite so tippy when it lands). Special and general purpose cargo which is not carried in cargo modules. Satellites to be placed, experiments, etc. Guidance and navigation docking sensor assembly. Attached to foremost surface of tug and payload for active rendezvous and docking capability. Mostly TV camera and contact sensor. Former for maneuvering, latter to signal that the docking clamps can now be activated. 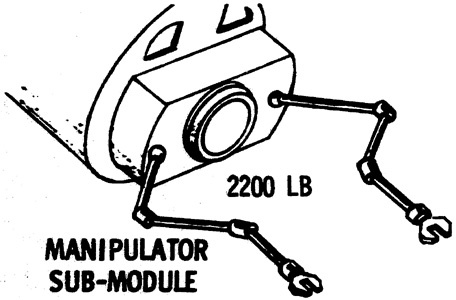 CM manipulator interface assembly. 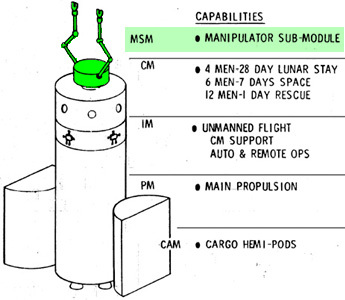 Human-usable controls for the manipulators, placed inside the crew module. 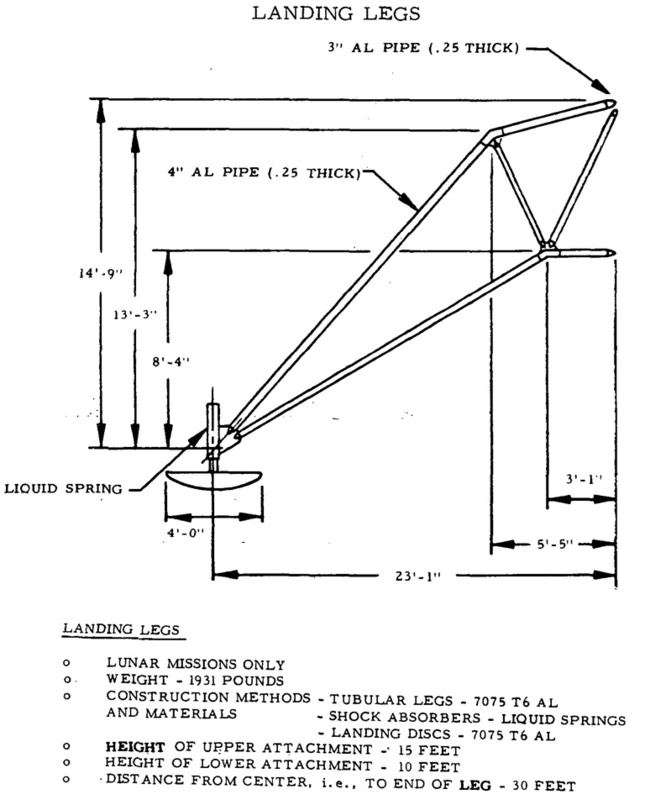 Landing gear (lunar landing). 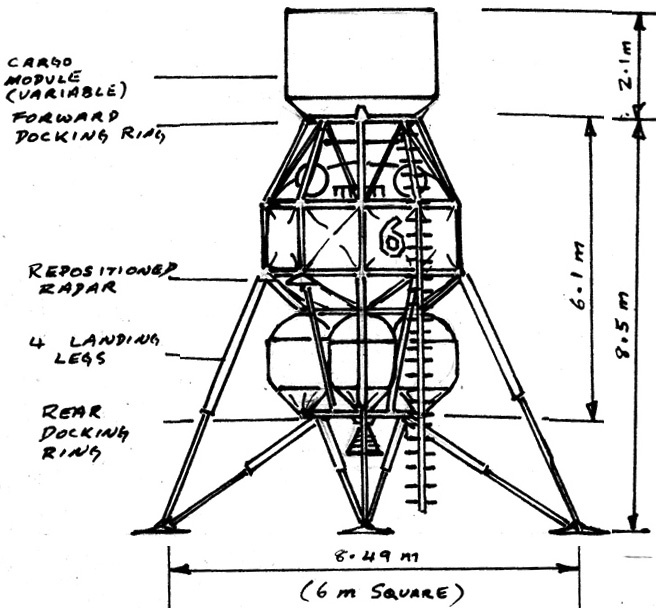 Bottom mounted landing legs. These are generally fixed because it turns out that stowage and deployment of folded gear constitutes a formidable problem. 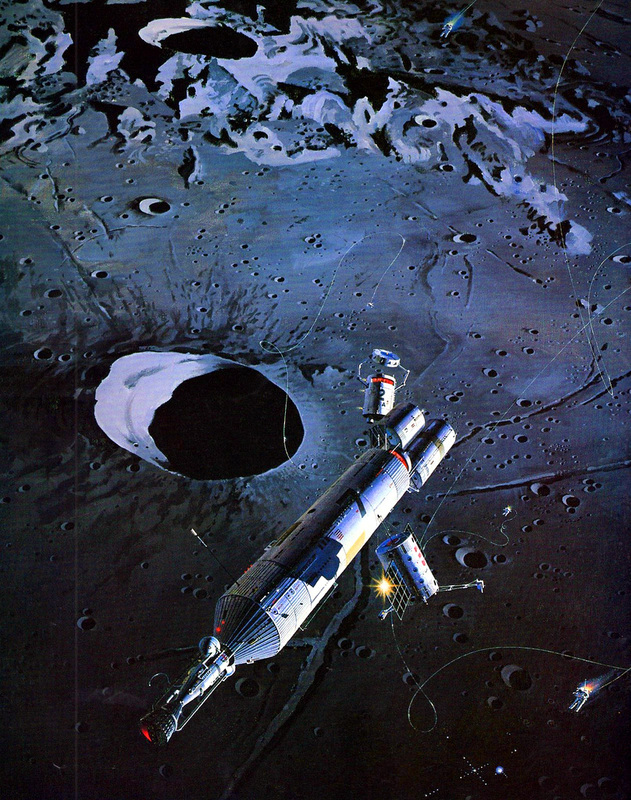 As a general rule you want the gear to be long enough so that at touchdown the main propulsion engine nozzles are at least two exit diameters above the lunar surface. 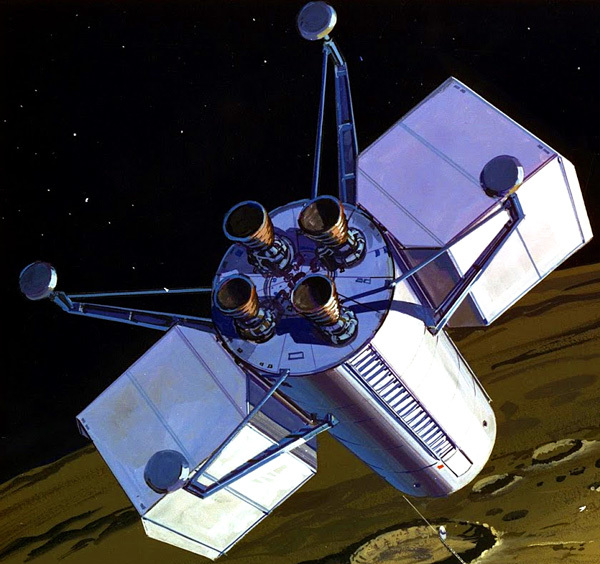 Lunar landing guidance and navigation sensors. 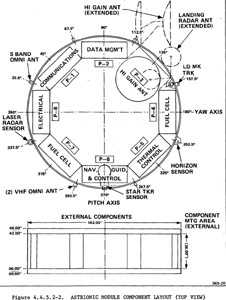 Landing sensor system added to the propulsion module with readouts inside the crew module. Lunar landing heat radiators. Standard radiators are mounted on the hull. 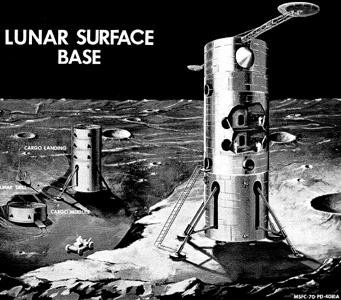 Unfortunately while landed, thermal energy from the sun is reflected from the lunar surface and interferes with the hull radiators. So separate deployable radiators are required, facing the sky. Generally top-mounted. About 28 m2 in two or four panels. Lunar landing antenna. Long-range extensible parabolic antenna (1.8 m diameter) either tug-mounted or portable. Used for additional communication capability. 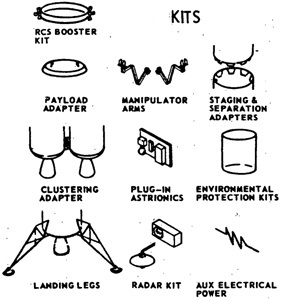 Electrical Power Kit (for IM) for manned missions or payload support. Includes additional heat radiators. 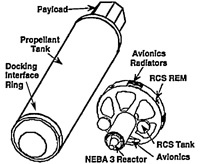 Aerobraking Kit to allow aerobrake assisted Terra reentry and landing. 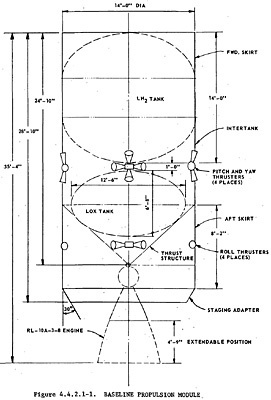 In an earlier design, the intelligence module had the rocket engines mounted in the center, and the IM was placed underneath a Tank Set (containing internally both liquid oxygen (LOX) and liquid hydrogen (LH2) tanks). 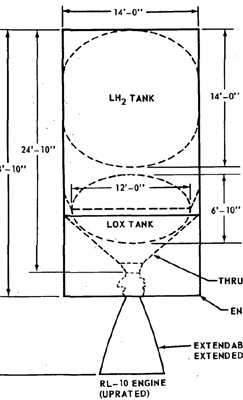 Sometimes there was a dedicated LOX Tank Set and a dedicated LH2 Tank Set. 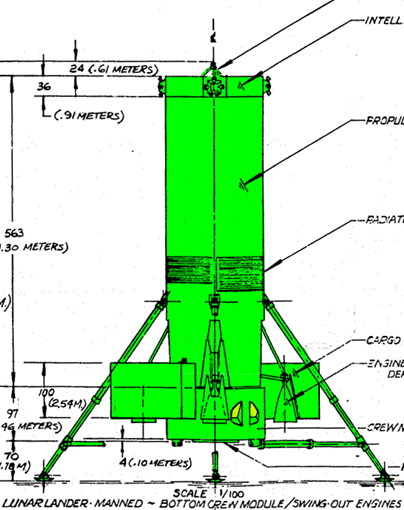 4.5m diameter, height depends upon amount of propellant contained. With no propellant the mass is approximately 3,580 kilograms. The report studied concepts with 36,287 kg of propellant (LOX+LH2) and 28,576 kg of propellant. In all designs the engines are chemical LOX/LH2 engines. The example design had an exhaust velocity of around 4,550 m/s and a specific impulse of 464 sec. 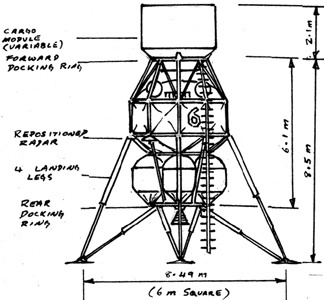 The 4.5m lander design had four swing-out engines each with a thrust of 44,482 Newtons (177,928 N total thrust). It burned at a oxygen/fuel (O/F) ratio of 6 to 1 instead of the theoretical maximum (stoichiometric) of 8:1 (they used 6:1 because of liquid hydrogen's annoyingly low density). 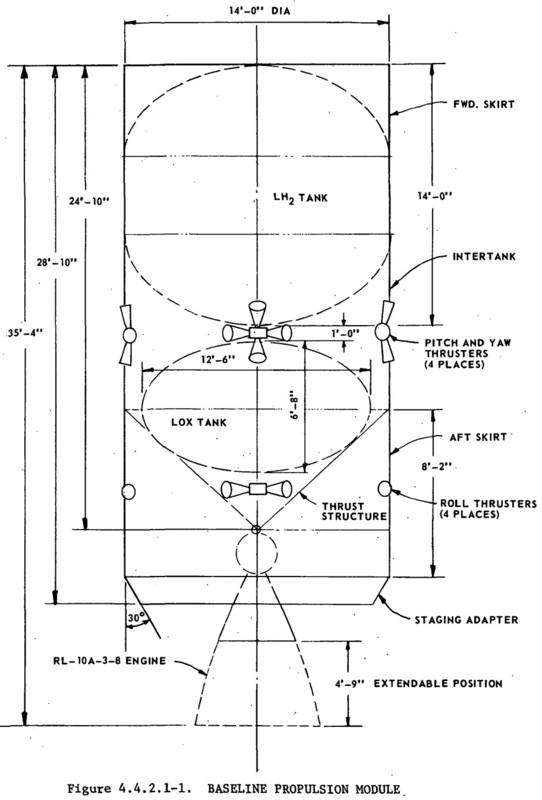 The propellant mass was 36,287 kg or 31,103 kg LOX and 5,184 kg LH2. 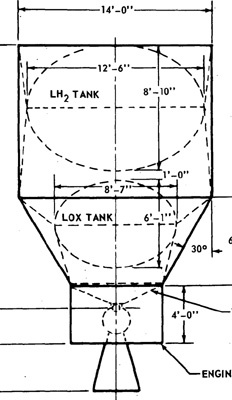 The LOX tank had a volume of 31.1 cubic meters and the LH2 tank was 93.4m3. The PM had a diameter of 4.5m and a height of 13.1m. 4.5m diameter and 2.4m tall. 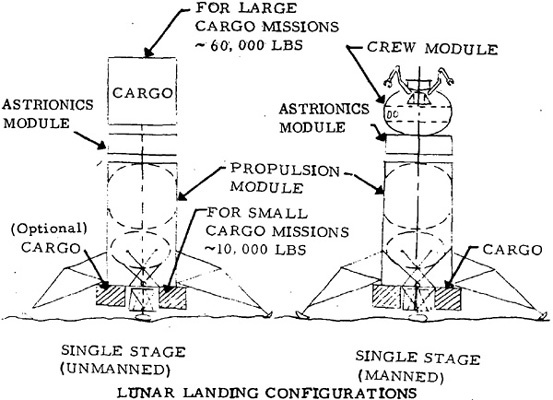 About 3,960 kg for the space mission (6 crew for 7 days) and 5,613 kg for the lunar landing mission (4 crew for 28 days). They did an analysis of crew modules which were 3.6, 4.5, and 6.7 meters in diameter (because those are 12, 15, and 22 feet respectively. 15 feet is compatible with the Space Shuttle cargo bay. 22 feet is compatible with the Saturn booster.). 3.6 m was far too cramped, unless they made it two decks tall. 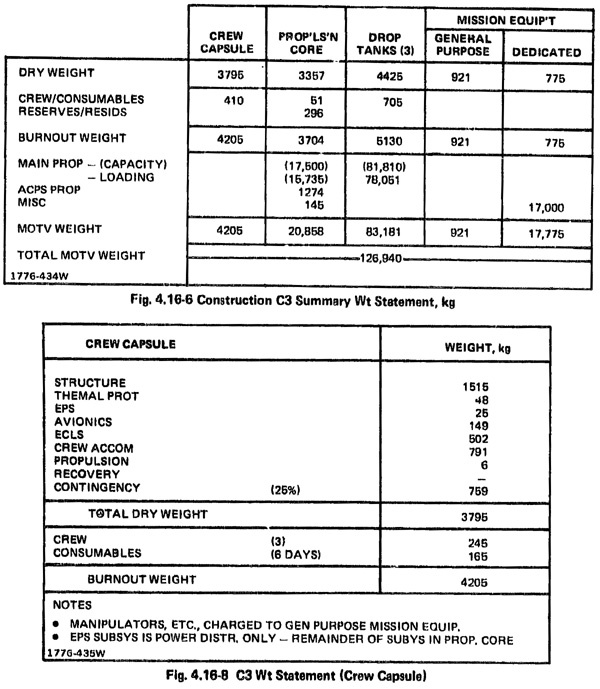 6.7 m was too big to be economic, unless they stuck the contents of other modules into the crew module (which kind of defeats the entire "modularization" idea). Body-structure weight: The weight of the basic and secondary load-carrying members, exclusive of the nonstructural panels used for induced environmental-protection systems. Induced environment protection system. Generally the heat shield on a reentry vehicle. Apparently "Launch, recovery, and docking", so it probably referring to the docking port. Apparently "Power conversion and distribution", so it is probably referring to the electrical power system. These weight breakowns are typically estimates, submitted when bidding for a NASA contract. The Growth Allowance is insurance, in case one or more of the weight estimates for a subsystem is too low. 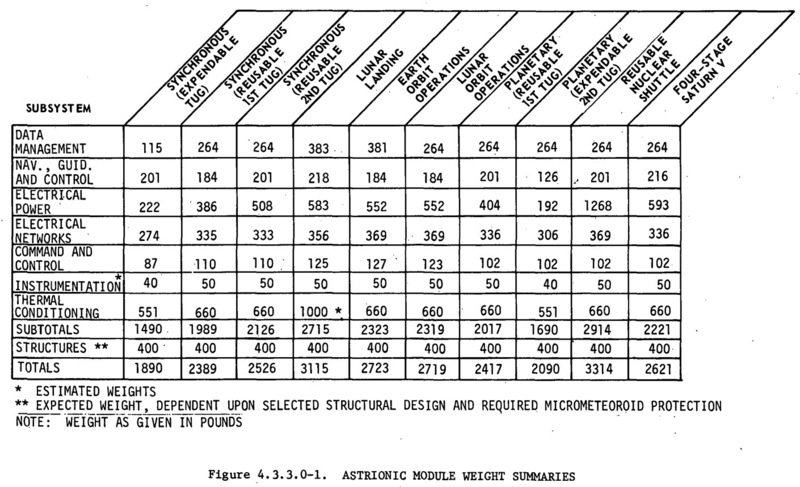 Since every gram counts, NASA is quite intransigent about weight estimates. The growth allowance gives the contractor some wiggle room before they are in violation of the contract. Apparently "Crew stations, controls, and panels", so it is probably referring to the flight control stations. Apparently "Ordinance, compressed nitrogen and tankage", used for atmosphere or to pressurize the fuel cell tanks. Probably EVA suit(s) or the consumables reserved for EVA activity. Current day EVA suits are about 53 kg each. The sum of codes 1 through 16. In this usage, it means the mass of the spacecraft/module with no propellant, payload, crew, or consumables. The sum of codes 1 through 21. In this usage, it means the mass of the spacecraft/module with everything (payload, crew, consumables) BUT no propellant. Which is the exact opposite terminology that I am used to. The sum of codes 1 through 27. The mass of the spacecraft fully loaded with propellant and everything. The "wet mass". 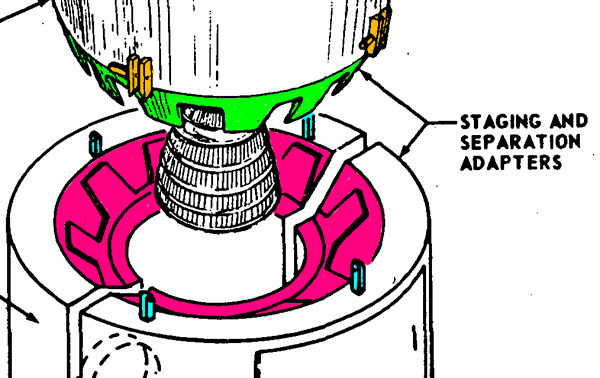 Since the crew module has no propulsion it technically does not have propellant. It appears they are including the fuel cell fuel as "propellant." L.G. = landing gear. 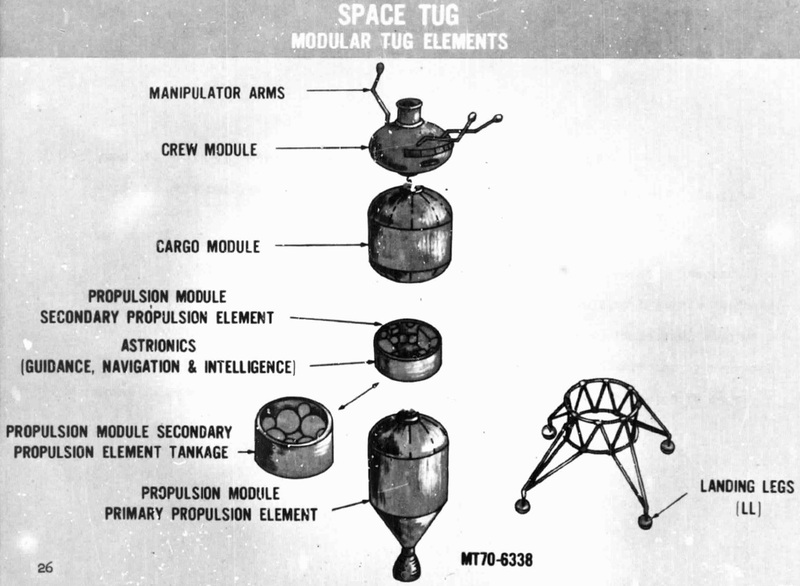 "tare wts" means "something heavy that should not be attached to aluminum foil"
For a Space mission the Space Tug would probably have the crew module mounted on top of the spacecraft stack. There would be a docking port on the top, along with roof windows to assist the pilot with the rendezvous. 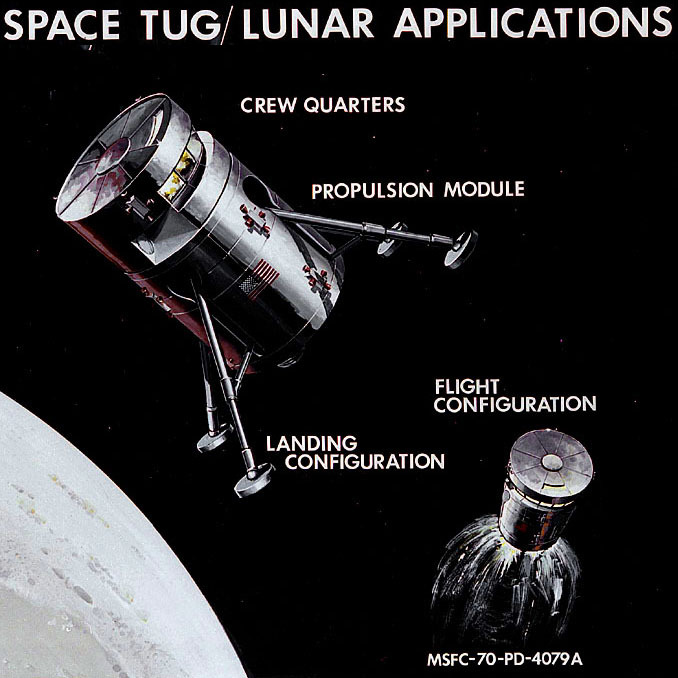 For a Lunar-Stay mission, the tug would probably have the crew module mounted on the the bottom of the spacecraft stack. 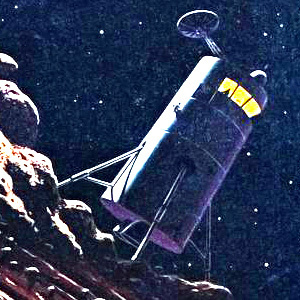 The bottom position would give the pilot a much better view of the landing as opposed to being perched on top of tall spacecraft with no view of what the landing gear (L.G.) was landing on. The landing gear would also be attached to the strong crew module, instead of the aluminum foil thin walls of the propulsion module. 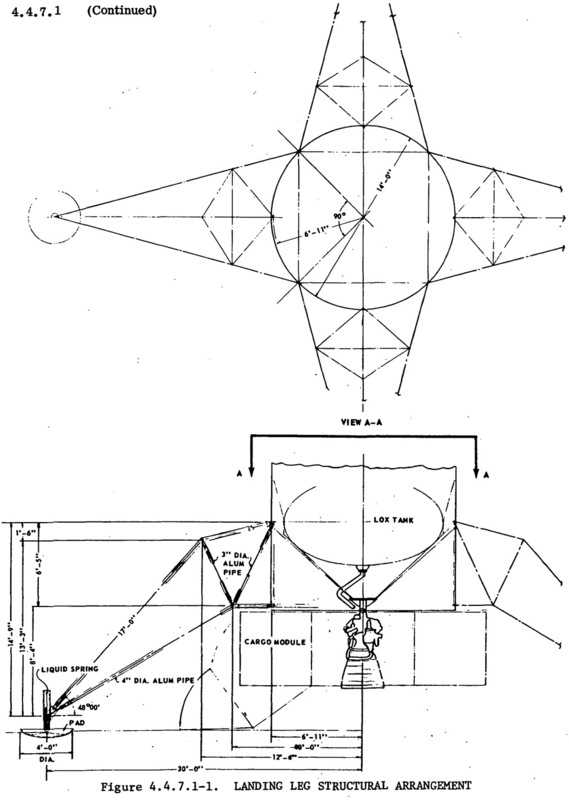 The entire spacecraft would have a lower center of gravity, always a plus when trying to land. Once landed, the airlock door will exit only a meter or so above the surface, instead of tens of meters. 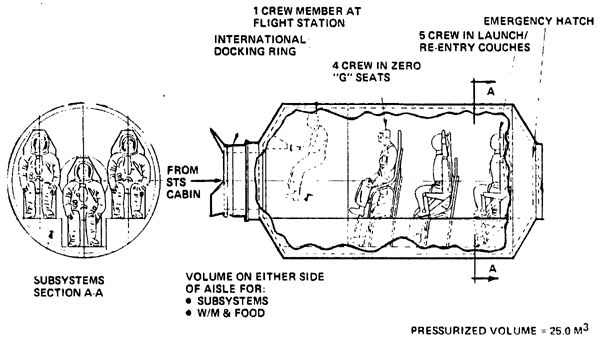 The drawback of course is the crew will have a ring-side seat if the space tug crashes. A short view, only until the mass of the rest of the spacecraft (on top of the crew module) accordions it flat like a beer can in a trash compactor. 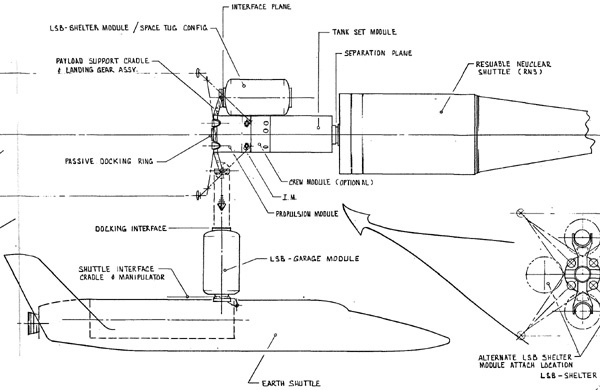 The exhaust nozzles of the propulsion module would be on swing-out engines aimed to fire off the the side instead of hosing the crew module with flaming death. This makes the engine more complex (more points of failure) with a bigger mass penalty. 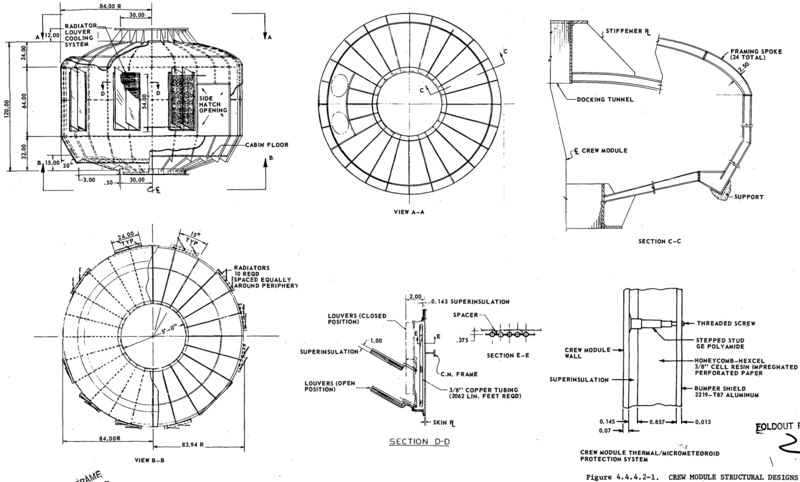 The crew module is an aluminum honeycomb pressure vessel with a centrally located air lock. 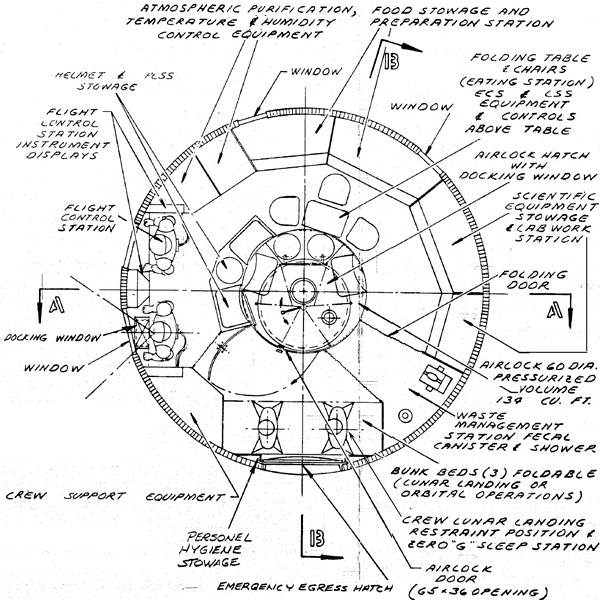 There is also an emergency egress hatch in the side wall of 0.91 meters in diameter. The module has a pressurized volume of 31.85 cubic meters. The control station is a stand-up station similar to the Apollo lunar module. For docking there will be windows for the pilot locate on the roof. 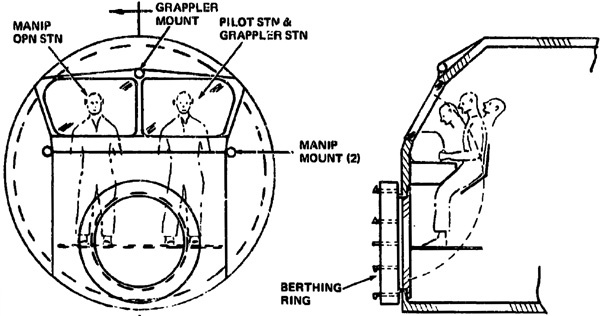 For landing there will be angled windows located on the sidewall, again much like the lunar module. Workstations are chairs with tables. Above the workstation benches are storage cabinets for food preperation, environmental control equipment, and scientific equipment. 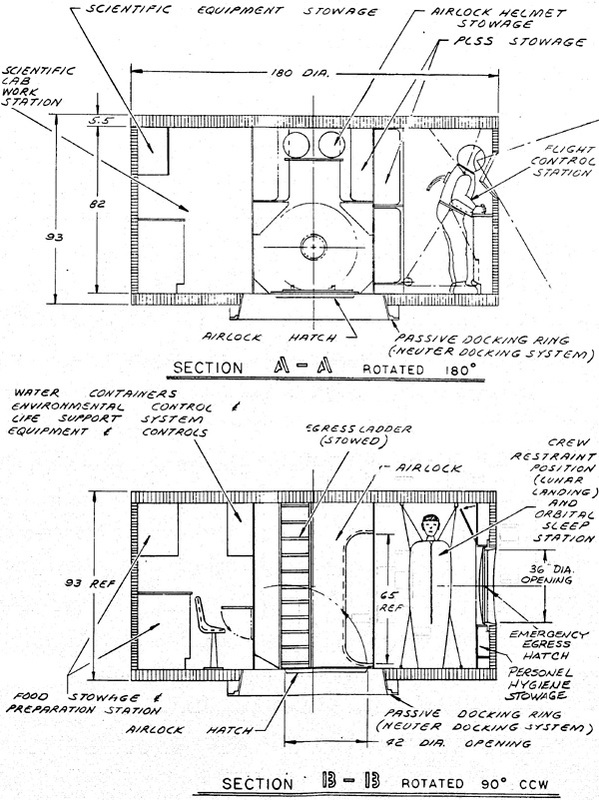 Fold-up bunks are provided on the side walls. 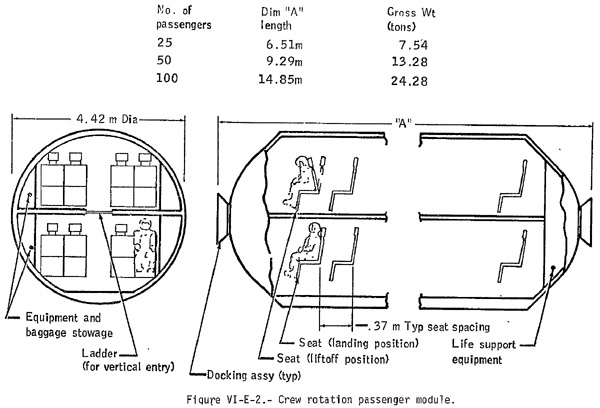 When folded up, the crew module can be used in rescue mode, with space for twelve persons. 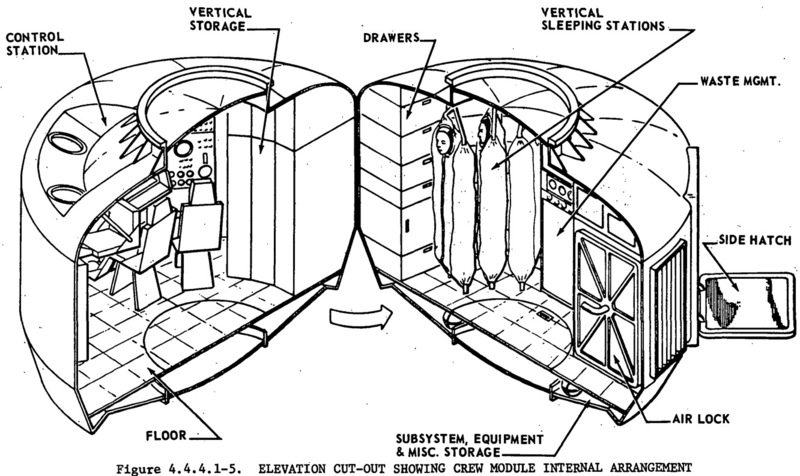 Using fold up bunks is far superior to having a totally different design for a rescue crew module. 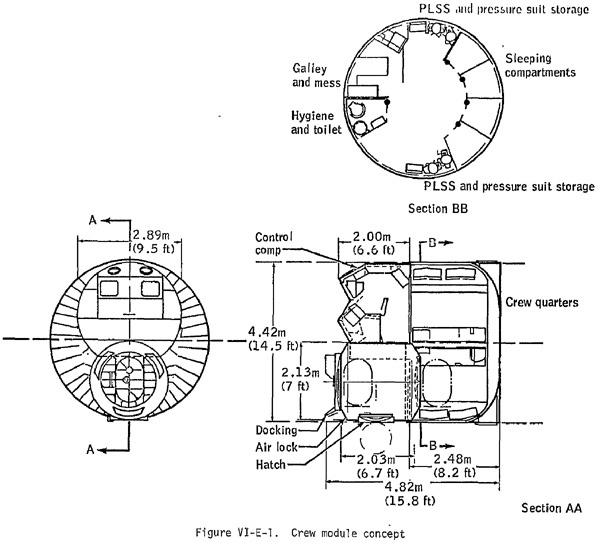 The airlock is 1.5 meters in diameter with a pressurized volume of 3.78 cubic meters. 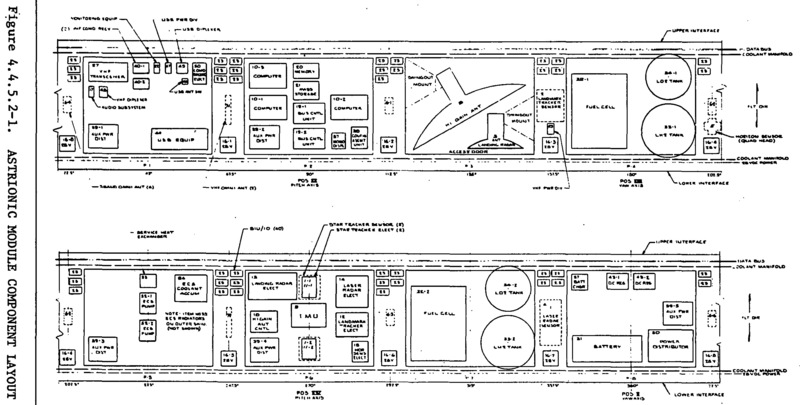 Below are the blueprint for the Space Mission (six crew) and Lunar-Stay Mission (four crew) version. There really is not much difference between the two. Basically the Lunar-Stay Mission version has the extra two bunks removed and replaced by additional workstations. 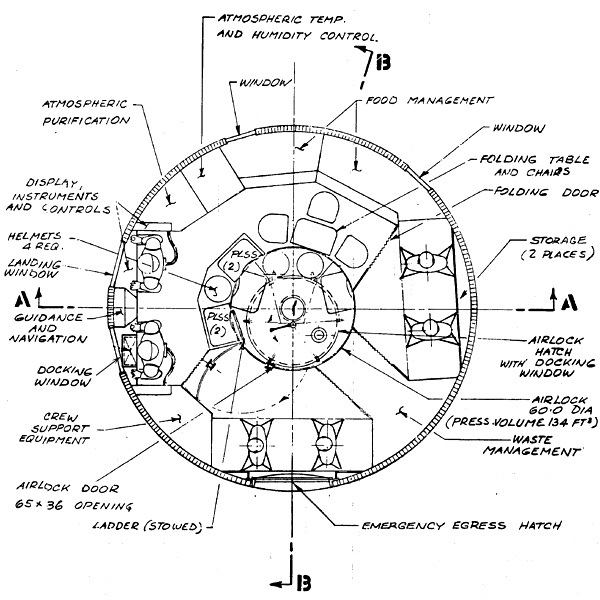 The blueprints show a passive docking ring on the aft end of the crew module. 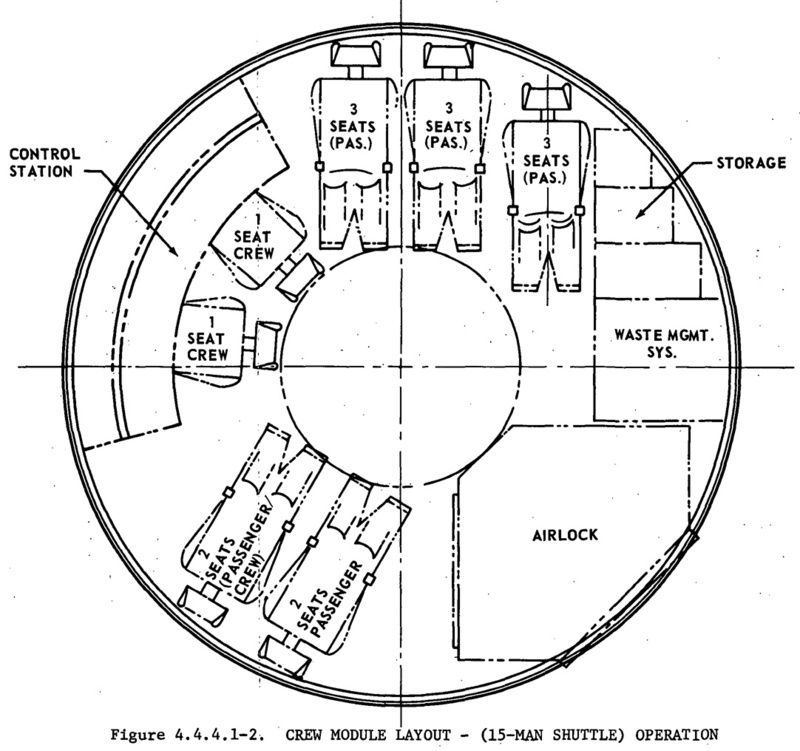 This is the configuration when the crew module is located at the bottom of the spacecraft stack. 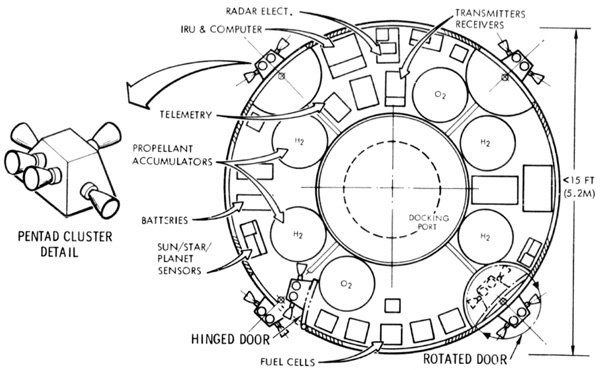 When the crew module is located at the top, the docking ring will move to the roof, and may be replaced by an active neuter docking system. 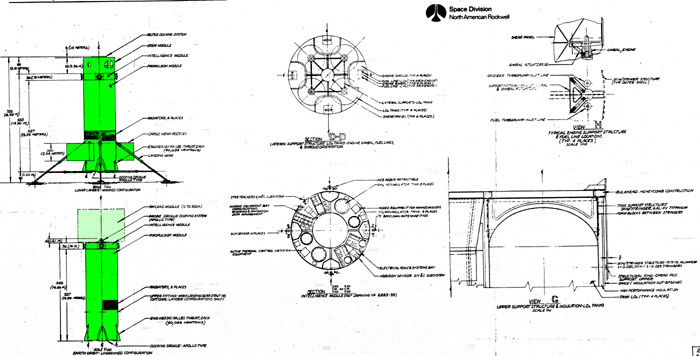 The module is a torus with an inner diameter of 2.03m and an outer diameter of 4.57m diameter. It is 0.9m tall. 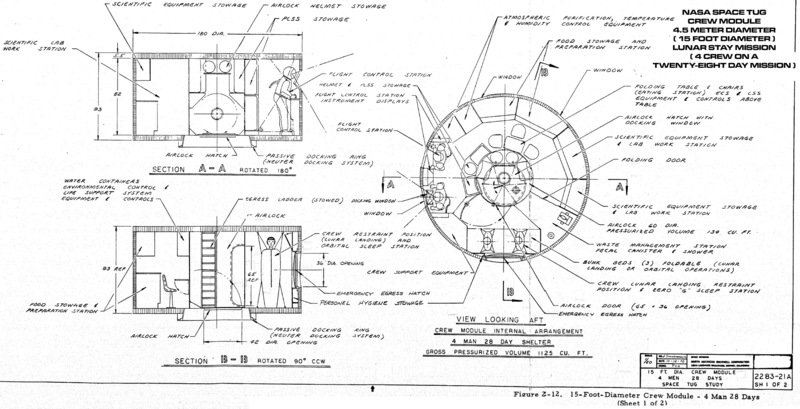 The center hole is for airlocks, propellant pipes, rocket engines, docking ports or whatever. The module has four reaction control system pods. 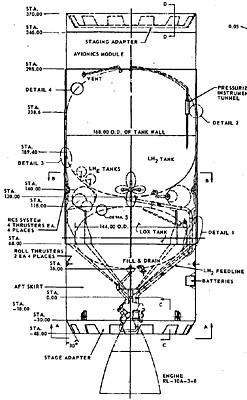 Each pod has four jets: two aft, one forward, one on each side. There are two jets aft so the RCS can also act as auxiliary propulsion. Each pod can retract into the IM to keep the module within the 4.57m diameter limit of the Shuttle cargo bay. IM for unmanned tug 1,560 kilograms. IM for manned Space mission 1,703 kg. IM for manned Lunar landing mission 1,973 kg. Various sized cargo holds. Some are split long-ways (hemipods) in halves or quarters, and are hung on either side of the propulsion moodule like saddle-bags for a low center of gravity. 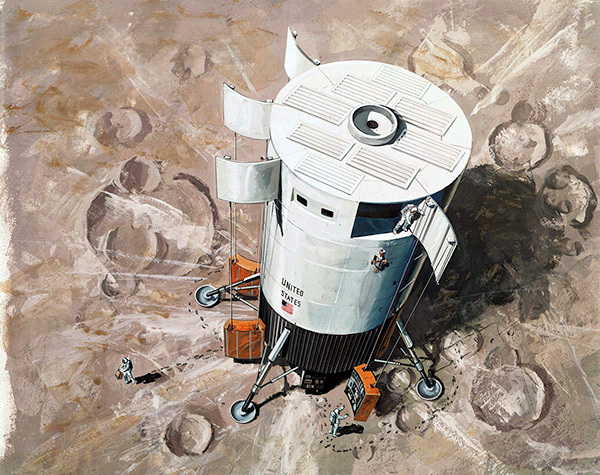 In North American Rockwell's study on constructing a lunar base, they saw a need for a sort of Lunar tractor vehicle with a tall hoist. 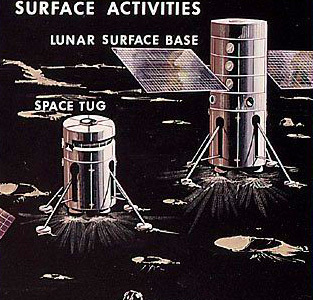 Lunar base modules could be transported down as a unit by the tug, then unloaded and moved into place by the tractor. Base modules are 9.2 meters long, 4.6 meters in diameter, and have a dry mass of 4,500 kilograms. They have docking ports on each end. 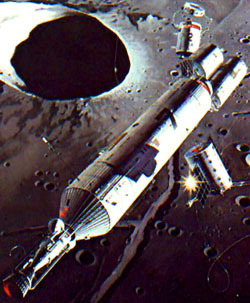 Space tug carries two lunar base modules, each docked to pivoting neuter docking ring. 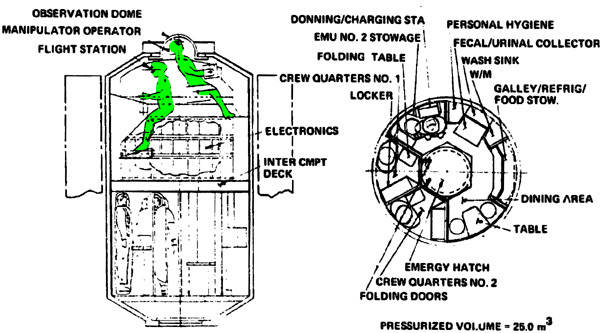 Upon landing, each docking ring can pivot to lower the module close to the lunar surface. 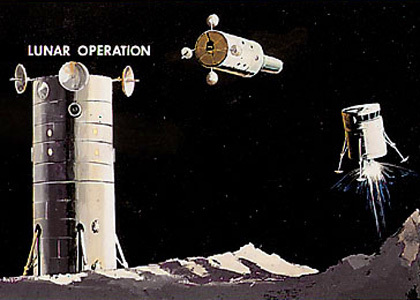 LSB means "Lunar Surface Base"
Reusable nuclear shuttle (RNS) postions itself in orbit. 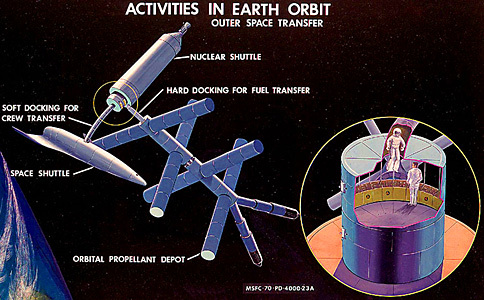 A series of Earth shuttle missions delivers the parts to assemble the mission on the RNS' nose. First the space tug stack, then the payload cradle, the cradle is loaded with the luanr base modules, finally the landing gear kit. 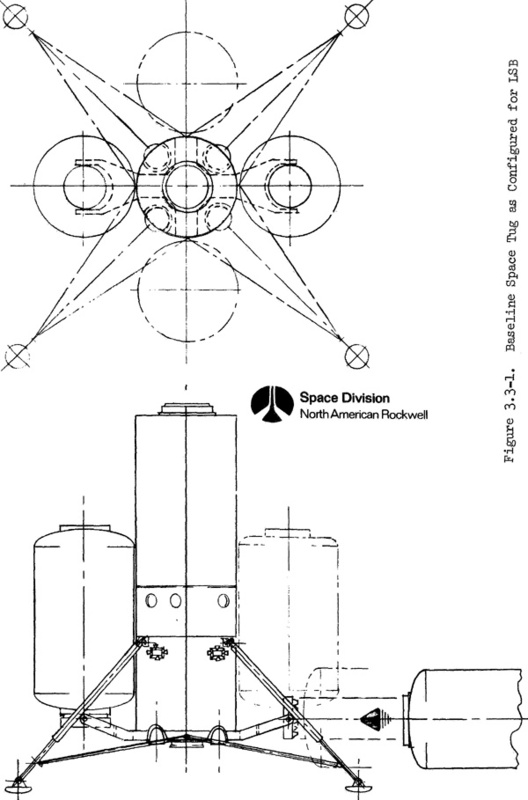 Space Shuttle should being careful to stay within the safe area cast by the RNS shadow shield. Waldo arms for repair, satellite retrieval, and cargo handling. They are either bolted to a module or incorporated into a special manipulator submodule. 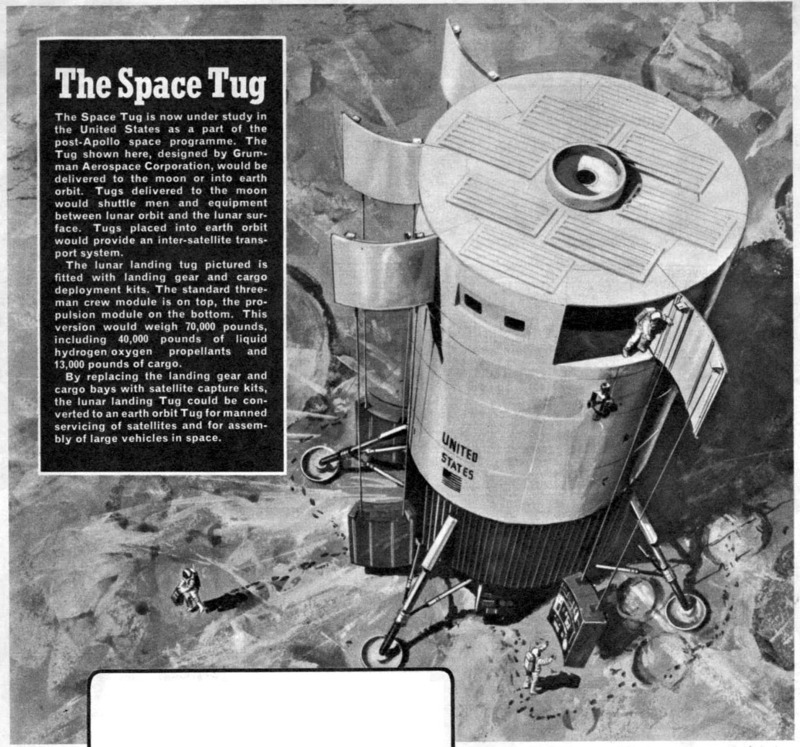 This allows the space tug to land on the Lunar surface. These are generally fixed because it turns out that stowage and deployment of folded gear constitutes a formidable problem. As a general rule you want the gear to be long enough so that at touchdown the main propulsion engine nozzles are at least two exit diameters from the lunar surface. 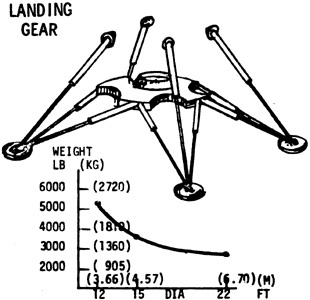 Since landing gear have appreciable mass under acceleration and exert stress when supporting the tug on the lunar surface, they should be attached to load-bearing structures. 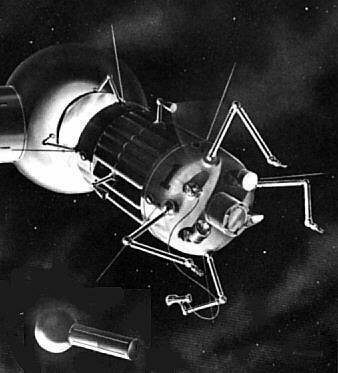 Which is usually not the propulsion module, who have walls made out of aluminum foil. 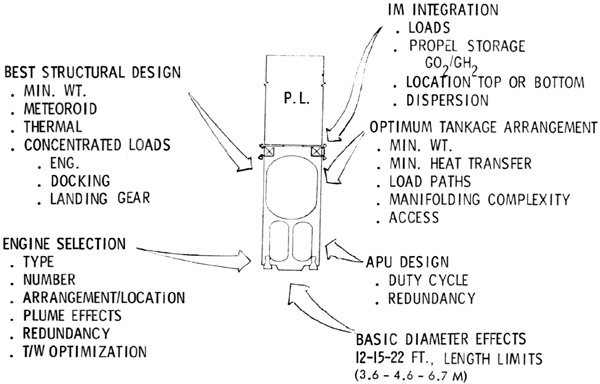 Many lunar landing tug designs have the crew module on the bottom, so the landing gear is attached mostly to the load bearing CM frame, and only partially to the PM. 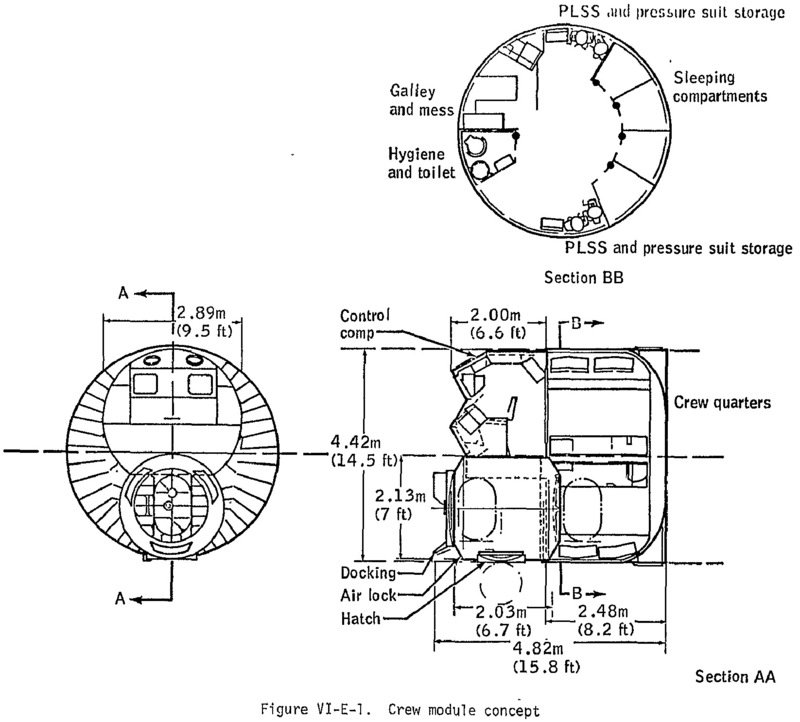 Used to lower crew to lunar surface if crew module is mounted on the top. 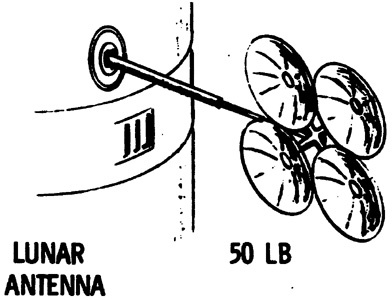 For lunar missions larger antennae may be required for communication with Terra. These are about 1.8 m diameter. Standard radiators are mounted on the hull. 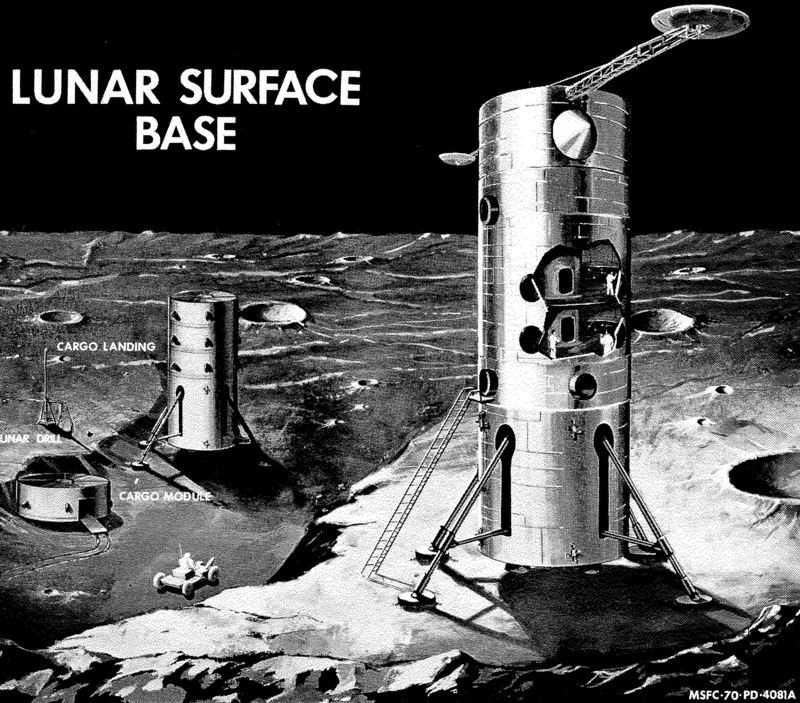 Unfortunately while landed, thermal energy from the sun is reflected from the lunar surface and interferes with the hull radiators. So separate deployable radiators are required, facing the sky. About 28 m2 in two or four panels. They eventually narrowed it down to three configurations: Concept 1, Concept 5, and Concept 11. 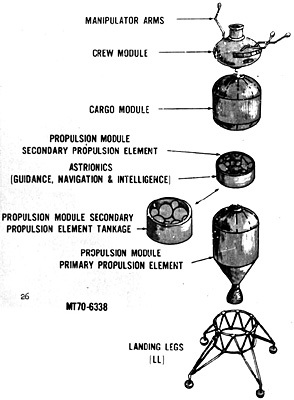 The main difference was how much propellant they carried. The secondary difference is the staging. Concept 1 is a single stage. 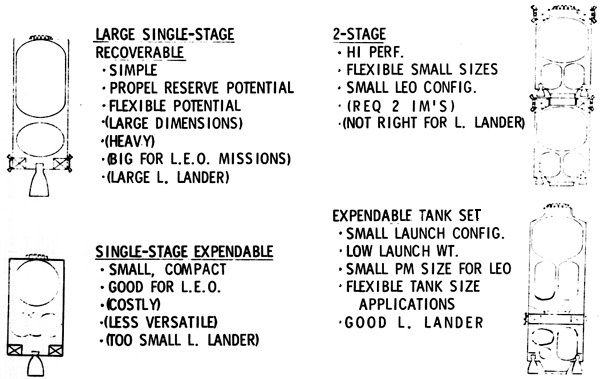 Concept 5 is two stage, with both stages recoverable. Concept 11 is one-and-one-half stage. 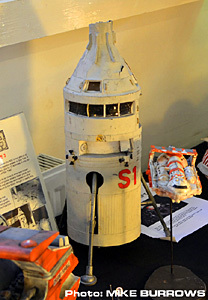 That is, it has a small propulsion module with a small propellant tank joined with a huge disposable tank set. Aux Con = auxiliary consumables mass. Pressurization nitrogen and RCS fuel. 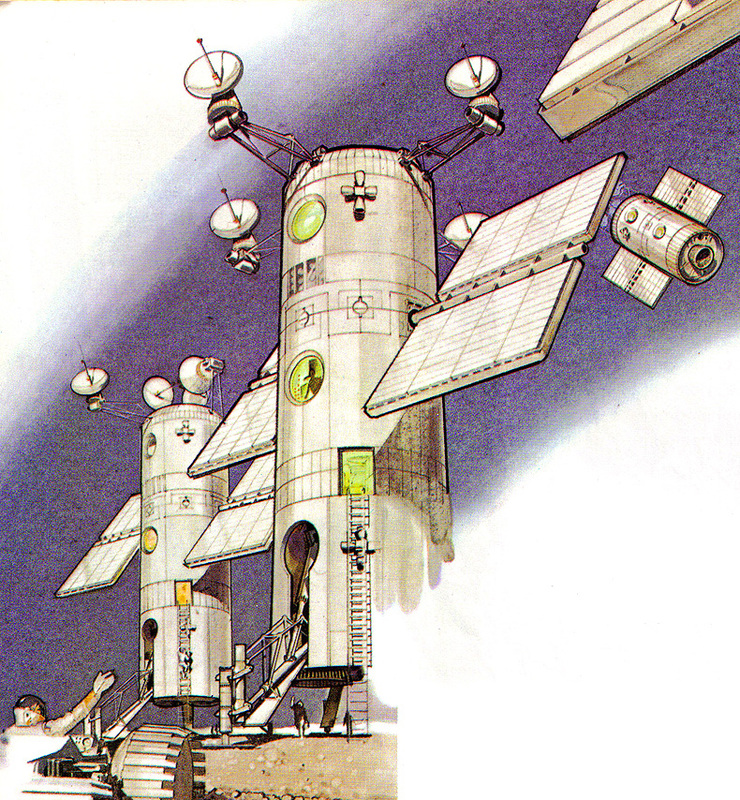 This 1975 design from Dr. R. C. Parkinson was faintly seen in an article The Resources of the Solar System by Dr. R. C. Parkinson (Spaceflight, 17, p.124 (1975)). It was off in the corner of a small diagram. I had an old photocopy of the article in my files since the late 1970's. I supplied them to William Black and he made stunning images of Dr. Parkinson's lighter and tanker. These images attracted the attention of a former colleague of Dr. Parkinson, a certain Dr. James Garry. He kindly introduced us to Dr. Parkinson and provided contact information. 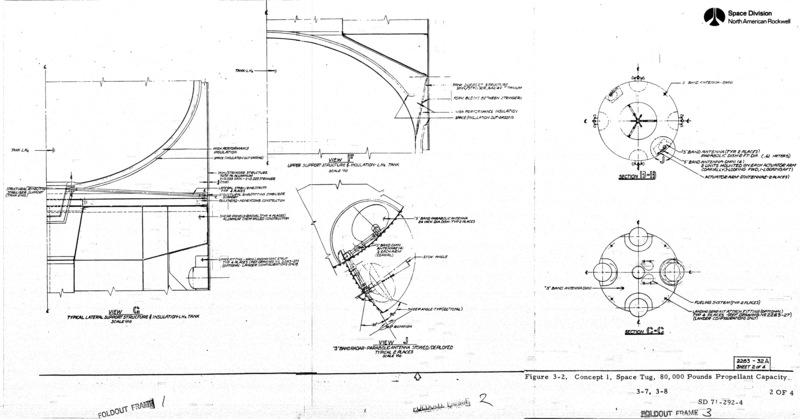 Dr. Parkinson generously supplied us with never before published diagrams and commentary. In his visualization, William Black added additional engineering details. 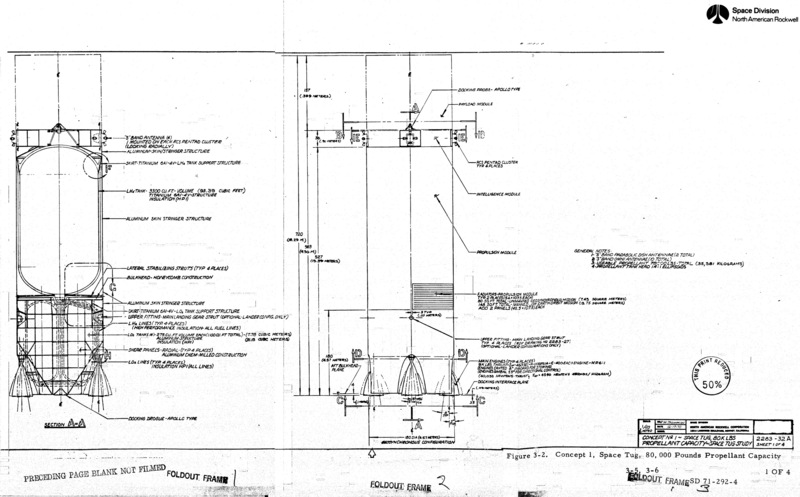 He put more struts to support the reaction-control jets and liquid oxygen tanks. 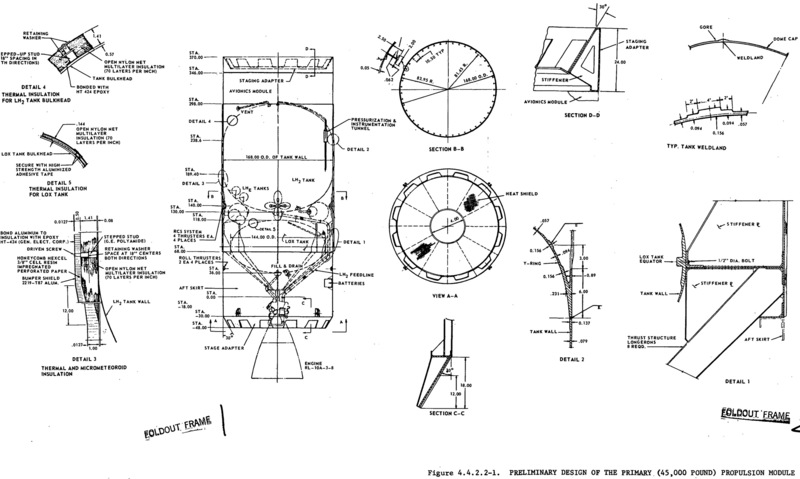 Dr. Parkinson's notes indicated that the manned capsule had its own propulsion, so William added a single gimbaled low-thrust engine. He also added: a high-gain antenna for communications and a radar dish; forward-facing view ports for visual orientation during docking maneuvers; four forward-facing and four aft-facing cameras to aid in docking procedures. 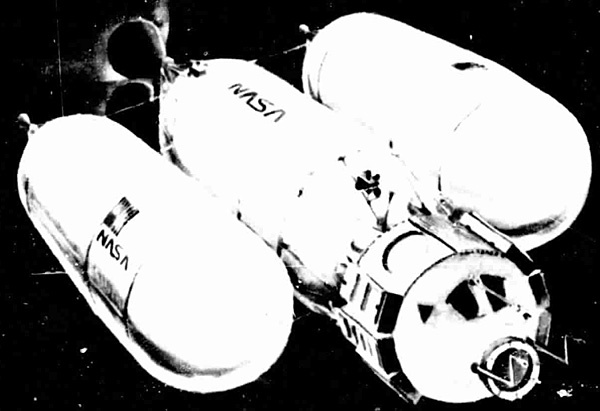 10.4 metric ton space tug. Diagram by Dr. R. C. Parkinson. Extended tug for Lunar landing. Diagram by Dr. R. C. Parkinson. Space tug re-envisioned by master artist William Black. 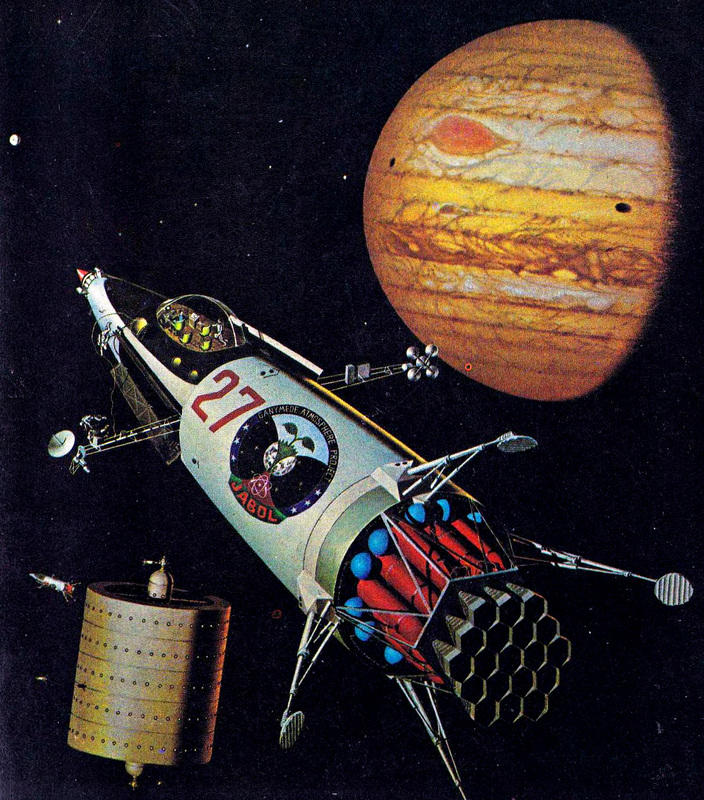 Space tug concept by Frank Tinsley. Tug has grapples and grippers on its stern. 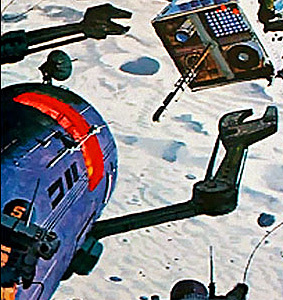 The four square plates around its waist are ion drive units (The crewman's hatch is unfortunately placed right in the line of fire of one of the ion drives). The petals near the bow are heat radiators. Sadly the radiators are spaced too closely. In reality one would want two radiators at 180° or at the most four radiators at 90°. The arrangement shown would have the heat from one radiator impinging on its neighbors. And at the tip of the pointed prow would be the tiny nuclear reactor. It would be nice to include a small shadow shield to protect the crew from nuclear radiation. This is from Robust Lunar Exploration Using an Efficient Lunar Lander Derived from Existing Upper Stages and A Commercially Based Lunar Architecture, both from United Launch Alliance (ULA). 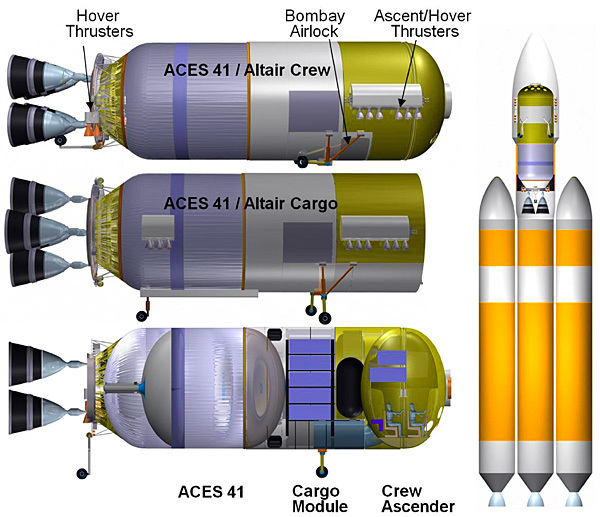 The ULA's Advanced Common Evolved Stage (ACES) is basically a ULA standard propulsion bus. The idea is to avoid relying upon gigantic expensive launch vehicles such as the Ares_V (not to mention the fact that the Ares V doesn't exist yet). ULA proposes using the tiny ACES refueled with the miracle of orbital propellant depots so that smaller inexpensive commercial launch vehicles can be used instead of the expensive Ares V.
Without the support of orbital propellant depots, the ACES would have to lug along all the propellant needed for the entire freaking mission. 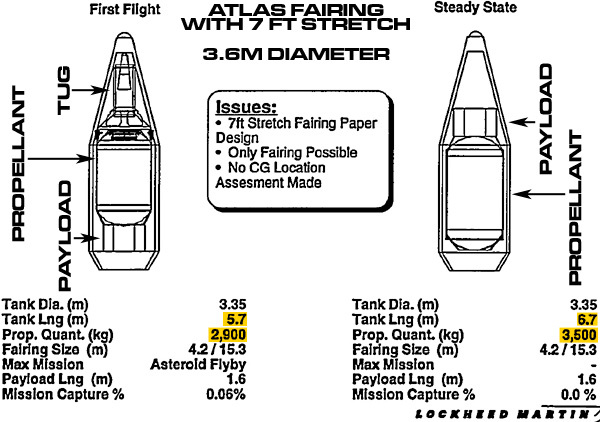 Since Every gram counts, this would bloat the ACES design to the point where there was no choice but to use the pricy Ares V.
According to the second ULA report: "This strategy leads to high infrastructure utilization, economic production rates, high demonstrated reliability and the lowest possible costs." 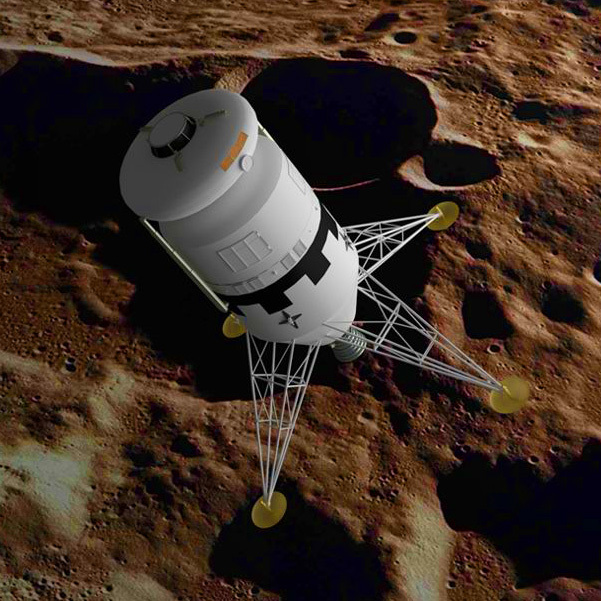 It will also help develop the infrastructure needed not only for Lunar operations, but also missions to Near Earth Asteroids and Mars. 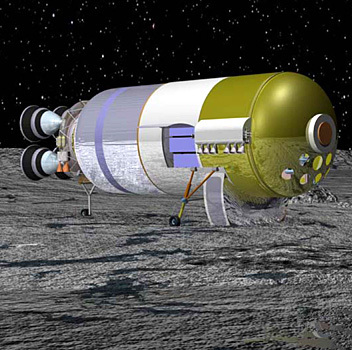 Establishing a propellant depot at the Terra-Luna L2 point will assist exploration outside of the Terra-Luna system. Since 75% of the mass being boosted to LEO is propellant, it is cheaper to use commercial launch vehicles. 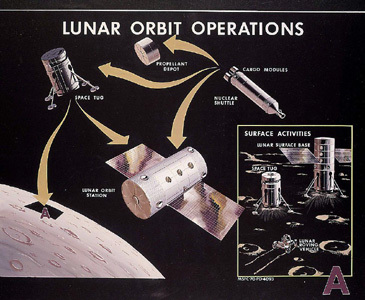 This also encourages conducting lunar exploration as a continuous process instead of a series of disconnected missions. 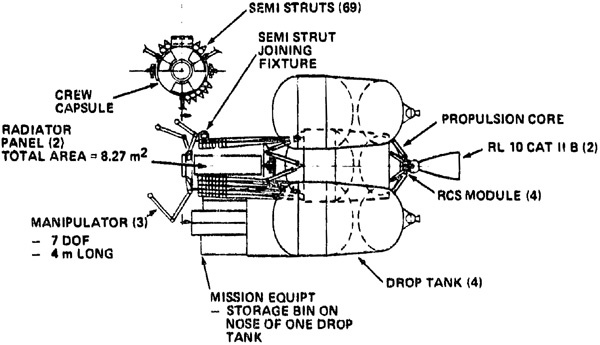 In addition to using propellant depots, the strategy includes using a common propulsion stage, the ACES module. Ideally the various components of the ACES should be commodities, that is, be off-the-shelf components available from several companies instead of just from ULA or NASA. 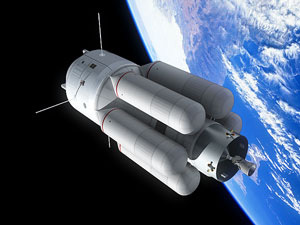 The ACES module uses its basic liquid hydrogen/liquid oxygen for main propulsion, propellant pressurization, RCS, power from fuel cells, and heat radiators. By using LH2/LOX for everything, it reduces the number of points of failure. E.g., helium tanks to pressurize the propellant, MMH/NTO for RCS, and solar panels for power are just three more systems that can break. ULA's buzzword for this concept is Integrated Vehicle Fluids. 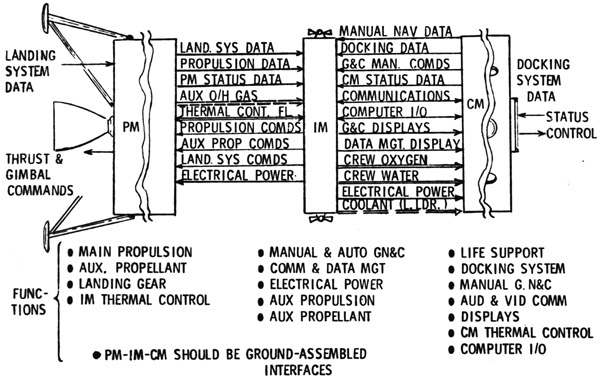 This makes the ACES module a valuable component of a modular design spacecraft. It is doing its level best to be an "Instant spacecraft kit - just add payload". 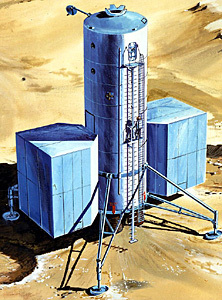 The basic unit is the ACES 41 unit, containing 41 metric tons of propellant (liquic oxygen and liquid hydrogen). 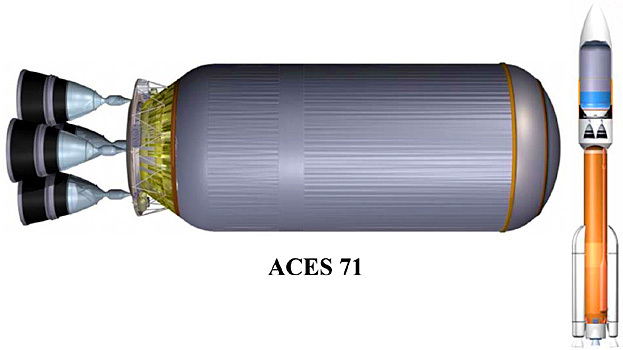 The "stretched" version, the ACES 71 contains, you guessed it, 71 metric tons of propellant. The stretching of the design is possible since all the subsystems are concentrated on the aft-mounted equipment deck, just forwards of the engines. All that needs to be done is add side-wall segments. Due to the clever planning of the orbital propellant network, only a 41 and 71 metric ton design are required. They can handle all the necessary tasks in the mission plan. 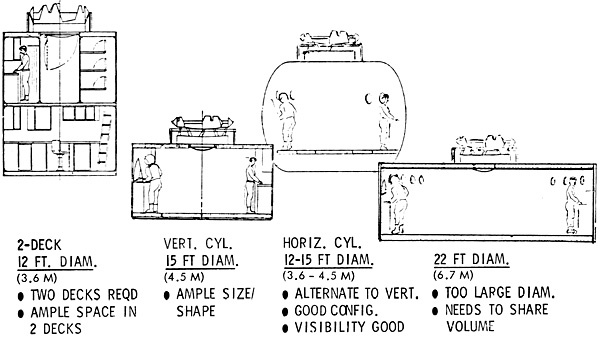 The tank has a diameter of 5 meters. It drastically reduces cryogenic propellant boil-off by a variety of methods: tank geometry, low conductivity tank structures, passive thermal protection, and vapor cooling. In addition the cryogenic propellant is subcooled so it can last longer. The tank's exposed surface is covered by a thick multi-layer insulation blanket, to reduce heating from Terra or Sol. As preveviously mentioned, the ACES has no helium pressurization system, hydrazine fed RCS, nor solar power panels. 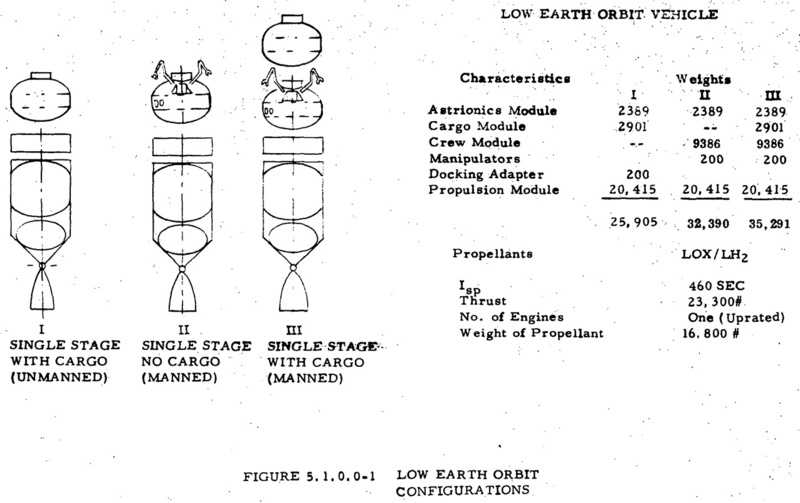 Instead these functions are performed using the already present supply of LH2/LOX. 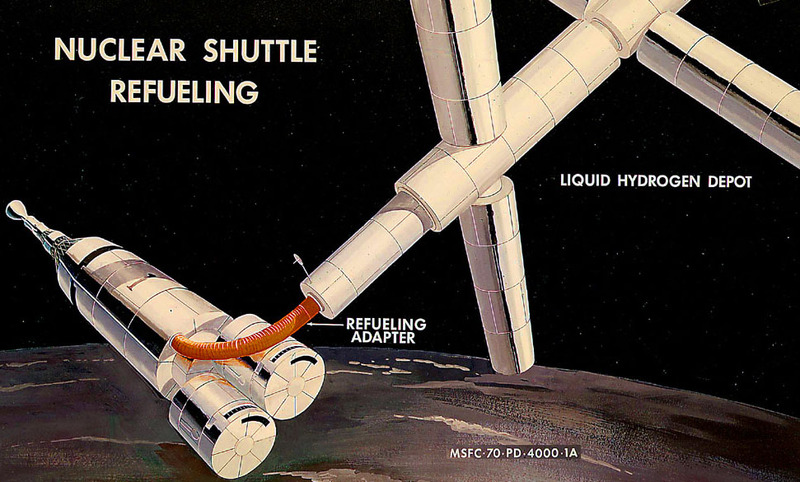 But the major feature is the tanks are designed to be refilled with propellants once in space. Practically no existing spacecraft can do this, but it is a sine qua non for utilizing orbital propellant depots. ACES mounts 2 to 4 RL10 rocket engines. Add to an ACES 41 an environmental control and life support system (ECLSS) Module and an Orion Crew Module, and you have an Orion spacecraft. The ACES 41 is acting as a "service module" for the Orion Crew Module. 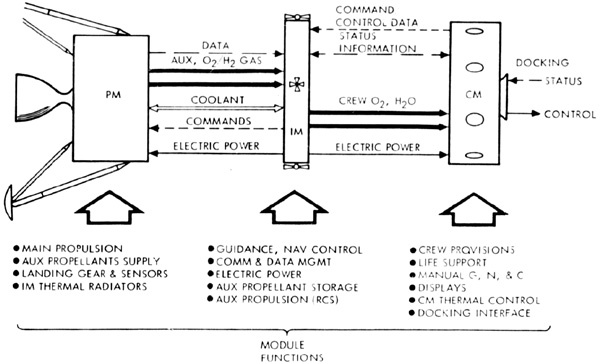 The ACES provides the propulsion, half of the RCS (other half is on Orion), electrical power, and heat radiator. The ECLSS provides the Orion Crew Module with N2 replenishment, CO2 scrubbing, and voice communication. This is a "stretched" version of the ACES 41, the ACES 71 contains 71 metric tons of propellant. It will be used as a propellant tanker (71 metric tons of propellant) used to supply depots, and as the LH2 storage section of an depot (14.6 metric tons of liquid hydrogen). L2 Orbital Propellant Depot with Orion and Altair spacecraft docked. This is an ACES 41 mated to a modified ACES 71. The ACES 71 section will be used for LH2 storage, and the ACES 41 section will be used for LOX storage. 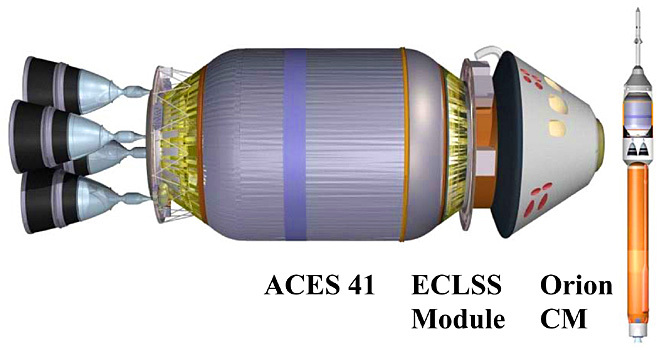 The modified ACES 71 component has the bulkhead between the liquid hydrogen (LH2) and liquid oxygen (LOX) shifted in order to maximize LH2 storage. The engines are removed and a deployable sunshield is installed. The depot has multiple interfaces for transferring propellant to and from the depot tanks. It can also supply power and support services to docked vehicles for extended periods. Yes, I am aware that other experts are of the opinion that L1 is superior to L2 when it comes to siteing Terra-Luna propellant depots. 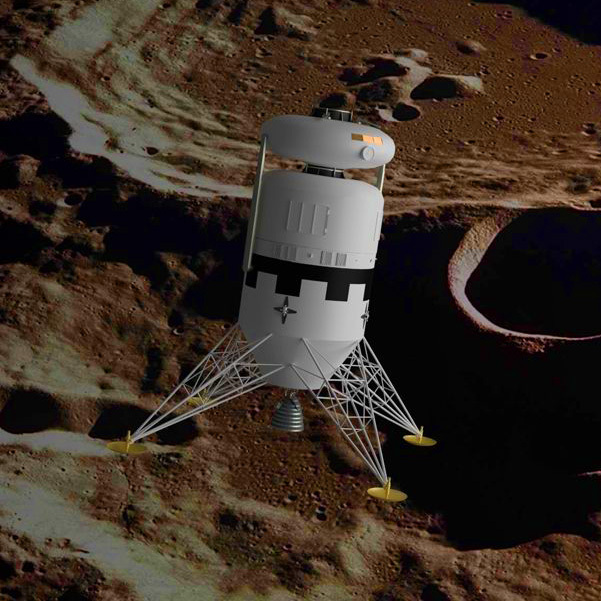 However ULA wants the depot at L2 to assist missions to Mars and other points outside the Terra-Luna system. An L2 depot can replace an L1 depot, but an L1 depot cannot replace an L2 depot. The entire depot structure (both ACES 41 and ACES 71) is launched with the ACES 71 section empty, so the external insulation can be optimized for vacuum operations (as a depot) instead of needing foam cladding to deal with atmospheric heat. Since the ACES 71 empty shell, it has a mass of only 12 metric tons. After launch into LEO, the ACES 41 section will have about 20 metric tons of propellant left. It will transfer the residual LH2 into the ACES 71 tank, vent the local tank, then fill the newly emptied local tank with the residual LOX. 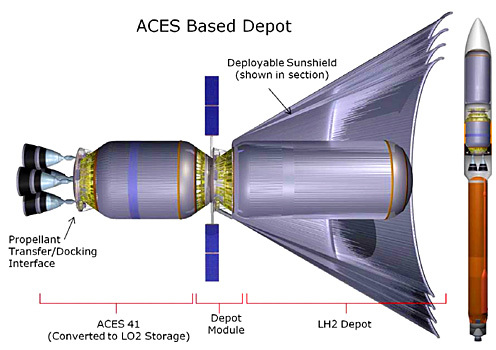 Remember that the ACES 71 section is for LH2 storage while the ACES 41 section is for LOX. The depot will become the LEO orbital depot. Subsequent launches will fill the tanks and keep them filled. The second depot launched into LEO is destined to be installed at L2. 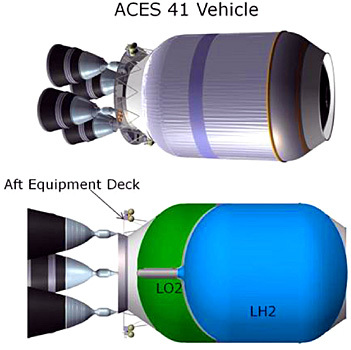 Once it reaches LEO, the ACES 41 section will be refueled with both LH2 and LOX, since it will be used as a tug. The ACES 71 section will just be filled with LH2 since it is basically payload. The ACES 41 section transports the entire depot to L2. The L2 depot will be kept topped up by periodic visits from a propellant tanker based on an ACES 71. 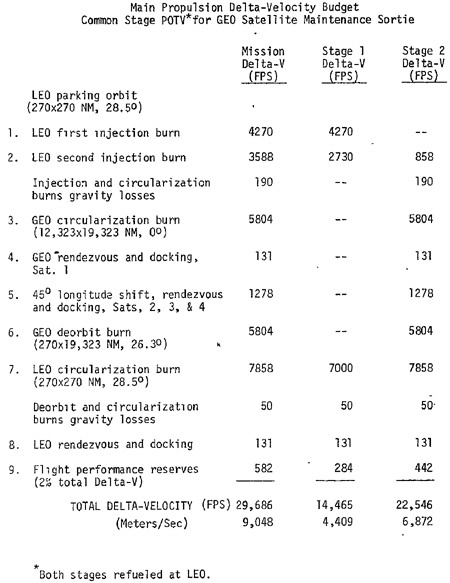 EAch LEO to L2 trip will deliver 29 metric tons of propellant to the depot. Temperature conditions are very different in LEO as compared to L2. LEO is a hot place, with thermal radiation from Terra heating up the depot tanks and boiling off propellant. L2 is relatively cold. The depot uses a passive thermal protective system. It deals with the problem by being designed to primarily boil-off and vent gaseous hydrogen (since it has about ten times the thermal capacity of oxygen). It will boil-off about 27 kilograms a day. The liquid hydrogen is used to cool off the liquid oxygen, in other words. As it turns out, objects in LEO need lots of RCS action to keep the depot in its assigned spot and not falling out of orbit to a fiery doom or something like that. The boiled-off gaseous hydrogen can be used in RCS attitude jets to prevent that unhappy fate (Isp of 390 seconds, about 2 to 3 m/s of delta V per day). The boil-off and station-keeping needs can be balanced. At L2 the heating rate is far less, boil-off of only one kilogram a day or so. Luckily at quasi-stable L2 the station-keeping requirements are also low. The LEO Depot will lose about 10 tons of liquid hydrogen a year. However, since the plan has over 300 tons of propellant transfered through the LEO Depot in a year, the heating loss is less than 4%. 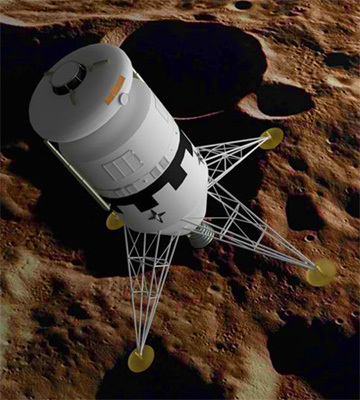 For Lunar operations, a belly lander spacecraft based on the ACES 41 propulsion bus will be used. This is called the Dual Thrust Axis Lander (DTAL) since it has two thrust directions: aft like a tail-sitter, and dorsal like a belly-lander. The DTAL-R is a robot controled cargo landing vehicle, the DTAL-Crew is a manned cargo landing vehicle. 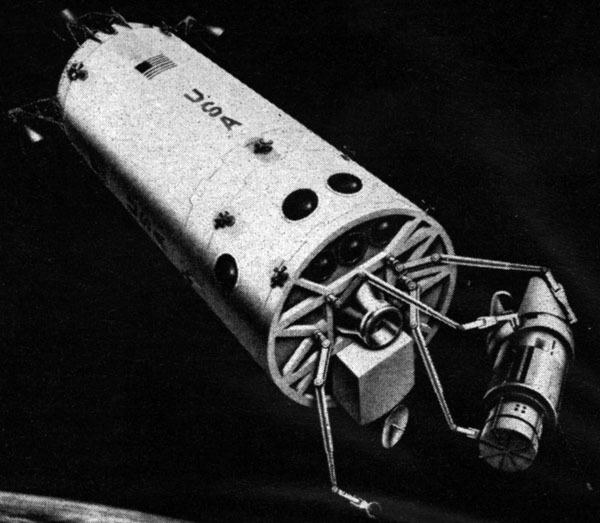 The ACES 41 is mated to a cargo bay, then topped with either a (robot) Lunar Cargo Module or a (crewed) Crew Ascender Module. Banks of 4,500 Newton lateral (hover) thrusters and belly-landing gear are added for final hover and landing phases. 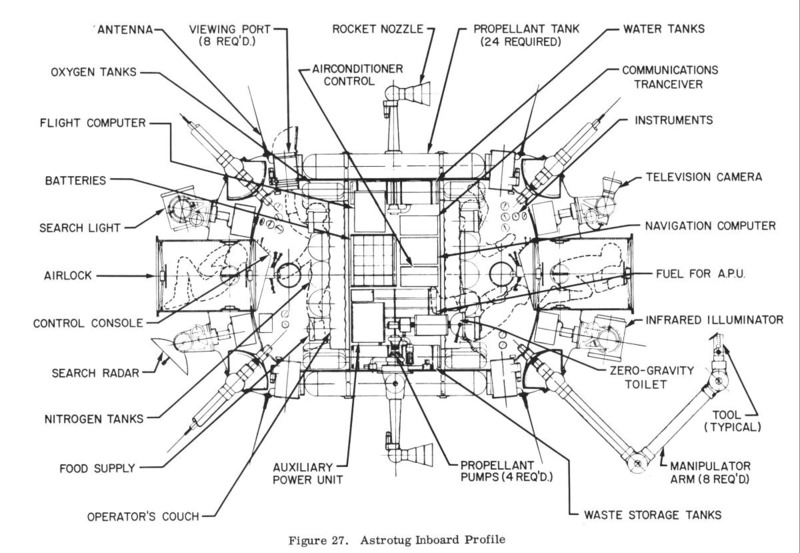 Note how Altair Crew has aft hover thrusters mounted on thrust frame, while Altair Cargo has them mounted on the propellant tank. 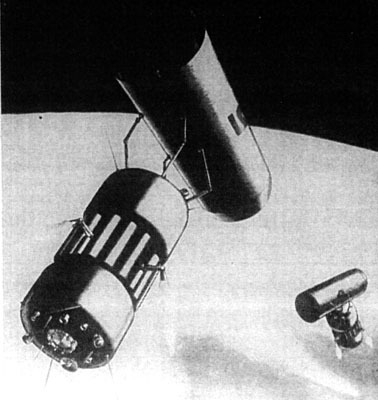 Due to the tall propellant tank and long high-expansion area nozzles, the cargo would be over six meters off the lunar surface if the spacecraft landed on its tail. That is a long way to winch down cargo. Making the spacecraft a belly lander puts the cargo conveniently much closer to the surface. 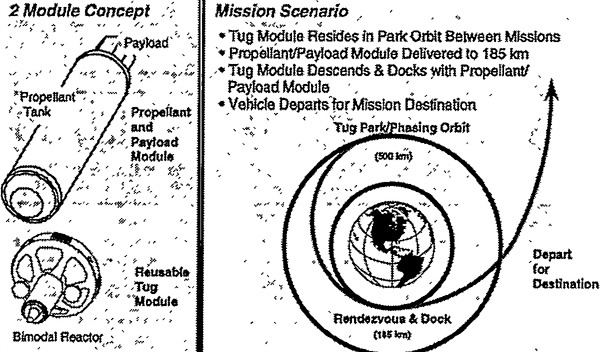 In ULA's master plan there are seven "tasks." Tasks 1, 2, and 3 are the Logistics Stream, they are handled by commercial space services. They are mostly concerned with the orbital propellant depots. Tasks 4, 5, 6, and 7 are the Crew Transport Stream, and they are handled by NASA with help from contractors. They are mostly concerned with astronauts and exploration missions. The important point is that the two streams are not closely coupled, they need only loose choreography. So the commercial services keeping the depots topped up do not need to keep close tabs on what NASA is doing. They only need enough cooperation to ensure that there will be propellant at the depot when NASA needs it. Trying to do space missions without propellant depots can waste lots of expensive equipment and propellant. With propellant depots you always get the maximum value out of each vehicle and drop of propellant. 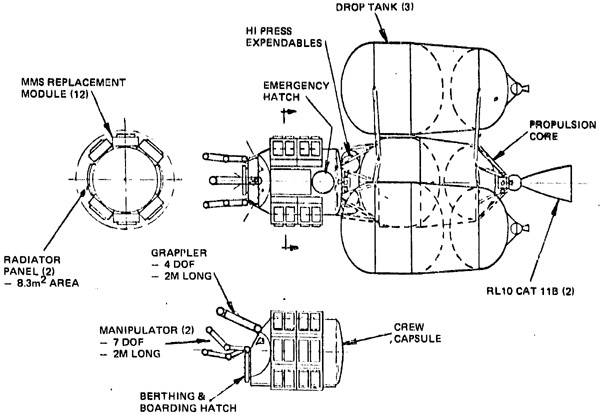 Without depots, each spacecraft stage is designed for the worst-case scenario. If the payload turns out to be lighter than expected or there is a favorable launch window or if the stage performs better than you feared, the end result is you have to throw away tons of expensive propellant at staging. What a waste! But with depots, if you have left over propellant, you can load it into the local depot at the end of the trip leg. ULA says "The excess performance at each step of the way makes propellant a kind of currency that can be applied to downstream needs." In other words: waste not, want not. Basically keeping the LEO depot topped off. The baseline plan is delivering about 30 metric tons per month. This can be done by a wide range of launchers and providers, which is a good thing. Insuring against interruptions of service by a single provider is always prudent. This will be a great area for startup companies, since accidentally blowing up a tank of liquid hydrogen is no great loss. At least compared to accidentally blowing up a $200 million communication satellite. With competition launch prices will drop with time. Because the LEO environment is so thermally hot compared to L2, you want to move propellant to L2 as fast as possible before it all boils away. Use it or lose it. Given the capacity of the LEO Depot, the baseline is a propellant transfer to L2 roughly every other month. This can be done with a dedicated ACES Tanker, or with the left-over propellant from Altair or Orion visits. 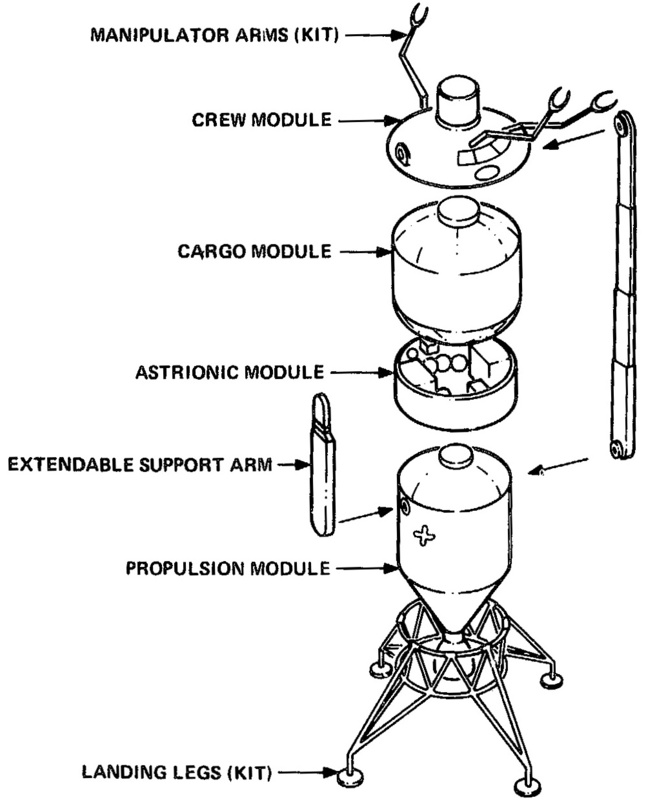 Since these craft can make the trip to L2 with propellant to spare, each trip is also a small tanker mission. For dedicated Tanker missions, roughly every third tanker launch will continue on to the L2 Depot (after topping off their tanks with 30 or 50 tons of propellant from the LEO Depot, depending upon the launcher). The Tanker then departs for L2 in a low delta V trajectory that consumes about 41 metric tons. The remaining 29 metric tons or so are added to the L2 Depot. There will be room for competition. If one of the service providers creates a tanker that uses an ion drive or other system allowing more propellant to be shipped, they will have a competitive advantage. 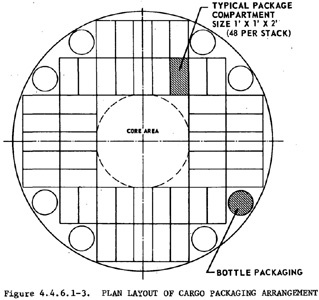 The most complex of the Logistics Stream commercial tasks is landing all the cargo on Luna. Before you can send any astronauts you are going to have to deliver tons and tons of cargo: rovers, radiators, solar power systems, gas handling and compressor systems, excavating equipment and other bulky cargo and consumables. Altair robot cargo vehicle discharging from the cargo stack, one rover at a time. 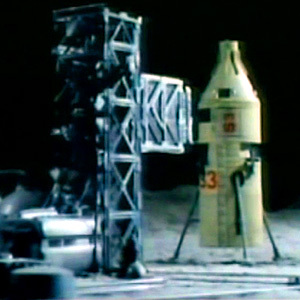 The top of the ramp is only one meter above the lunar surface. The Altair's landing gear has wheels, so that the vehicle can be towed to a tank farm or something like that. The robot ACES/Altair is boosted into LEO by a Delta IV HLV rocket. Altair has a mass of 36 metric tons. After refueling at LEO Depot it travels to L2, delivering about 30 tons of combined vehicle and cargo mass. The usual cargo will probably be less than this, meaning there will be residual propellant that can be added to L2 Depot's stash. If the Altair is intended to be cached at L2 for future crew use, it will deposit all its propellant into the depot for efficient long term storage. 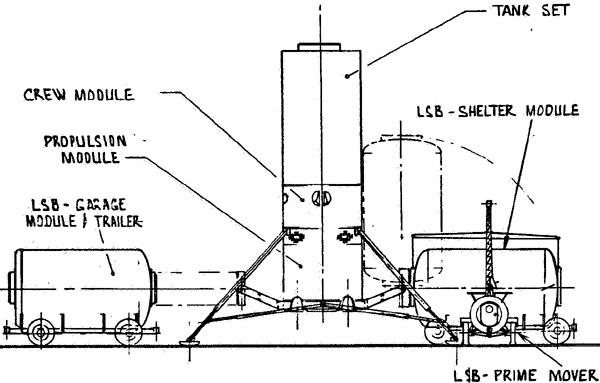 Before the ACES/Altair performs a lunar landing it will load or top off its propellant tanks, including the Ascender tanks (if Ascender is present). 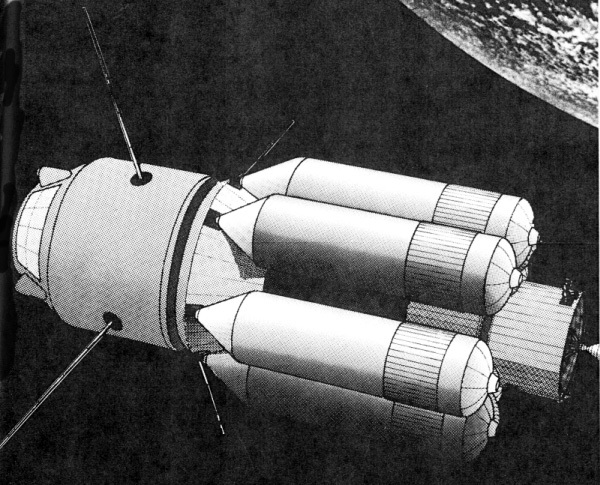 The Altair fully loaded can deliver a combined mass of vehicles (such as the Ascender), cargo, and residual propellant greater than 40 metric tons to the lunar surface. 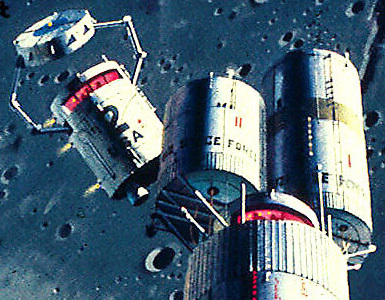 The ACES/Altair proper never returns from the lunar surface, though the separate Ascender can transport astronauts back to L2. 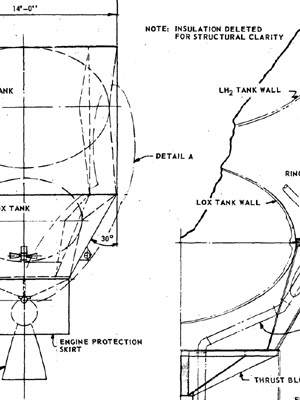 On the surface, the ACES/Altair's propellant tanks can act as storage tanks. LH2/LOX is not very useful as propellant at a lunar base, but it is very valuable to feed fuel cells, or to store the output of regenerative fuel cells. 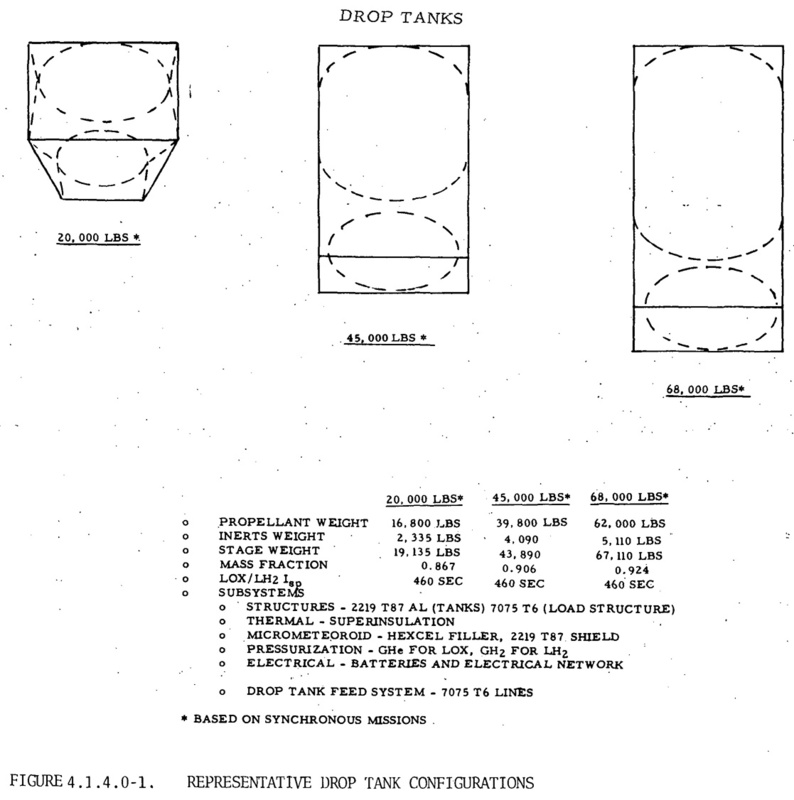 The tanks can also be fed from residual propellant from future ACES/Altair landings. "Tank farms" of landed ACES/Altair can be made, since the vehicles can be towed to be adjacent to other vehicles due to the little wheels on the landing gears. As a nice bonus, the Altair will be tested again and again via robot landing, so all the dangerous bugs can be worked out before it is used to land actual human beings. The Crew Stream will be under NASA control, but will use much of the same equipment. Especially the ACES 41. 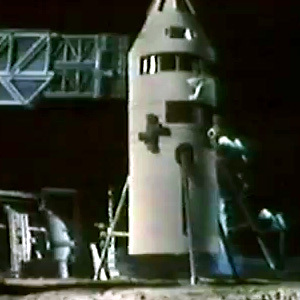 Once the robot Altairs have delivered enough supplies and equipment to the lunar base site such that astronauts can actually live there, it is time to transport the crew to luna. The ACES/Orion crew vehicle will be launched on an Atlas booster. 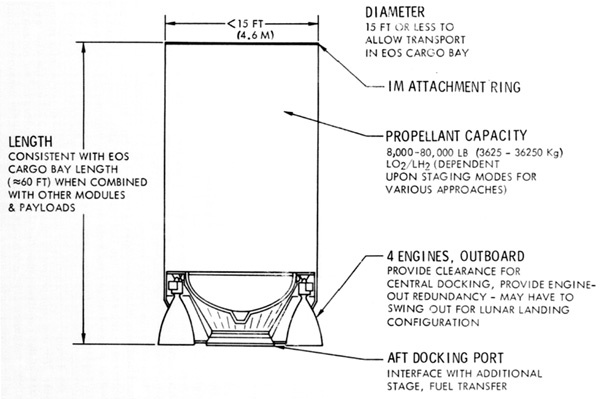 The booster can deliver 11 metric tons of mass to LEO, enough for an ACES 41 and an Orion. 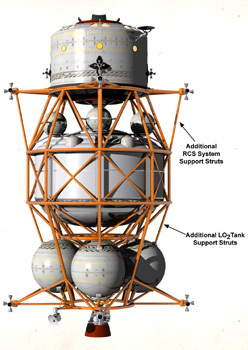 The ECLSS Module, cargo, and crew will be delivered on a separate flight. 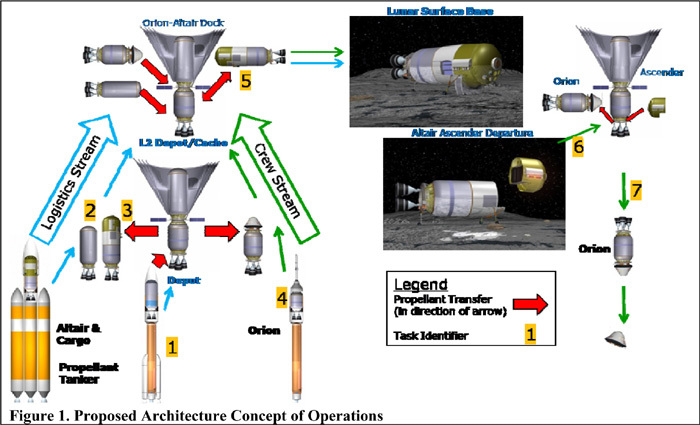 Once assembled and fueled, the ACES/Orion can travel to L2 in about 4 days using a high delta-V transfer. Upon arrival all propellant is transferred to the L2 Depot because it has better boil-off prevention. The Orion's station keeping, power, and other services are provided by the depot. A previously delivered crew ACES/Altair with an ascender module is prepped for the descent. 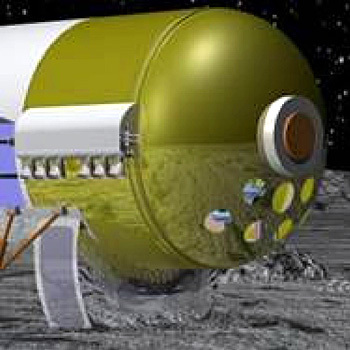 Very little cargo will be carried because [A] there is a mountain of cargo at the site already, delivered by robot Altairs, [B] you want the crew Altair to have a very high performance margin so it can escape from disasters during the descent and [C] the residual propellant also sets the duration of the surface stay, since the propellant is also the astronaut's breathable oxygen and fuel for the fuel cells. 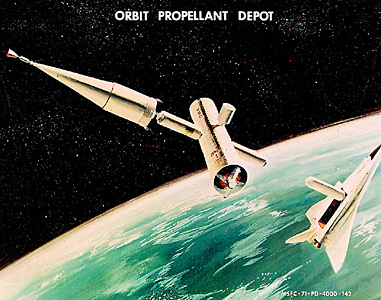 With a nominal landing, there should be about 10 metric tons of residual propellant. 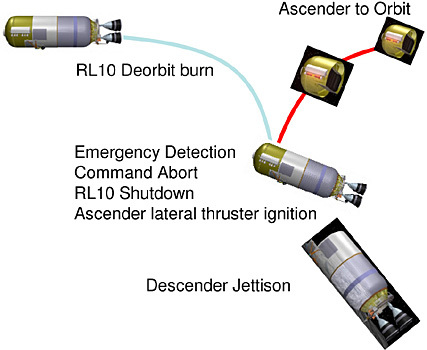 The descent is powered by the main RL10 engines. As the lunar surface nears, the Altair rotates and switches to the banks of 4,500 Newton lateral thrusters to hover and land. 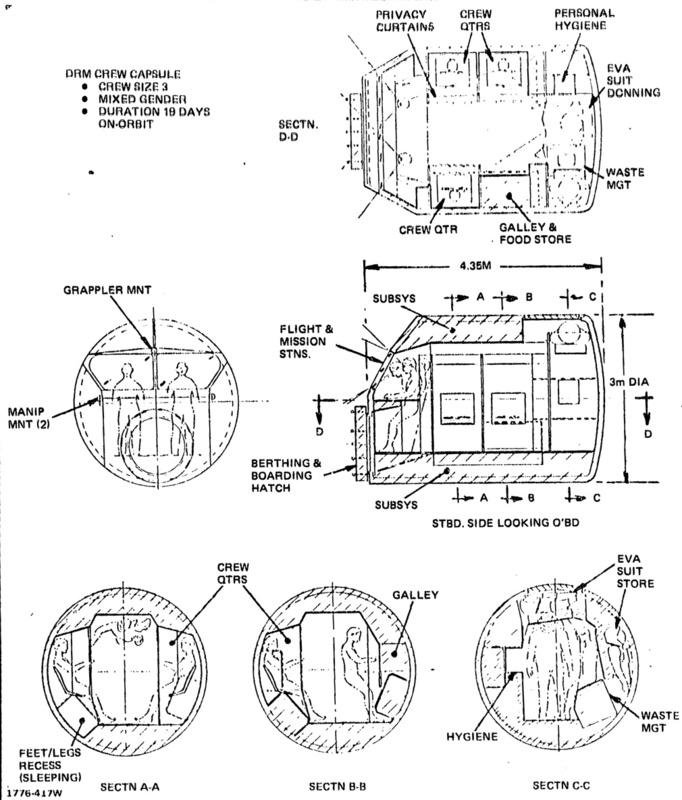 Once landed, the side cargo hatches can be opened, and the "bomb-bay"style airlock deployed from the belly. 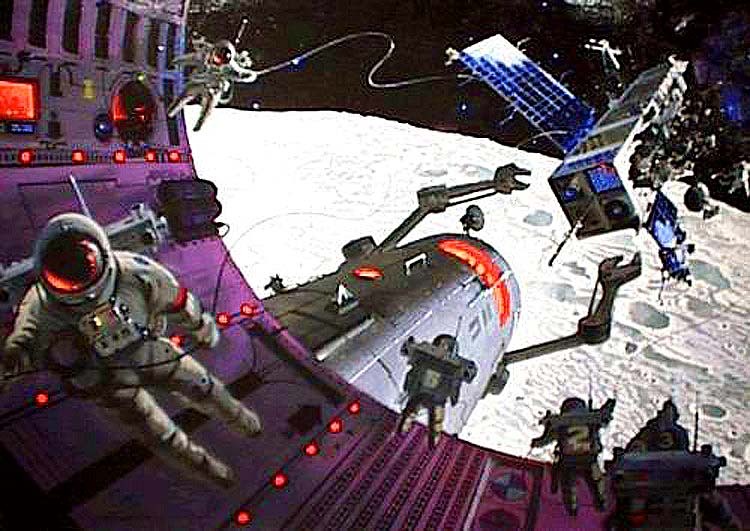 If an emergency occurres during the descent, the ascender module can separate and carry the crew back to L2 while the Altair falls to its doom. The cargo elevator allows the crew to access the cargo (shown in violet) at chest height. 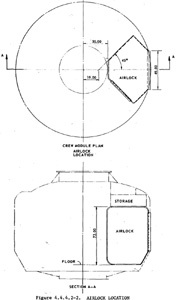 Foil area at bottom is the "bomb-bay" inflatable airlock. The belly-landing aspect plus the forward downward facing windows give the pilot an unimpeded view of the landing site. With tail landers, the pilot cannot see the landing site at all. 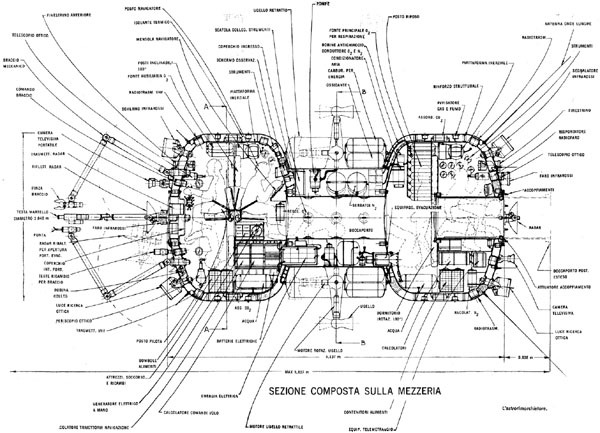 The crew cabin accommodates four astronauts on the lunar surface. It includes a large soft-shell airlock at ground level. 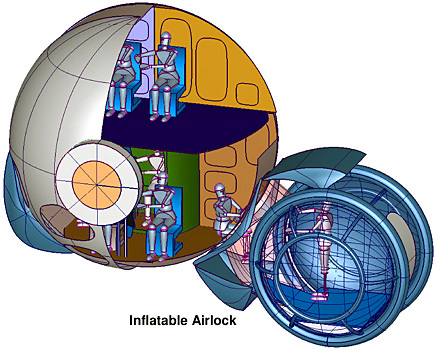 This is an alternative to the "bomb-bay" type inflatable airlock. The DTAL can be equipped to be a wet workshop, retrofitting the spacious propellant tanks to be habitat modules for a lunar base. The Ascender module uses banks of 4,500 Newton lateral engines burning the same LH2/LOX that everything else uses. 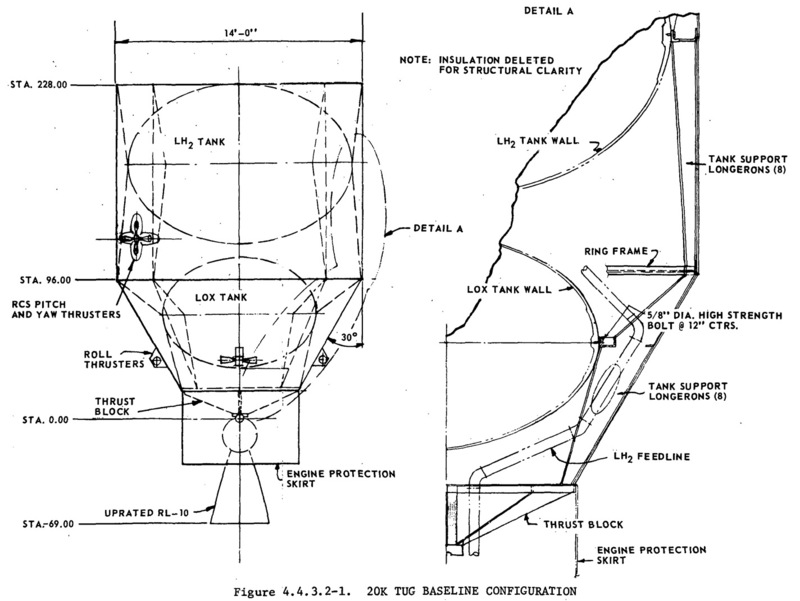 The lateral engine propellant tanks are only filled shortly before lift-off, since the main tanks have superior boil-off resistance. This does lose a couple of kilograms of propellant due to tank chilldown, but more would be lost by boil-off. Each bank has 12 small engines that are throttled to about 30% power. They are located such that they can accommodate substantial differences in the ascender's center of gravity (easy with 12 small engines, hard with one large engine). The exhaust is angled such that it does not incinerate the Altair that is left behind, future expeditions can use it. 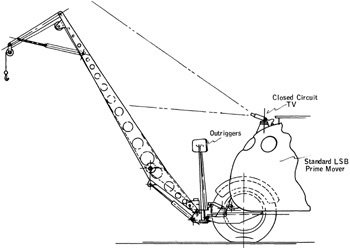 The ascender travels to the L2 Depot, docks, and dumps its residual propellant into the depot. It will be reused, being attached to a newly arrived ACES/Altair. The lateral thrusters are placed so to minimize the exhaust plume damaging the left-behind section. The crew from the Ascender module transfer to the ACES/Orion that brought them. The tanks are filled and it travels to Terra. It only needs 10% of propellant capacity for the trip. 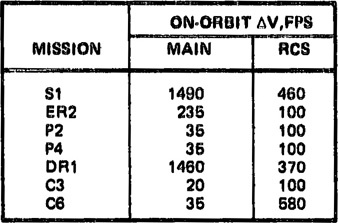 The delta V cost is so modest that the trajectory can be initiated with the RCS instead of the main RL10 engines, not that you'd want to do that. Artwork and design by William Black. Click for larger image. 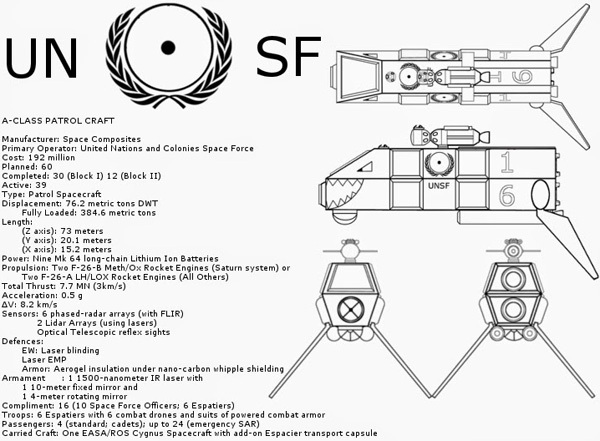 Light Freighter for intraorbital service between space colonies and industrial platforms, designed for the System States Era of my Orion’s Arm future history setting. 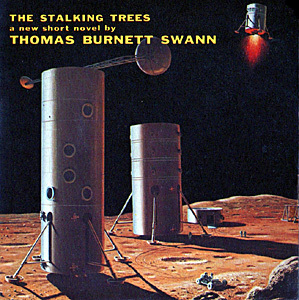 In the System States Era asteroid mining operations thrive throughout the asteroid belt and among the moons of Jupiter and Saturn the Martian terraforming program has left legacy: a sprawling archipelago of island stations and industrialized moons, Bernal Sphere's and O'Neill Cylinders, Spindle and Wheel cities, and a population of humanity growing into the millions. Space colonies are independent city-states and trade is their lifeblood. Entire generations are born and live their lives in spinning cylinders, bubbles, and torus shaped habitats, harvesting, mining, and fabricating all they need from the environment of the outer solar system. 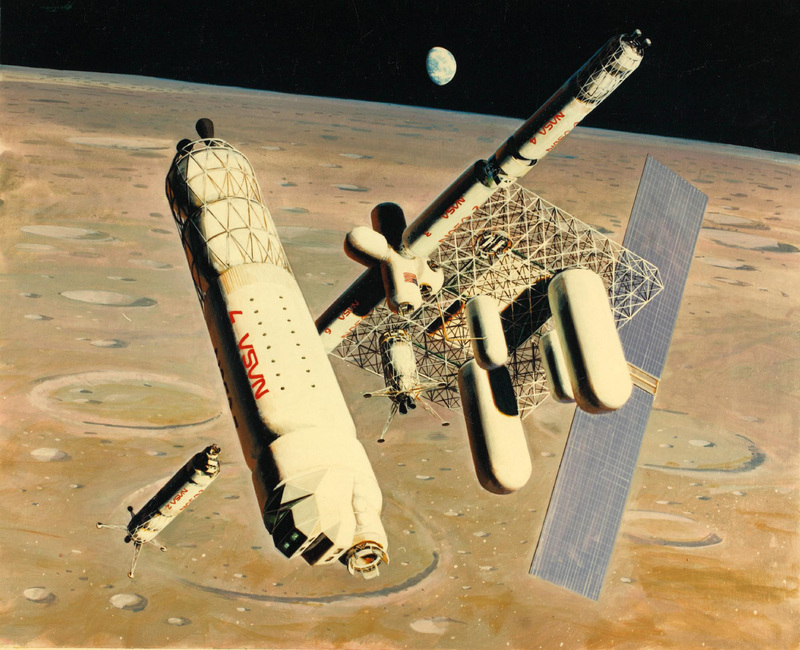 Orion and Medusa style nuclear pulse freighters haul payloads of raw materials across interplanetary distances, while nuclear orbital transfer vehicles (OTV’s) provide light freight and passenger service between space habitats in Jupiter and Saturn orbit. 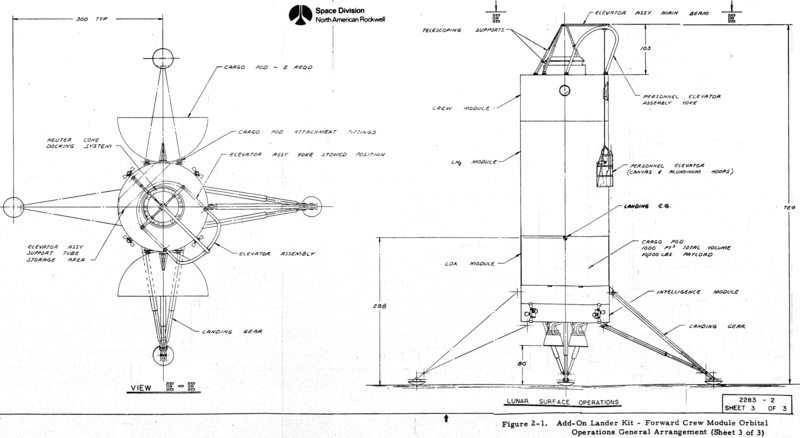 Why Saturn on Winchell Chung’s Atomic Rockets site. Scroll a little further down the page and you will find a Synodic Periods and Transit Times for Hohmann Travel table for Moons of Saturn. The abundance of various chemical ices for use as reaction mass among the moons of the outer system gas giants makes NERVA an excellent option for commercial application. 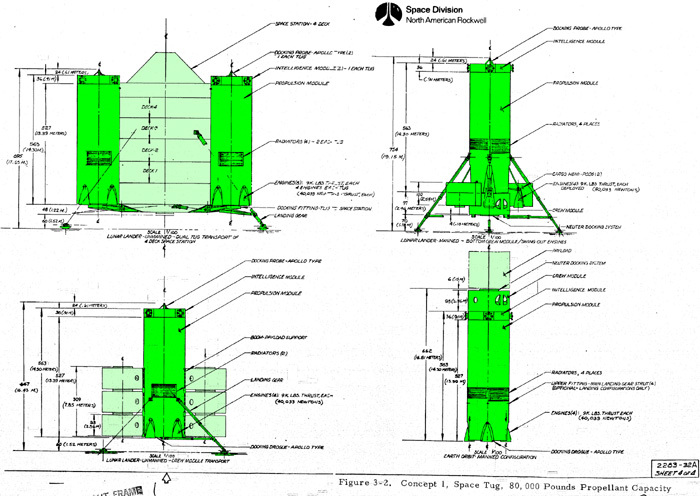 Nuclear thermal rockets provide excellent efficiency; they also impose certain operational restrictions. 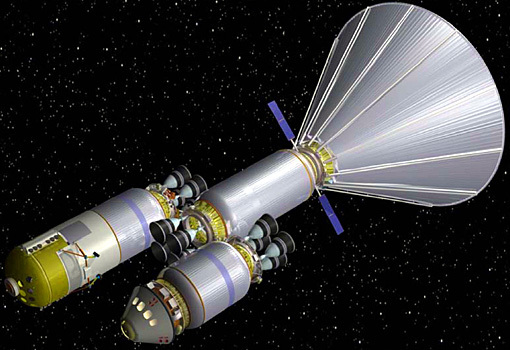 The engine emits significant levels of radiation while firing and even after shut-down, and while passengers and crew are protected by the engines shadow-shield and hydrogen tanks, you wouldn’t want to point the engine at other spacecraft or space platforms. 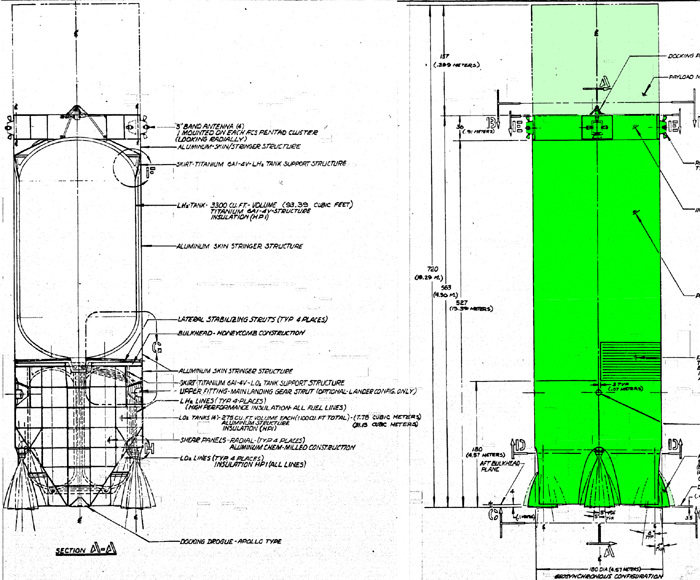 During the U.S. nuclear thermal rocket engine development program NFSD contractors had recommended that no piloted spacecraft approach to within 100 miles behind or to the sides of an operating NERVA I engine. 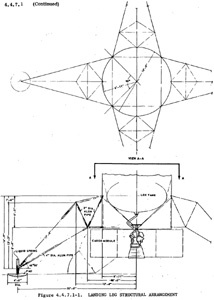 The only safe approach to a spacecraft with a NERVA engine is through the conical “safe-zone” within the radiation shadow created by its shadow-shield and hydrogen tanks. 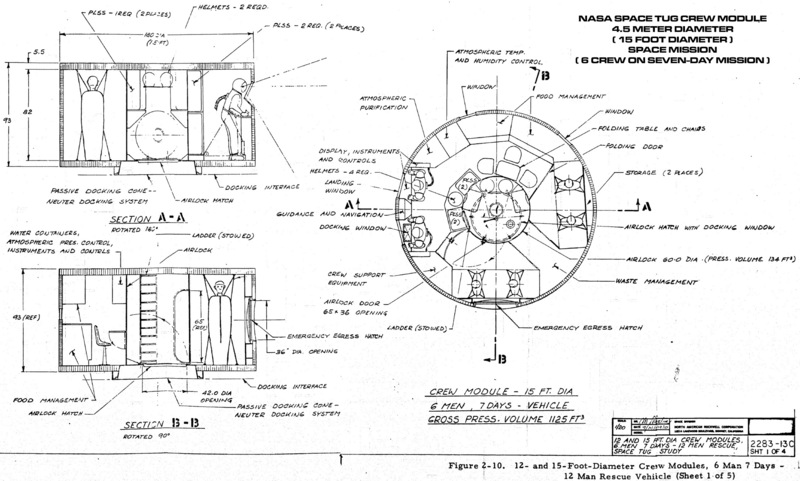 Docking NERVA propelled spacecraft to a space station or habitat is problematic because structures protruding outside the conical safe-zone can reflect radiation back at the spacecraft, irradiating the passengers and crew. These facts impose a set of mandatory operational parameters and flight rules for nuclear operation. An exclusion zone for nuclear propulsion (60 kilometers minimum) is imposed around every orbital platform. Orbital Guard units would hold broad discretionary powers—violate an exclusion-zone or disregard traffic-control and the local guard will cheerfully vaporize your spacecraft. No warning shots, no second chances. A crew that violates flight rules doesn’t live long enough to worry about fines or attorney fees, and the public’s time and funds are not wasted with trials of incompetent captains and crew. 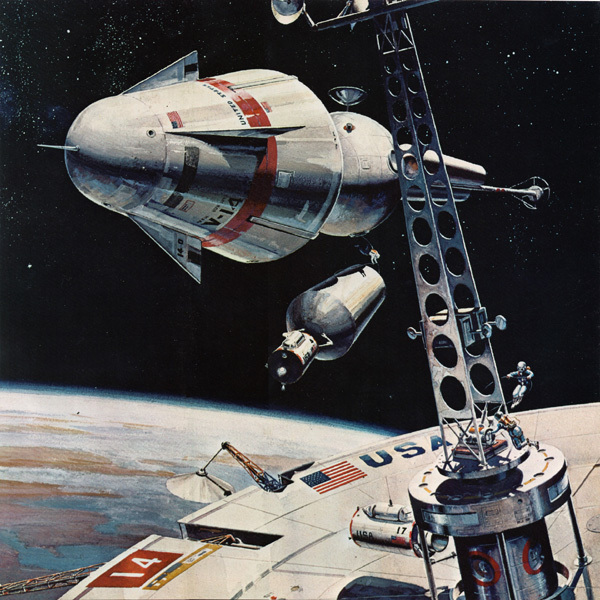 Nuclear Freighters “park” propulsion modules in station-keeping orbit with their destination, and the freight/passenger module undocks, separating from its nuclear propulsion module, proceeding to birthing under thrust of a chemical maneuvering unit. 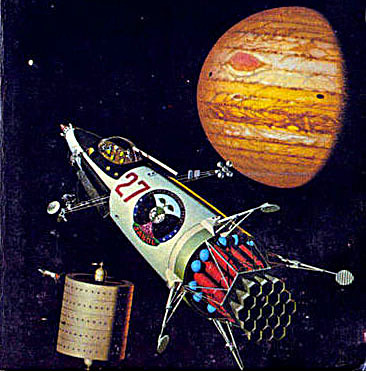 Because the nuclear propulsion modules are valuable, and are potentially deadly missiles if mishandled — codes to access the autonomous flight computer and possession of the nuclear propulsion module are temporarily handed over to the local orbital-guard for safe keeping. 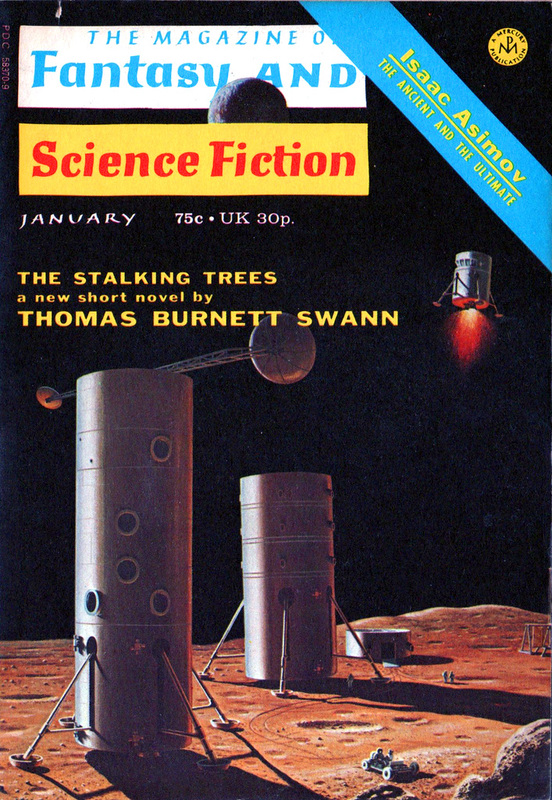 For a good example of Space traffic control see the entry on Winchell Chung’s Atomic Rockets site here and scroll down to quote from Manna by Lee Correy. At this point in my future history, 750 years post Martian colonization, spacecraft are essentially stacks of common modules which can be swapped out to suit application. Independent Operators, like today’s truckers, might “own” only the CMOD (Command Module) with other units being leased per flight. 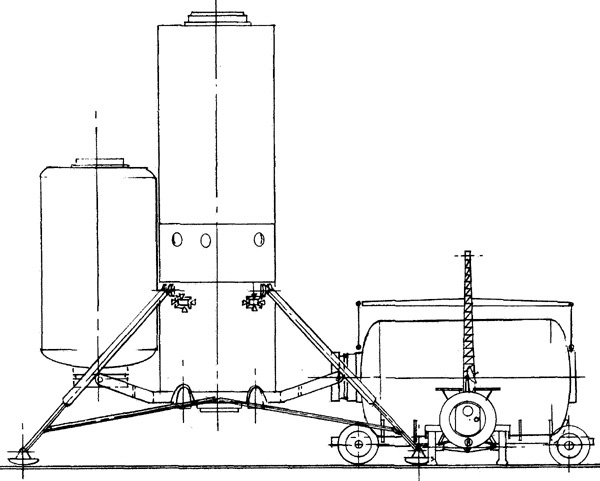 The Freight Carrying Structural Spine, essentially a rigid frame with mountings for cargo modules, might be leased by the shipper and loaded with cargo (but owned by a separate freight transport supplier) and since different payloads mass differently it might be the responsibility of the shipper to lease suitable nuclear and chemical propulsion modules rated to the task. Passenger transport services might likewise lease passenger modules of varying capacity and Transport Brokerage firms would coordinate freight and passenger payloads assigned to same destinations and offer these in an open-bid market. 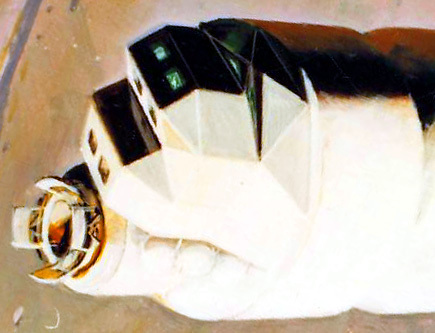 Different payload masses require different propulsion module configurations, the light freighter detailed here requires only a single Solid-Core nuclear thermal rocket. 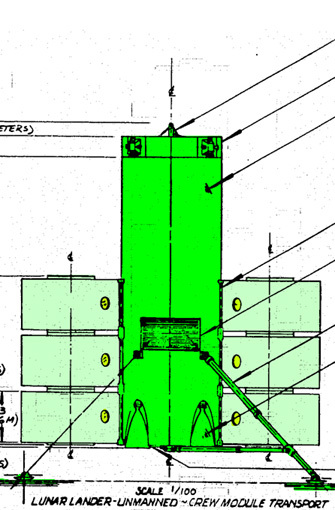 A heavy payload freighter might use clusters of solid-core, or Open-Cycle Gas-Core, nuclear thermal rockets. 3D models are my own conception based on various real-world proposals. 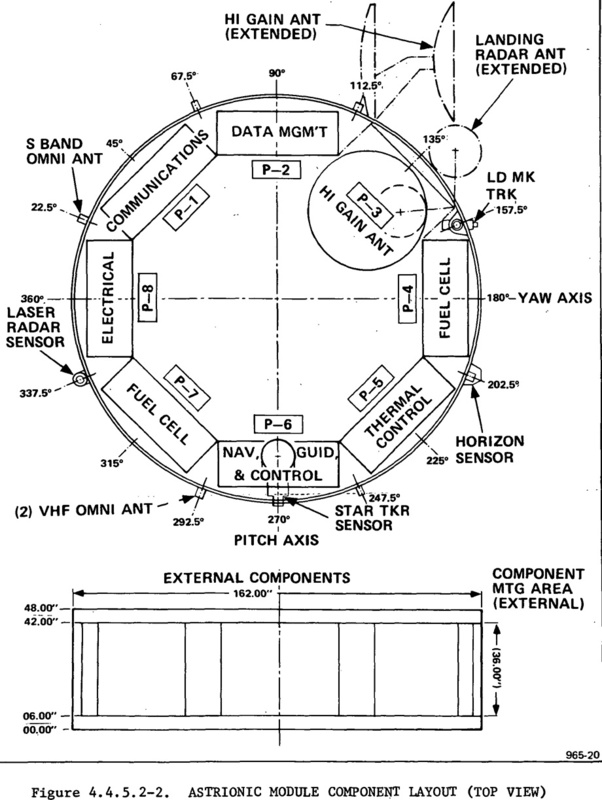 As research for the passenger/crew module I studied the POTV (Personnel Orbital Transfer Vehicle) pages 86-96 from NASA Technical Memorandum 58238 Satellite Power System: Concept Development and Evaluation Program Volume VI1 -Space Transportation available: here. Propulsion for my light freighter is a Solid-Core NERVA Derivative, details available here. 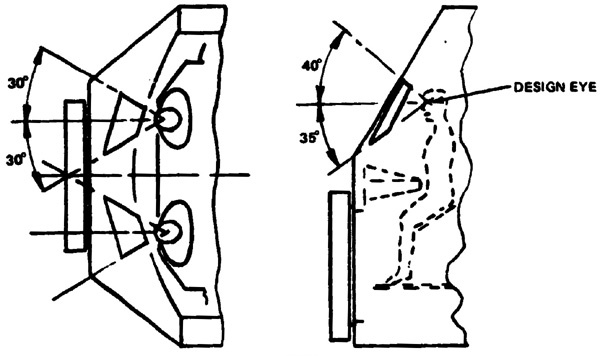 In conversation Winchell Chung suggested the modification Cascade-Vanes: details available here. Artwork by Don Davis for "Icarus Descending" (1973). 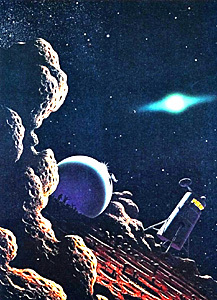 In the story the tug is delivering a large nuclear device (helpfully labled "DANGER") in order to divert the asteroid Icarus from a collision with Terra. Note the shields preventing the plume from the attitude jets from damaging the hull.